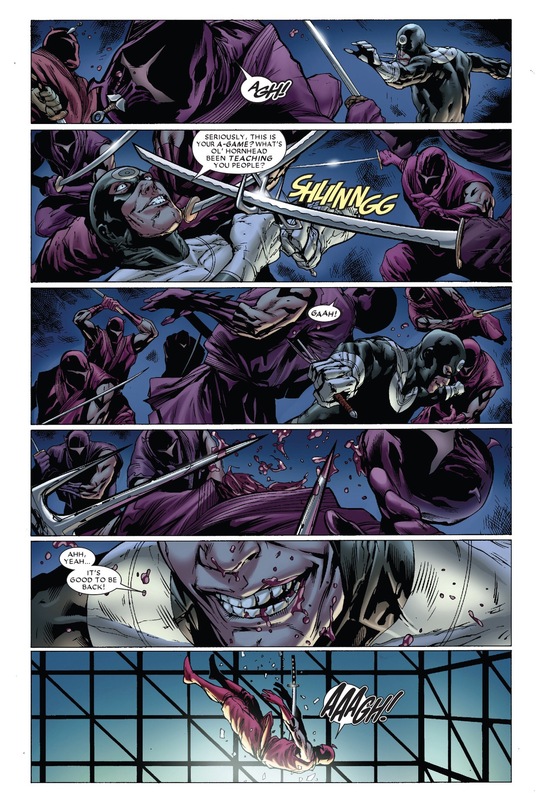 They are called The Hand – An organization of ninjas, thieves and assassins. 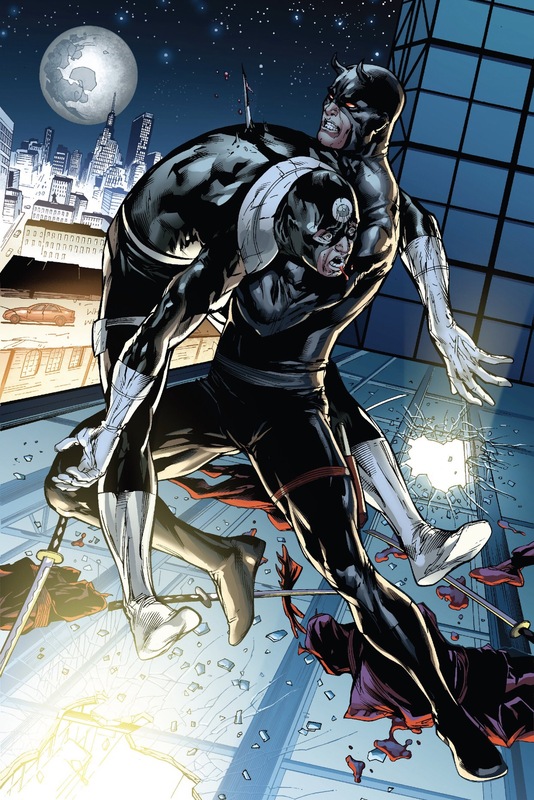 Originally banding together 800 years ago to fight off the oppressive system of feudal Japan, The Hand turned to corruption and darkness when the mutinous Snakeroot Clan seized power. 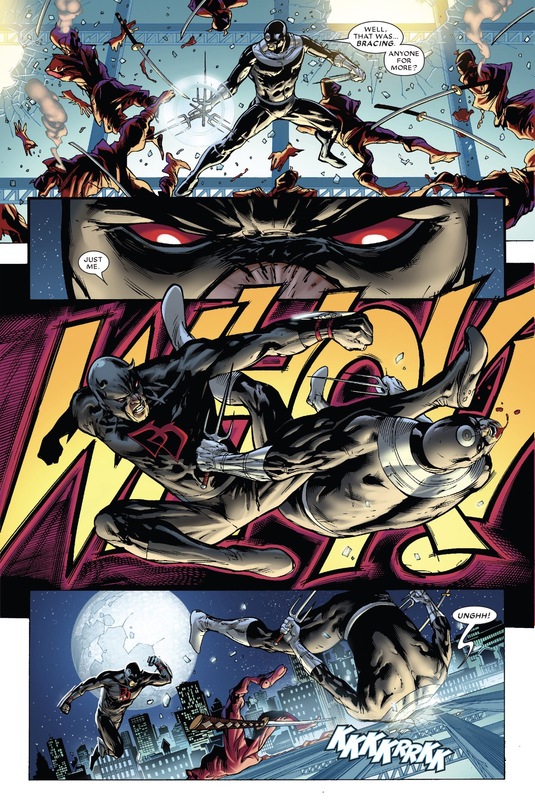 Over the years, they’ve come into conflict with many super humans – Spider-Man, The Avengers and the X-Men to name a few – but none of the feuds compared to their war with Daredevil. 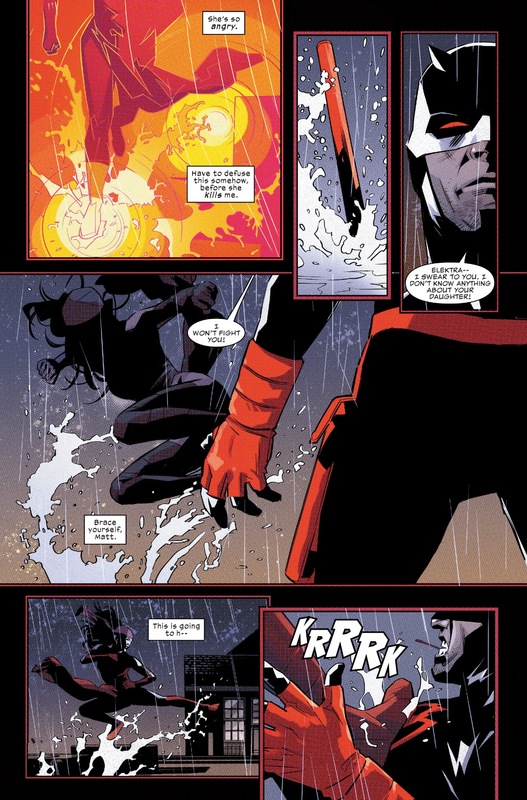 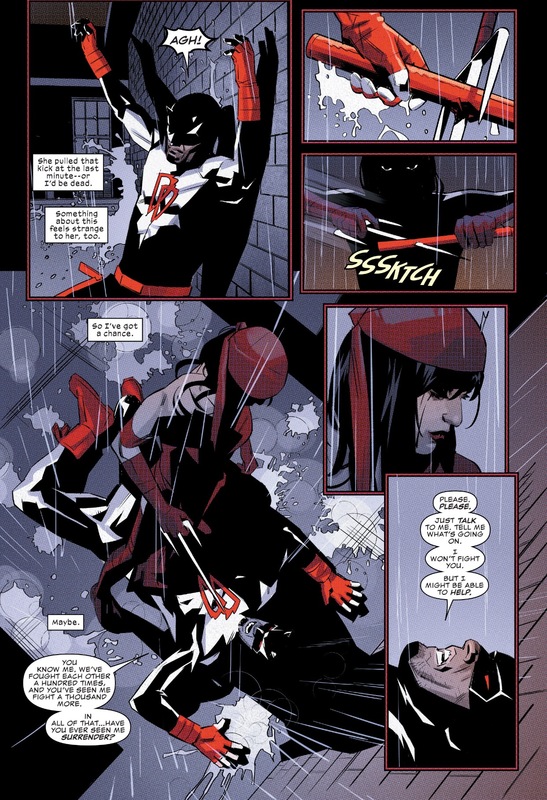 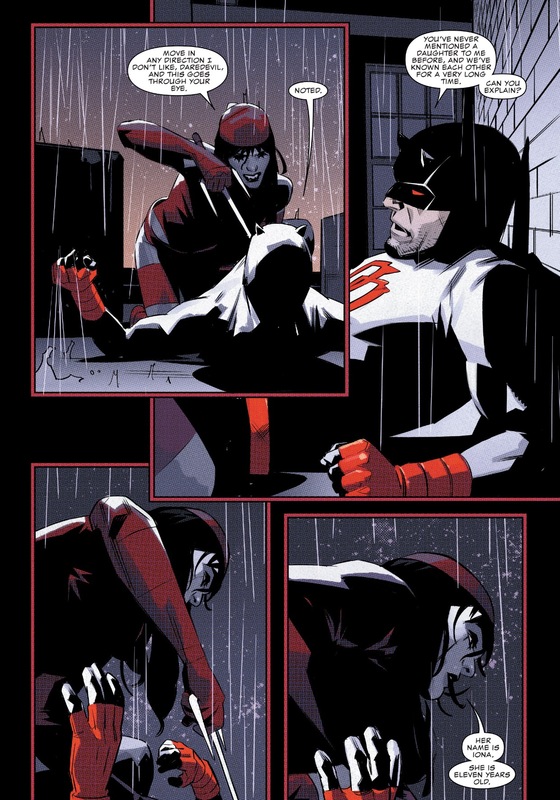 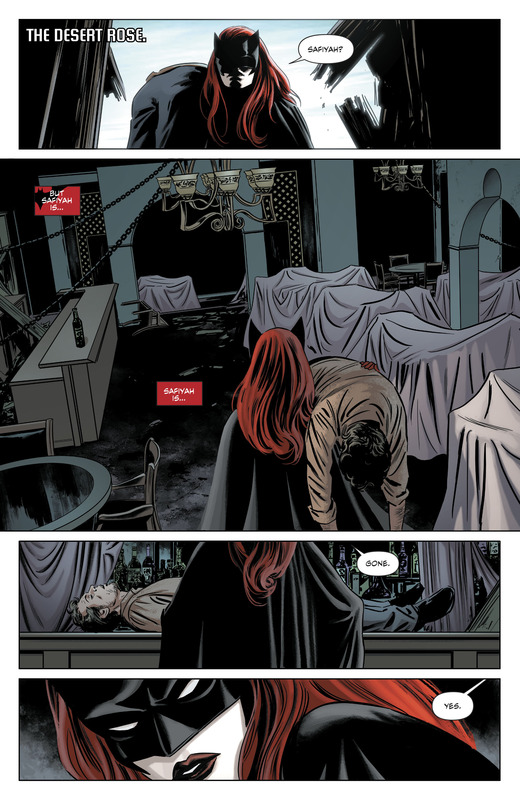 Matt Murdock’s ties to The Hand run deep; his mentor, Stick, died trying to destroy The Hand, and his former lover, Elektra, served The Had as an assassin for many years, nearly losing her soul in the process. 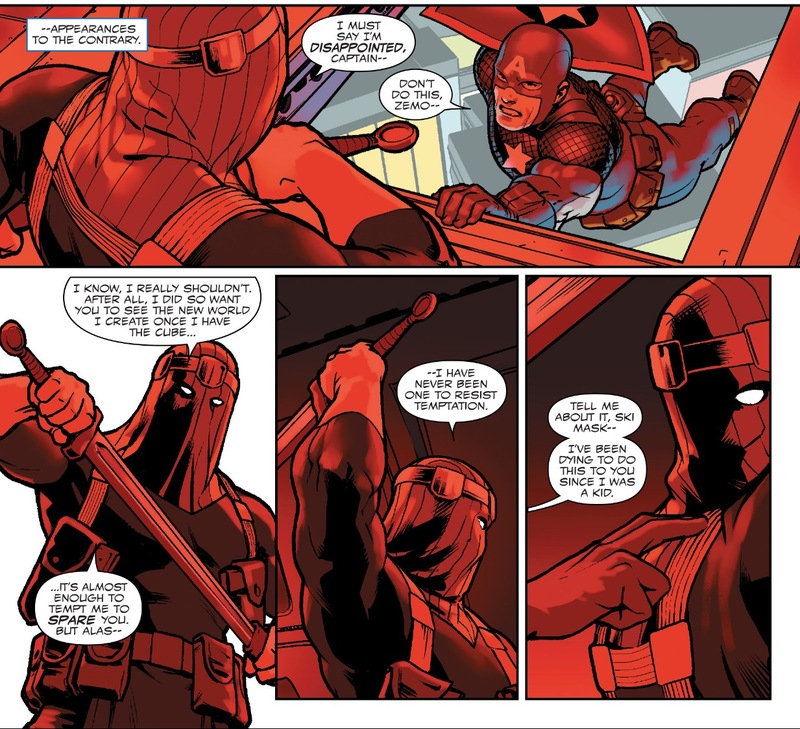 So when The Hand sought Daredevil out to become their new leader, he was understandably confused. 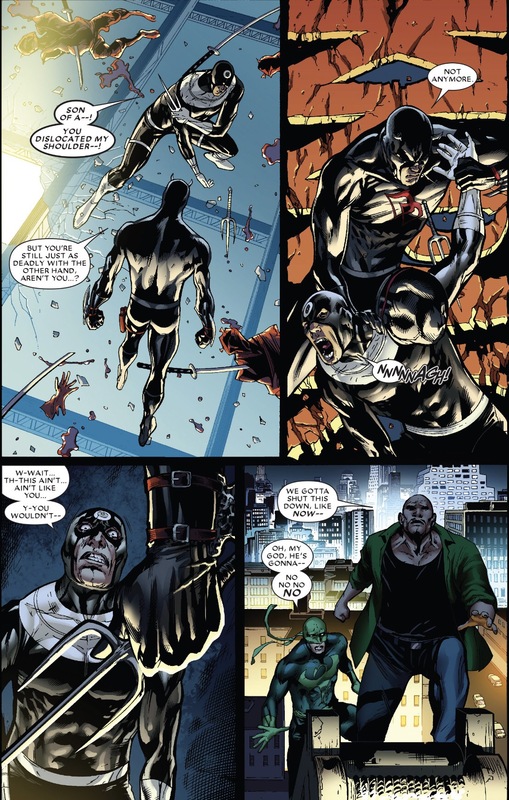 He initially rejected their offer, but eventually consented, plotting to use the organization as a force for good When his arch-enemy Bullseye destroyed a city block – and killed 107 people in the process – Daredevil resolved to turn The Hand into an army of protectors. 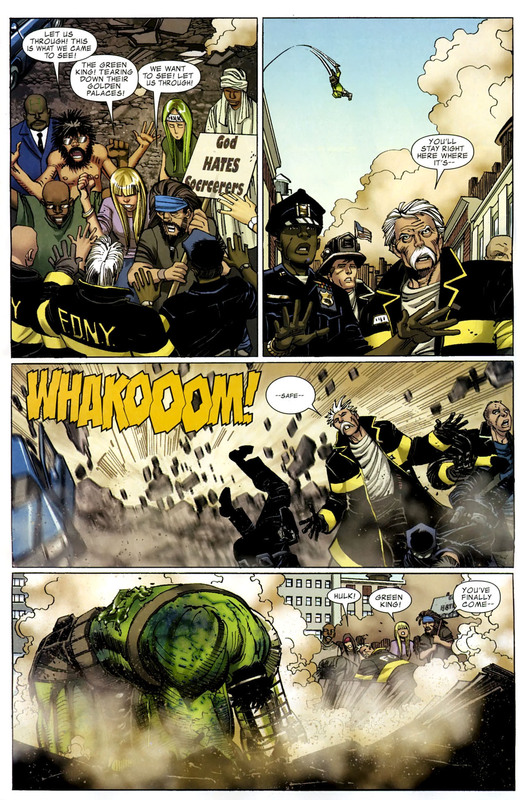 Over the ensuing months, they’ve confronted crime and corruption on the streets of New York – with brutal force. 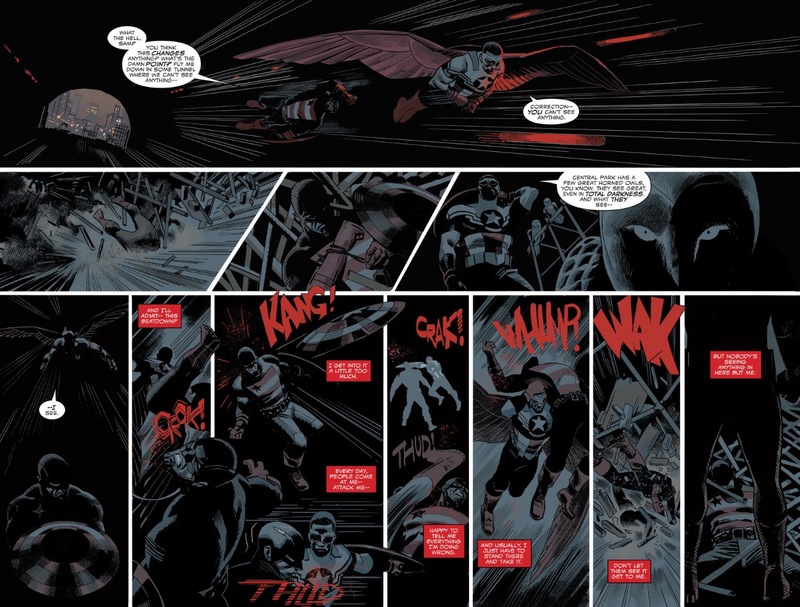 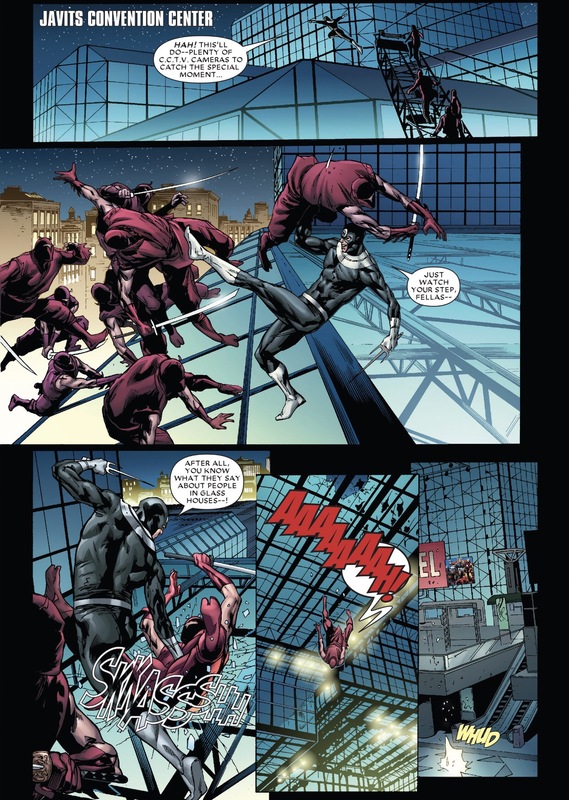 As Daredevil’s power within the group has grown, so has his willingness to push the limits in order to keep the peace. 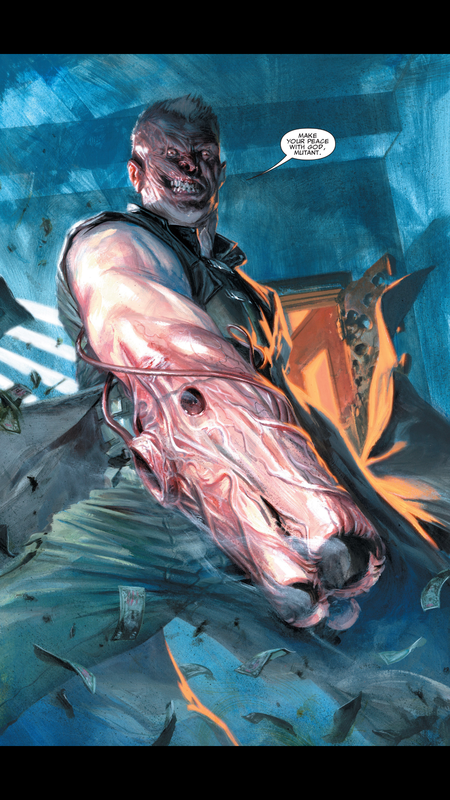 He sought to change The Hand but it appears The Hand has changed him. 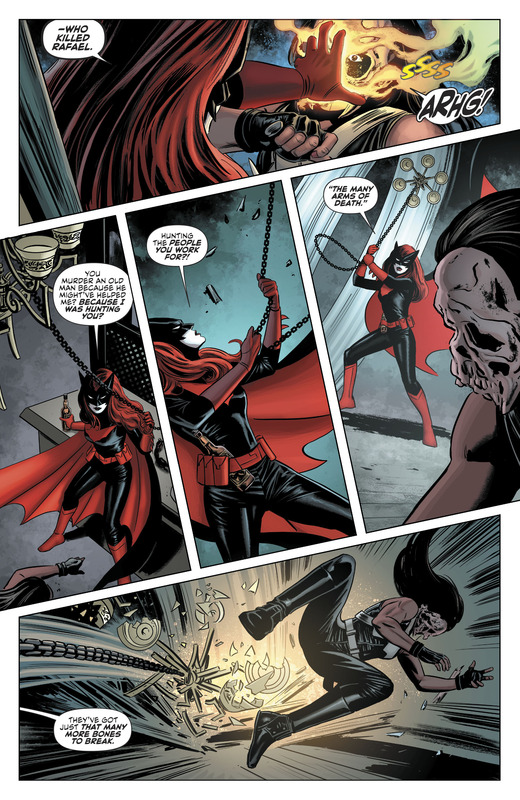 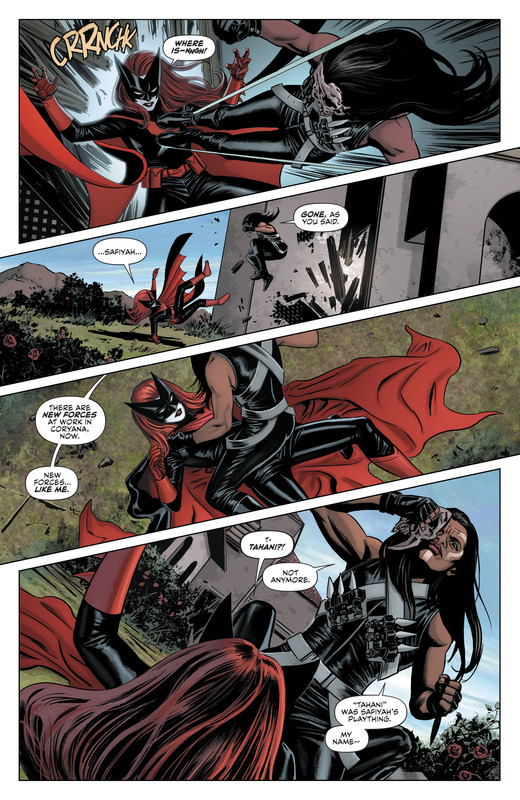 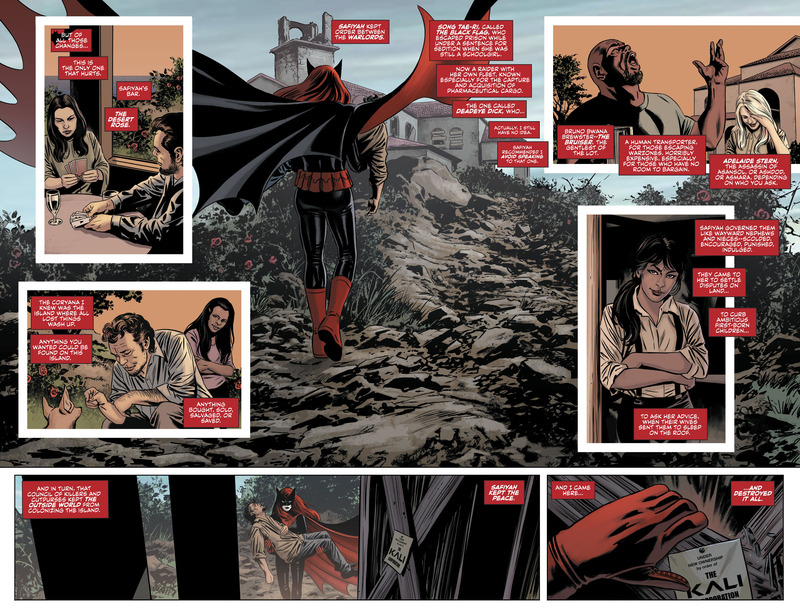 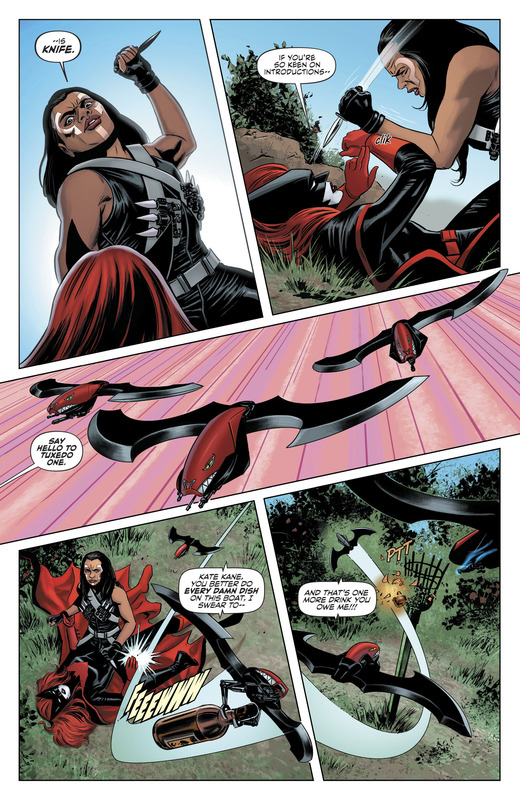 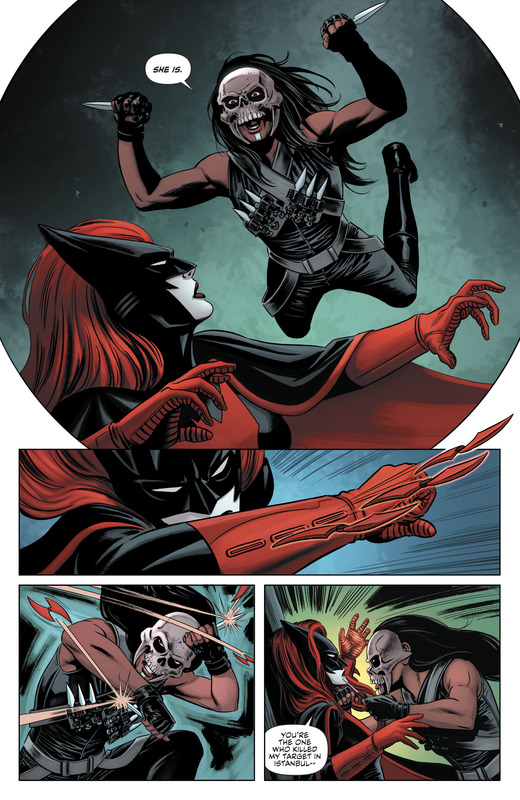 This entry was posted in Batwoman, DC Comics, Kathy Kane, Versus and tagged Batwoman, Knife on April 20, 2017 by lowbrowcomics. 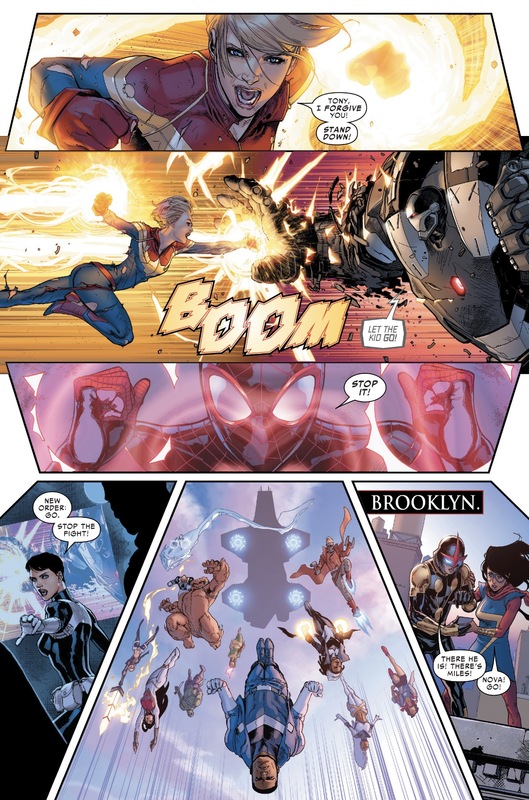 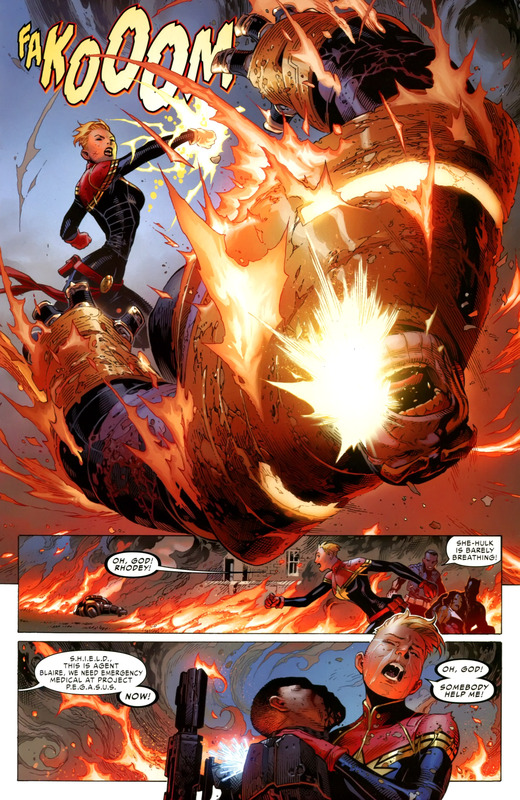 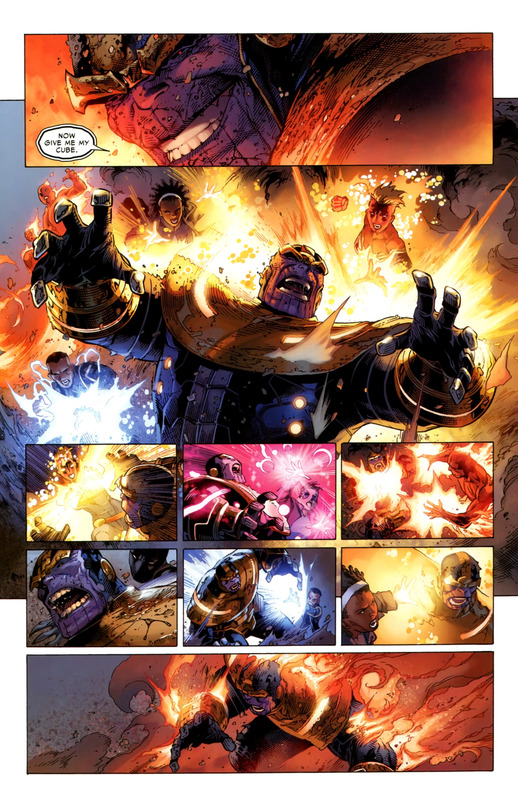 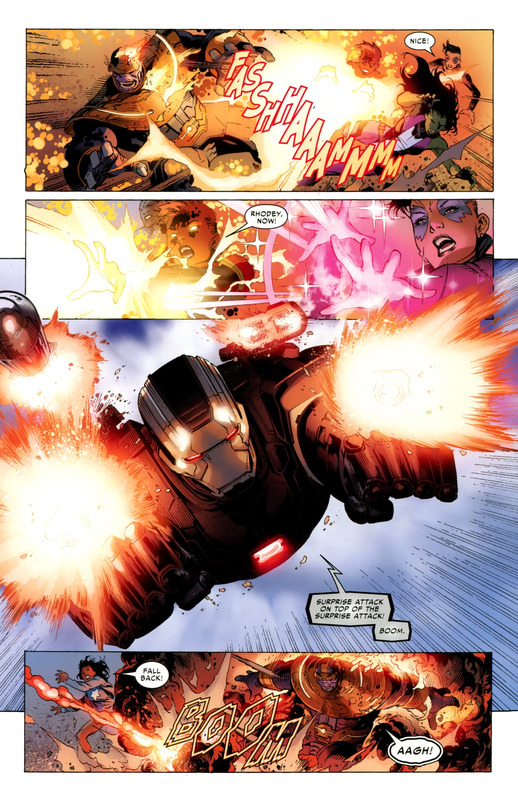 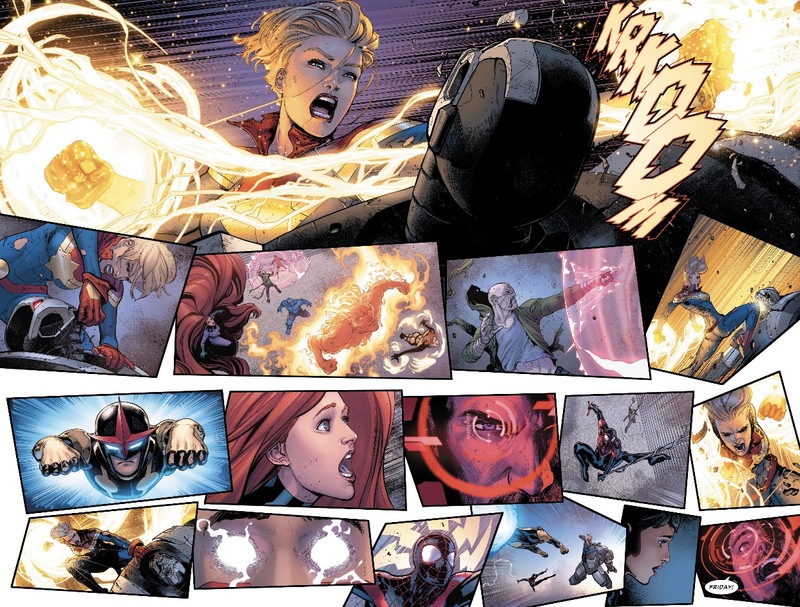 This entry was posted in Avengers, Captain America, Captain Marvel, Carol Danvers, Civil War II, Iron Man, Marvel Comics, miles morales, spider-man, Versus and tagged captain marvel, carol danvers, Civil War II, iron man, spider-man on March 14, 2017 by lowbrowcomics. 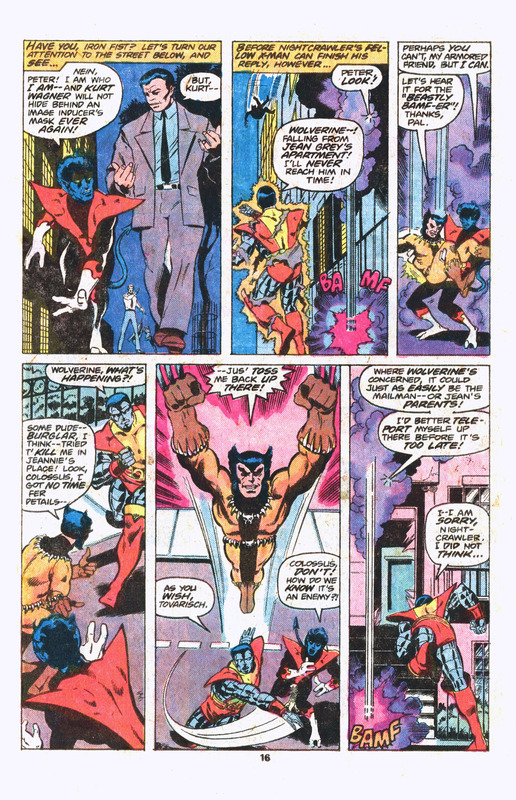 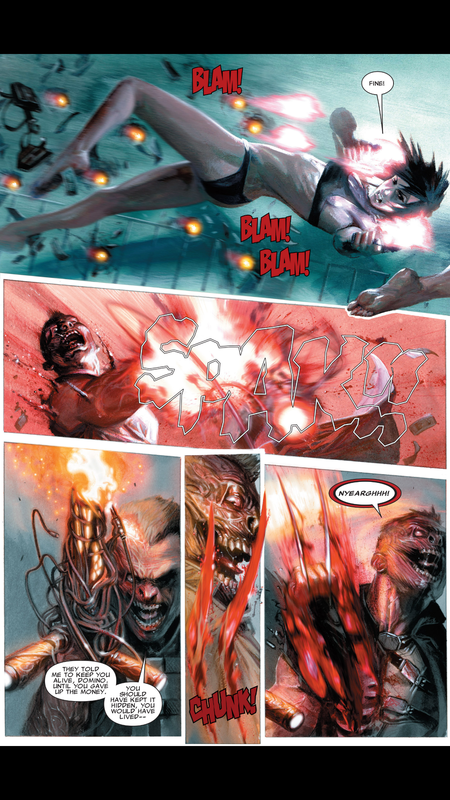 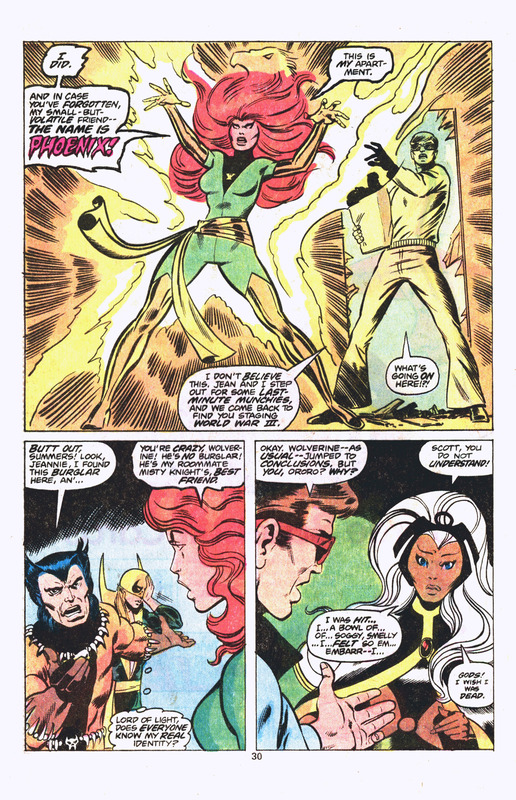 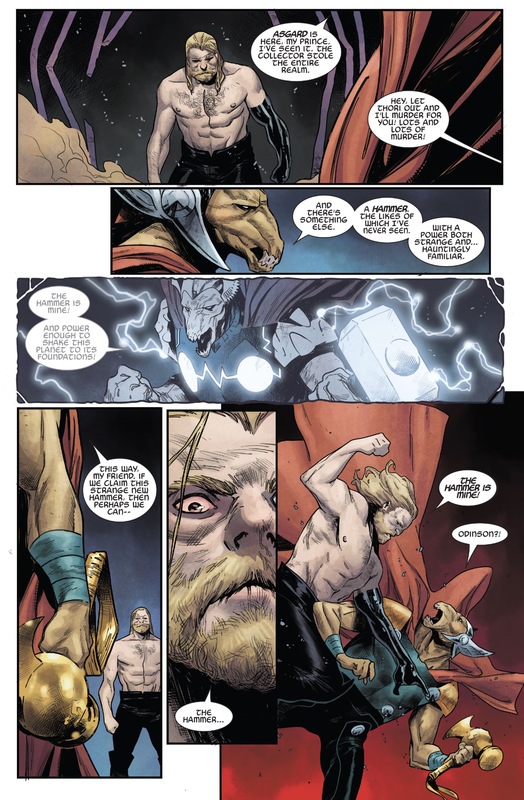 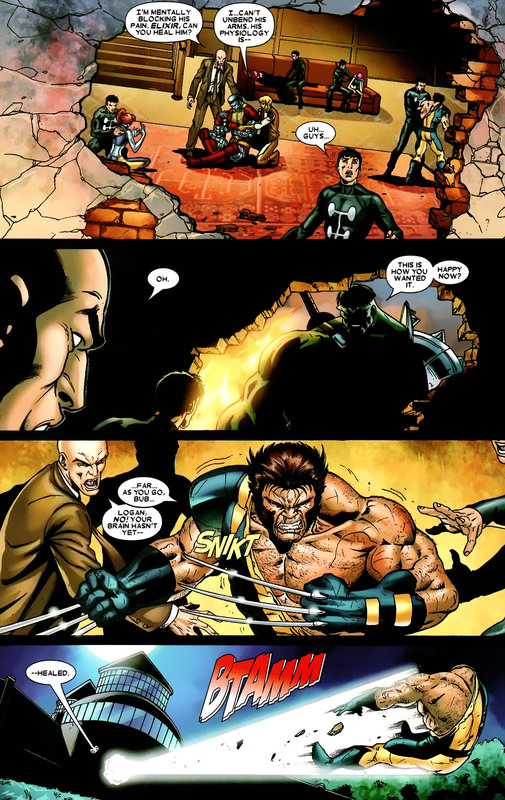 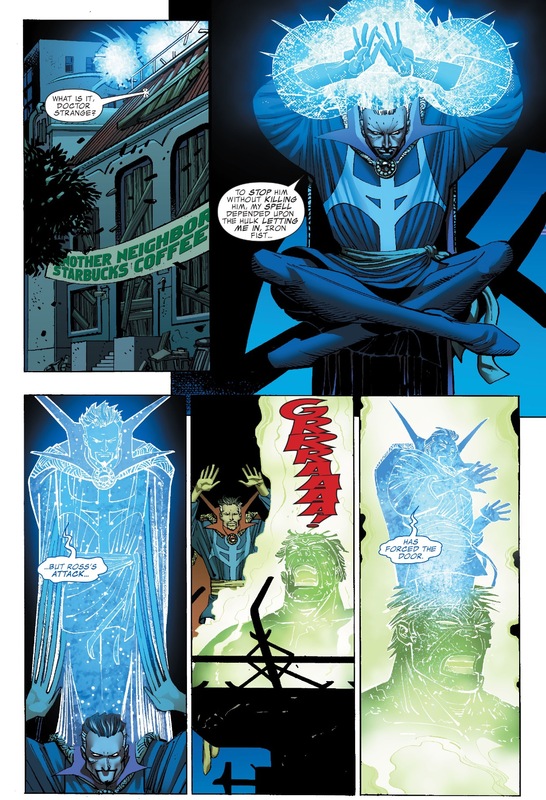 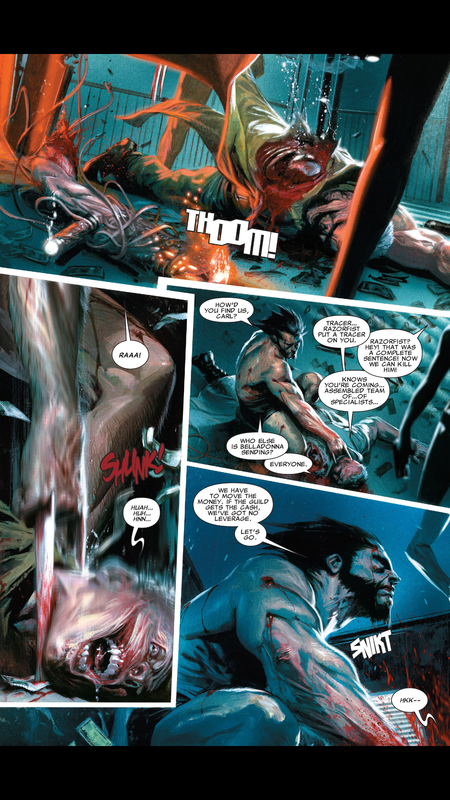 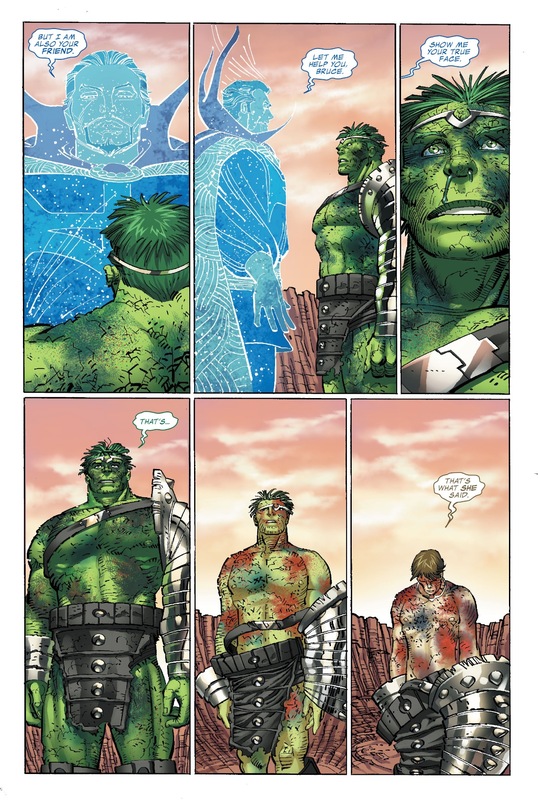 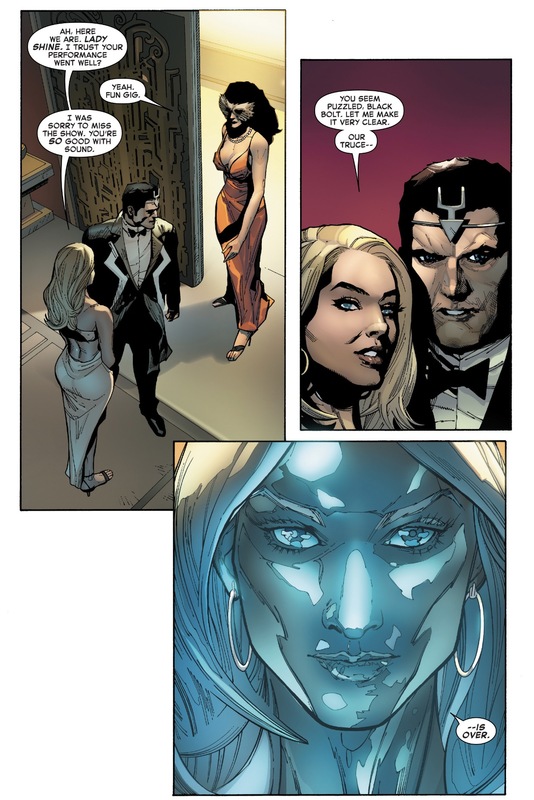 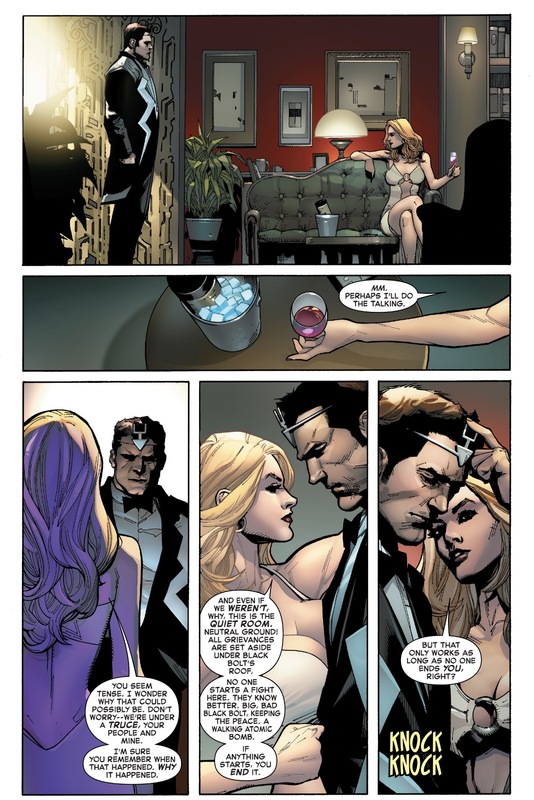 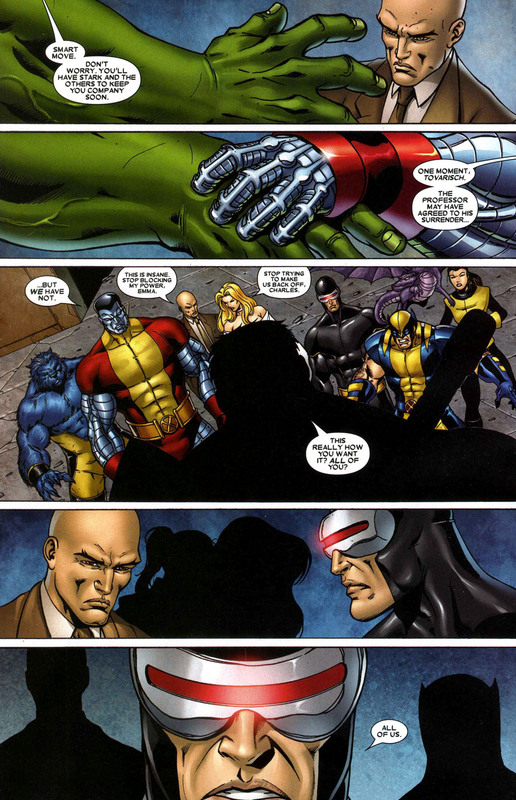 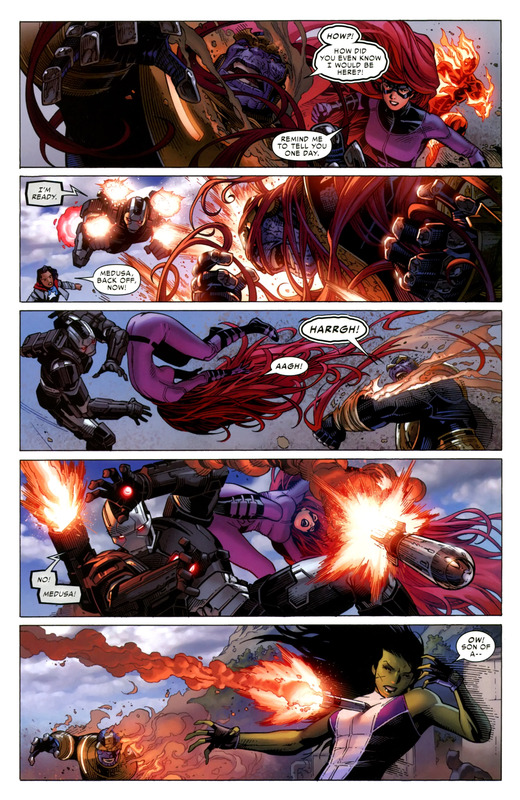 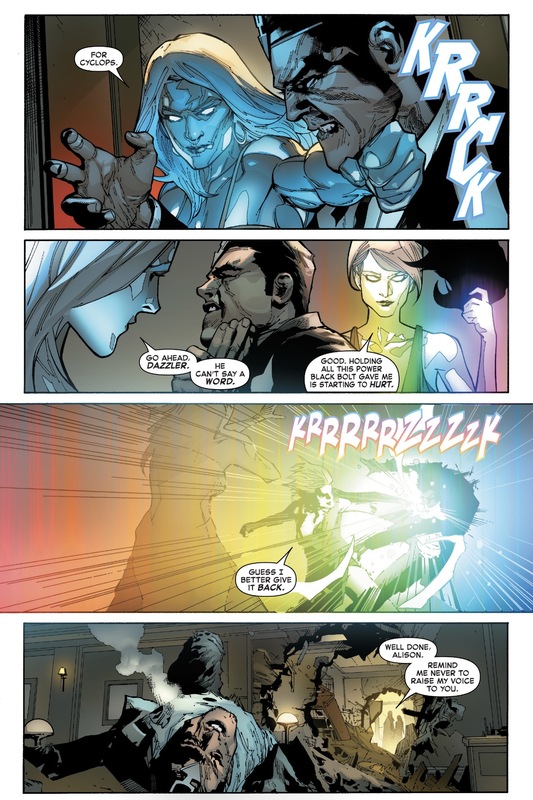 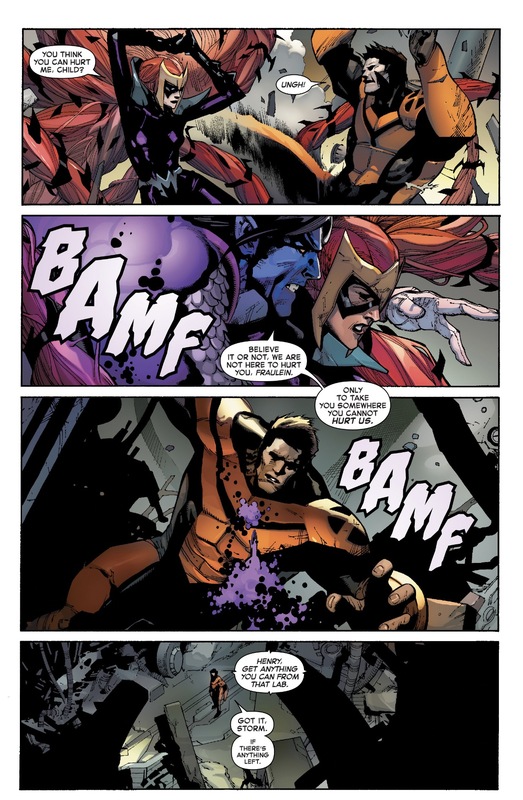 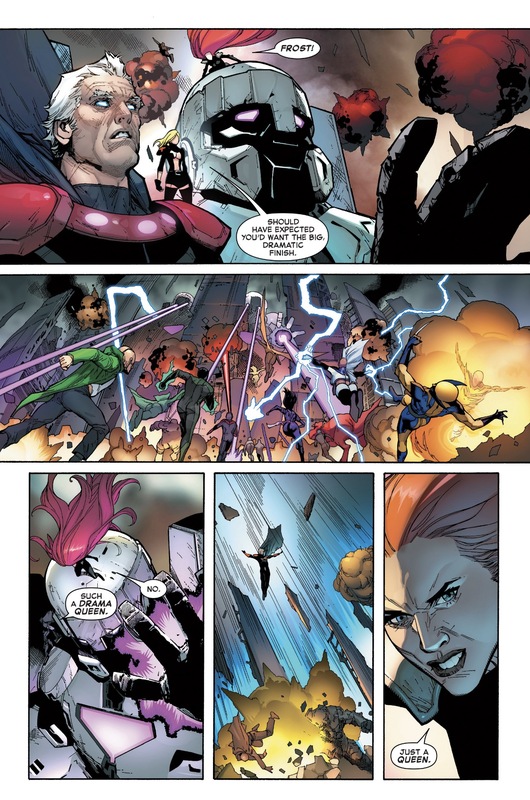 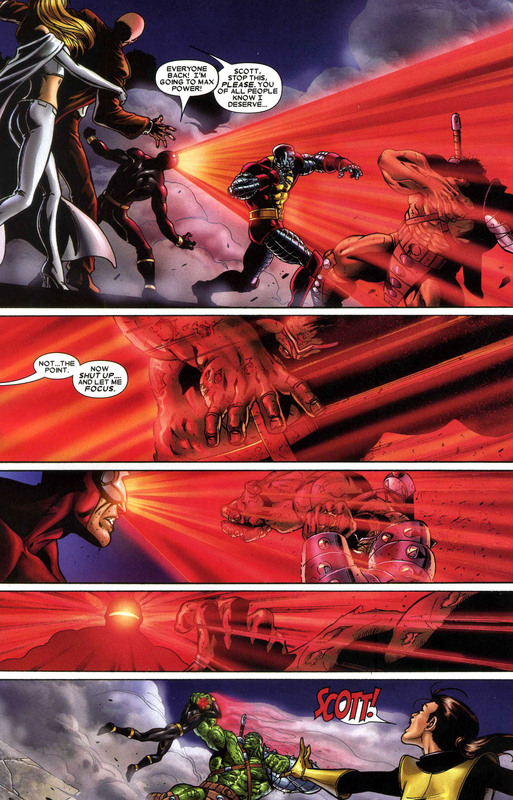 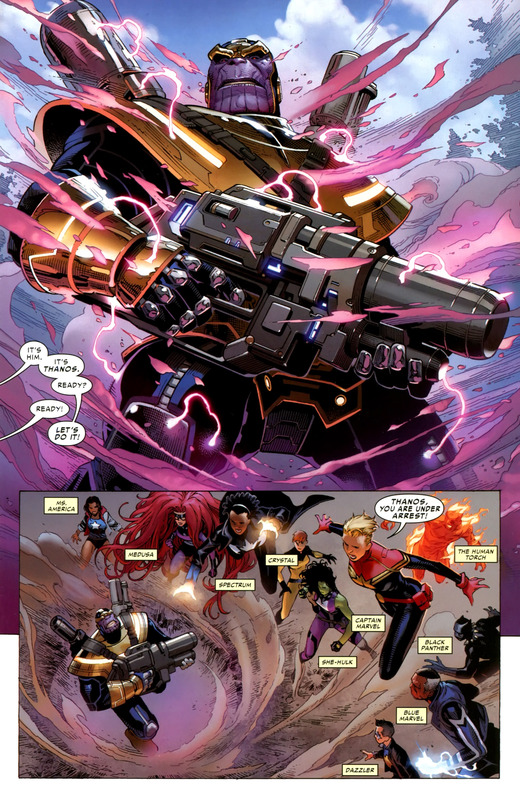 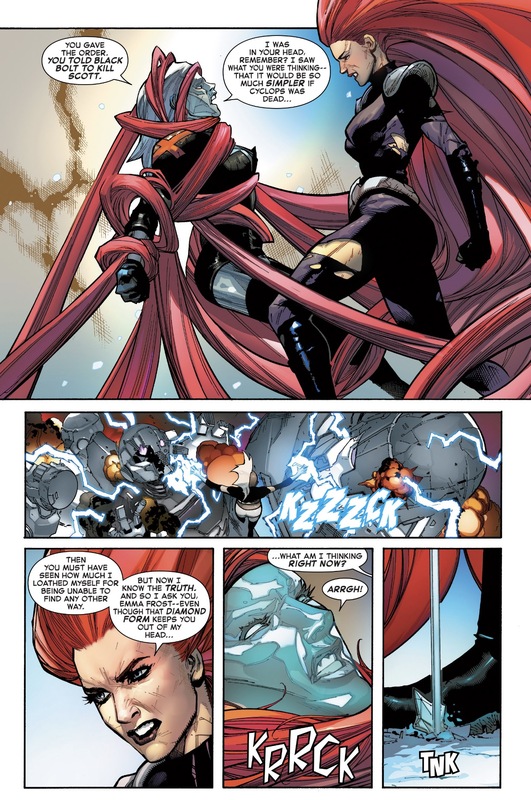 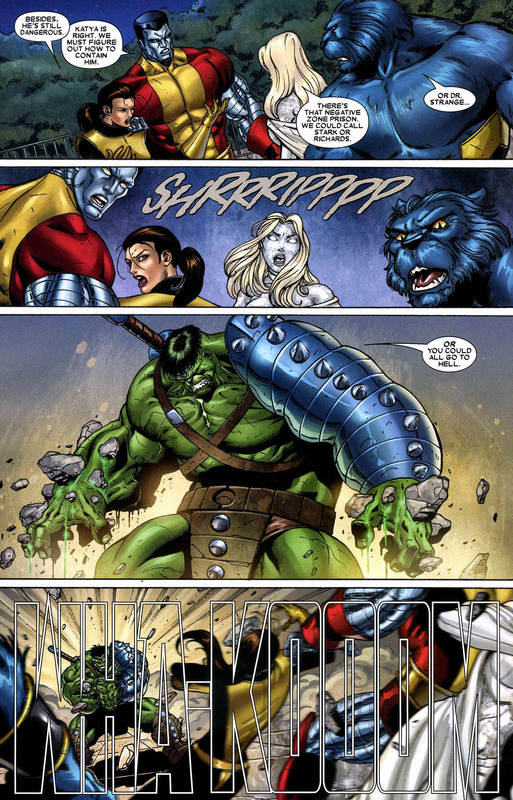 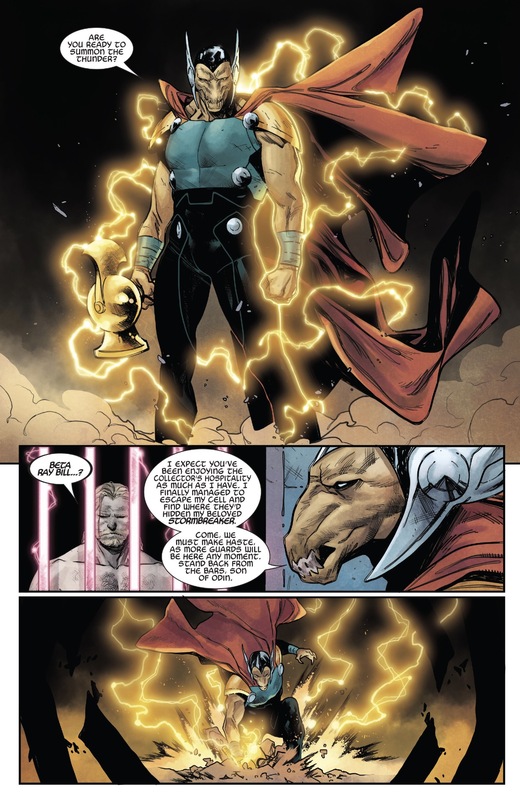 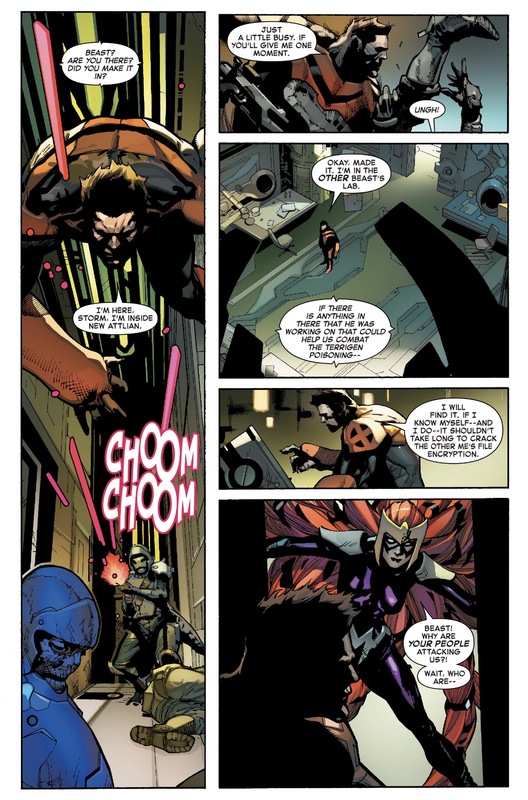 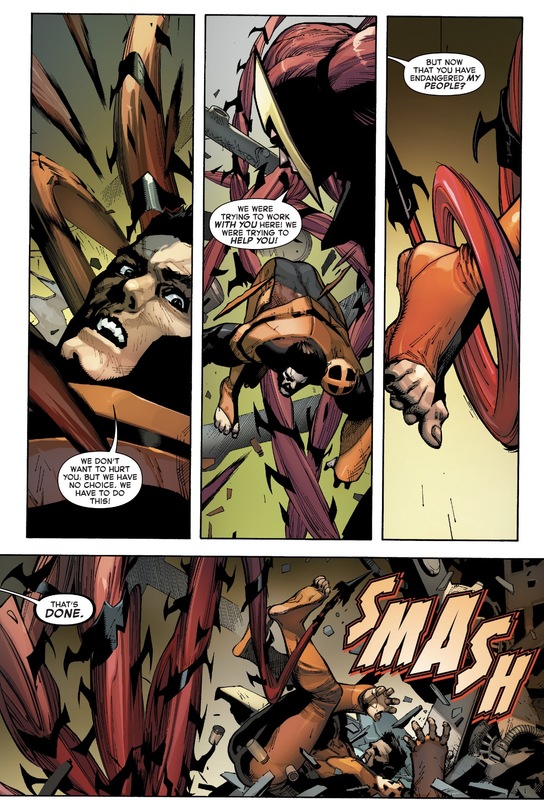 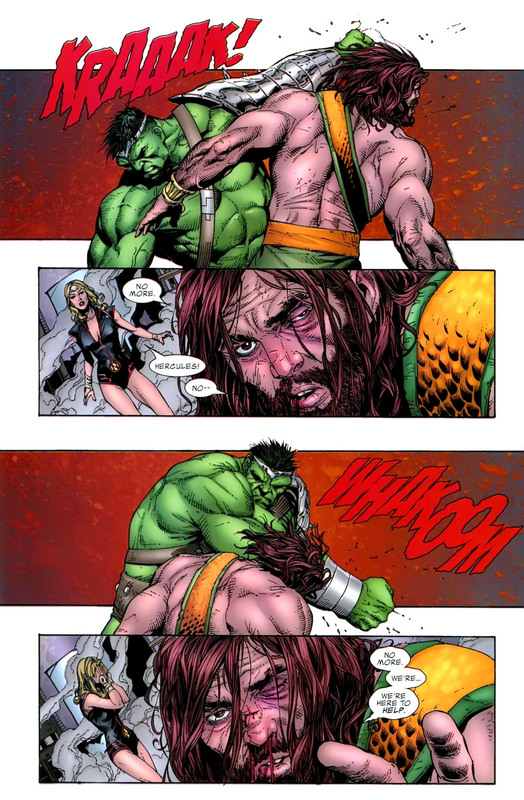 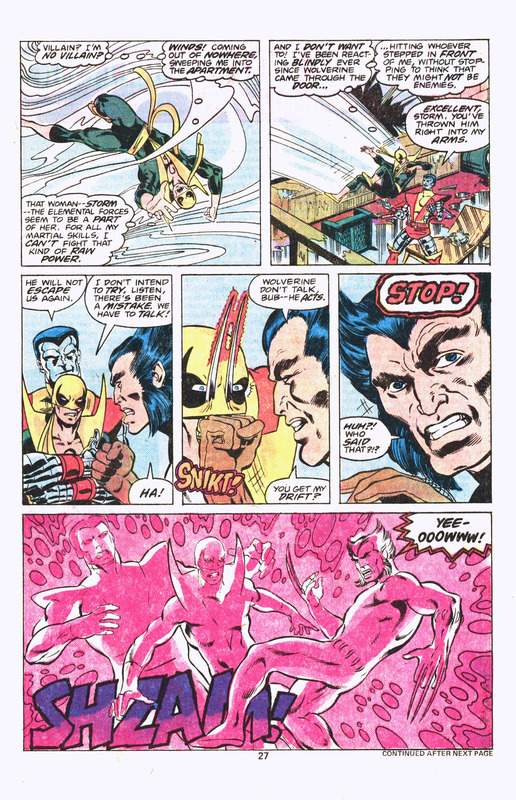 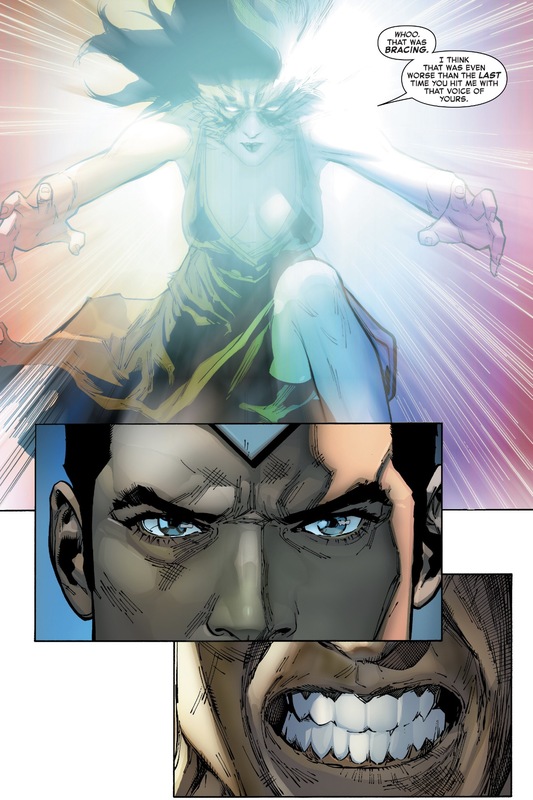 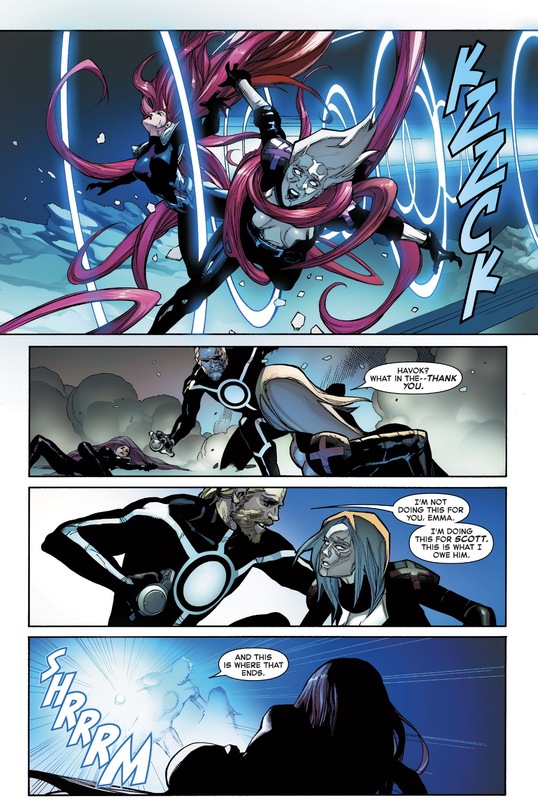 This entry was posted in All New X-Men, beast, Marvel Comics, medusa, The Inhumans, Versus, X-Men and tagged Inhumans vs. X-Men on March 14, 2017 by lowbrowcomics. 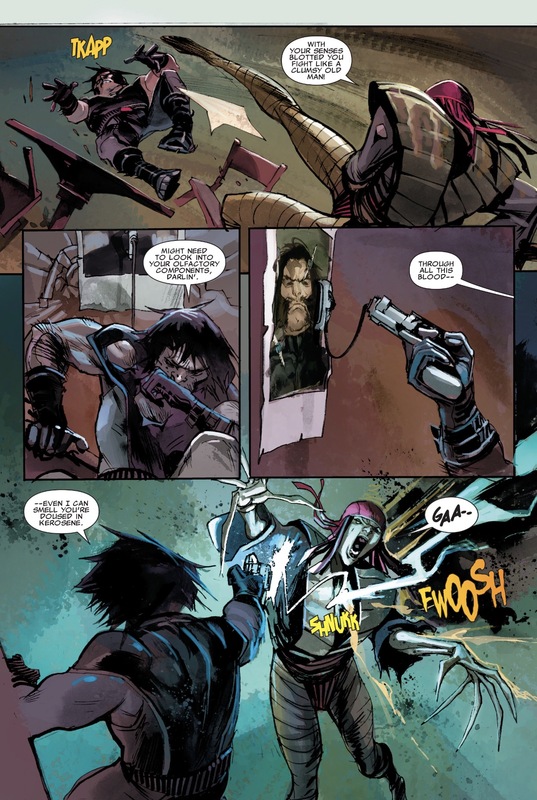 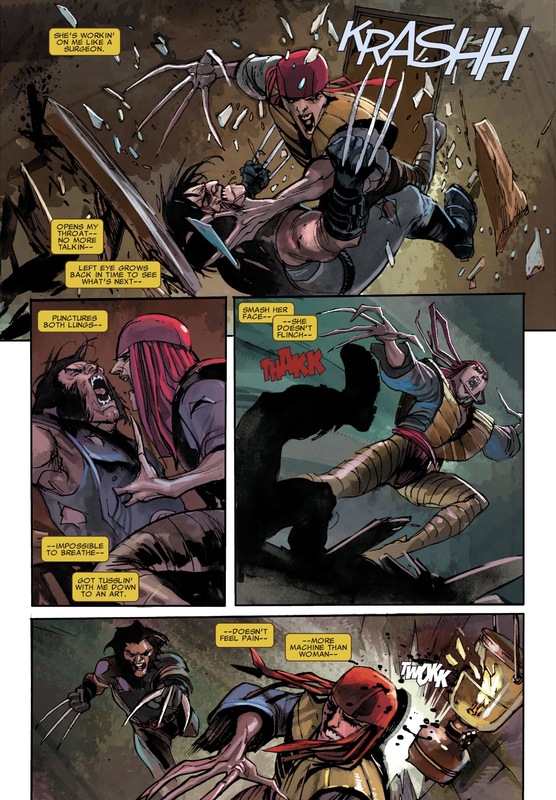 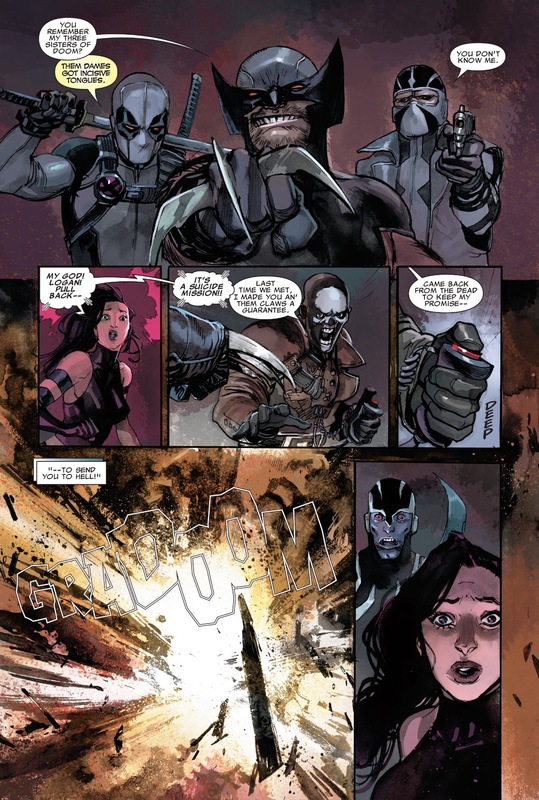 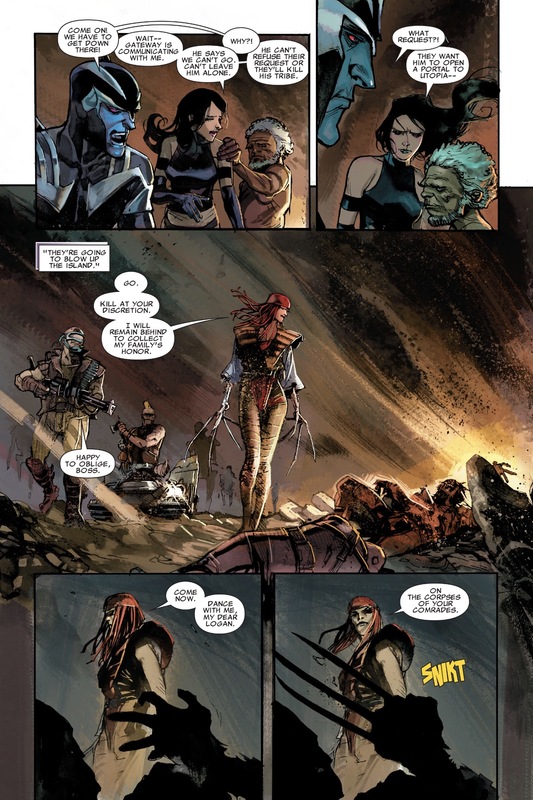 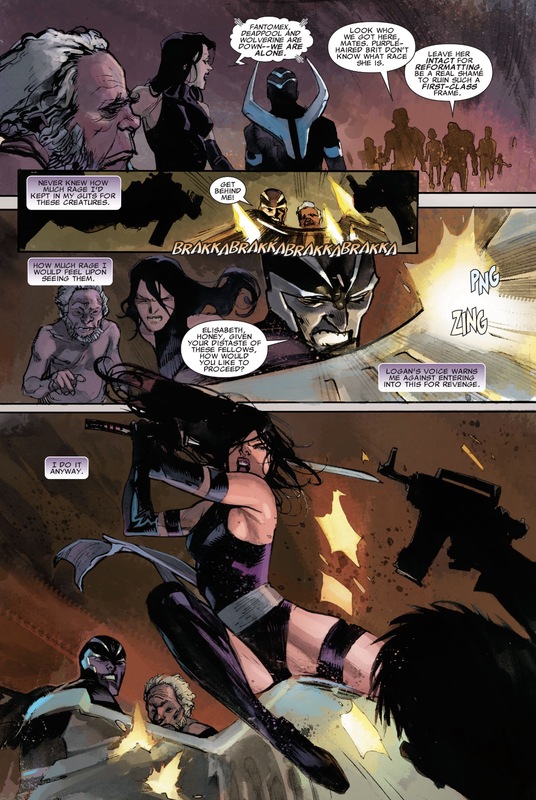 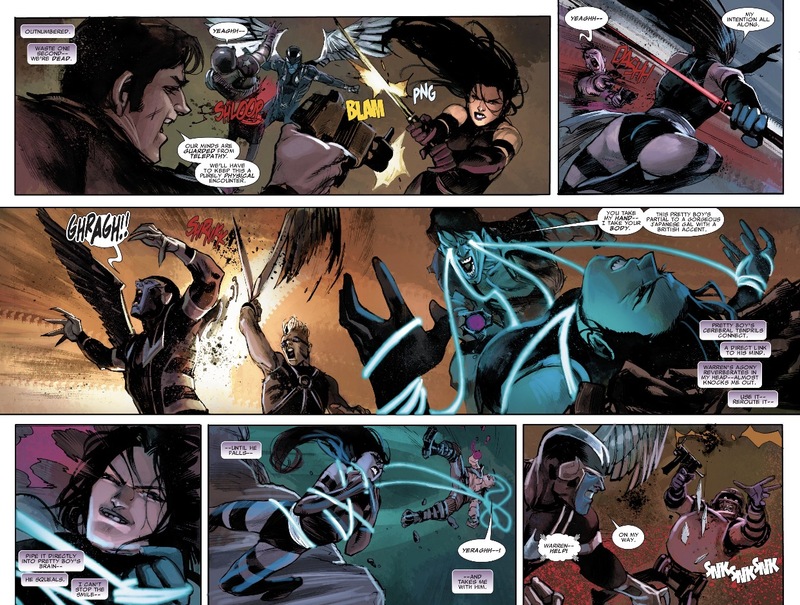 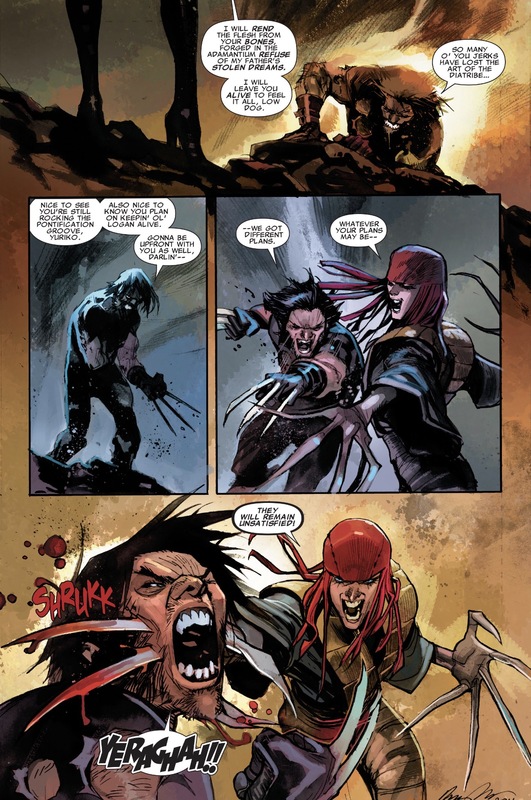 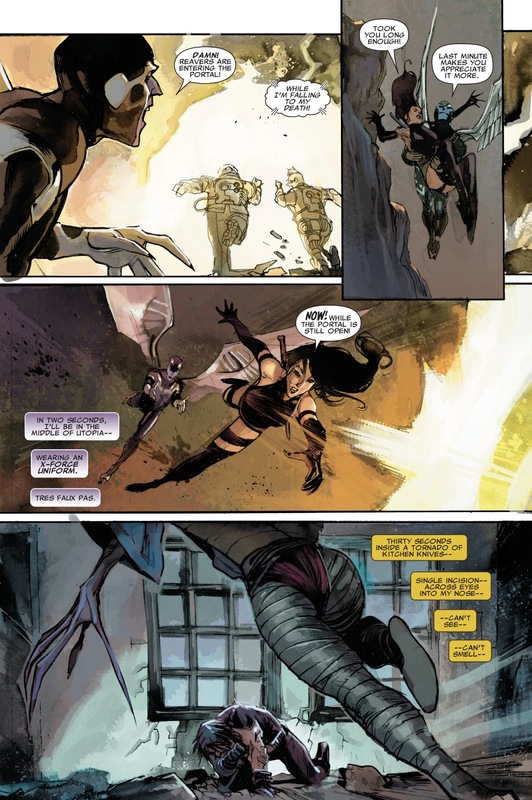 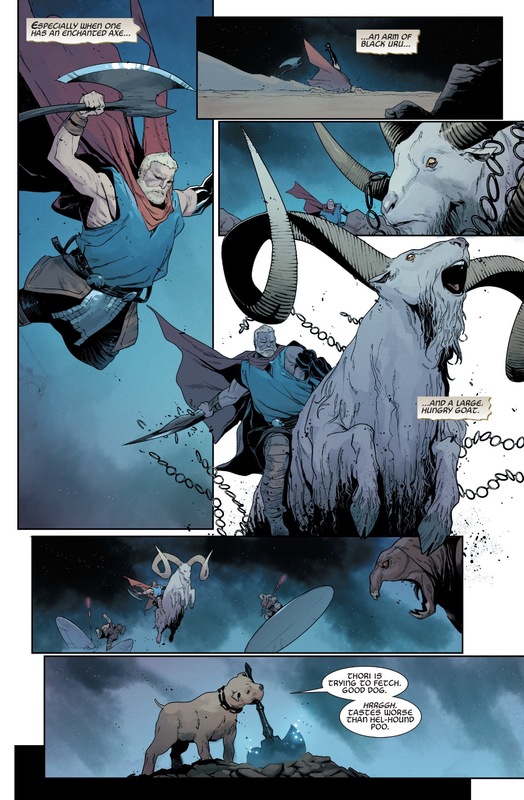 This entry was posted in Archangel, Deadpool, Fantomex, lady deathstrike, Marvel Comics, psylocke, Versus, Wolverine, X-Force, X-Men and tagged Uncanny X-Force on March 13, 2017 by lowbrowcomics. 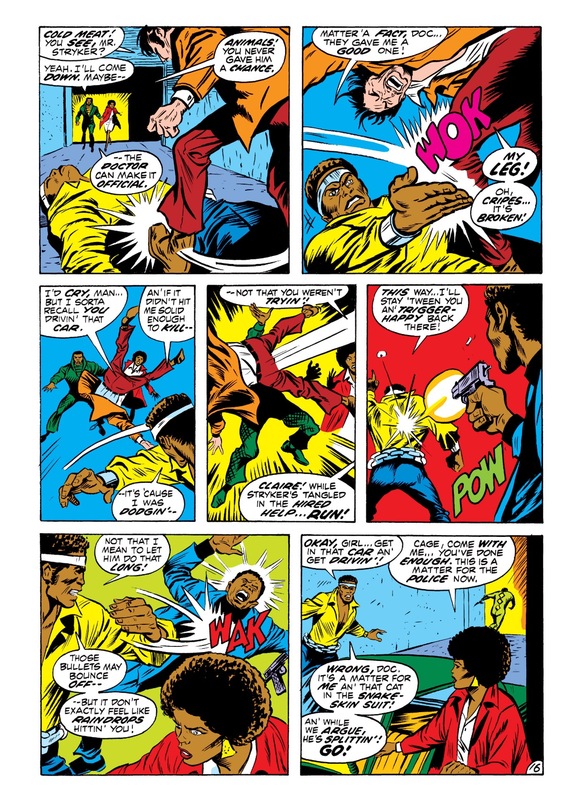 Willis Stryker and Carl Lucas grew up best friends, joining the local street gang, the Bloods, together, and eventually becoming its leaders. 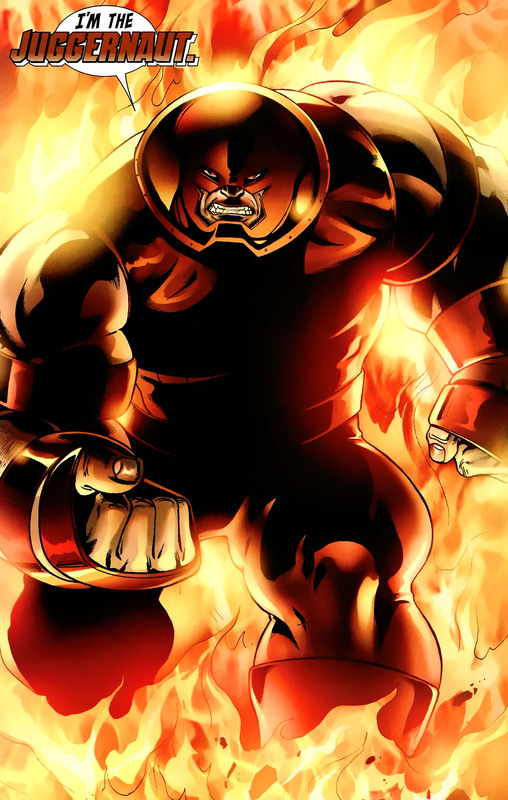 Fights against rival gangs such as the Diablos honed Willis’ knife-fighting skills. 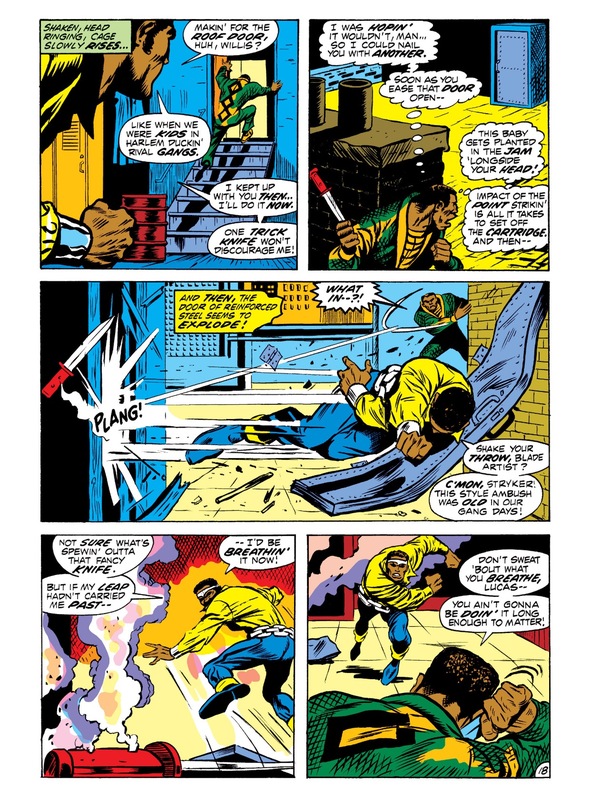 Lucas eventually quit the gangs, but Willis’ involvement deepened, and he tried to cut into the Syndicate’s territory. 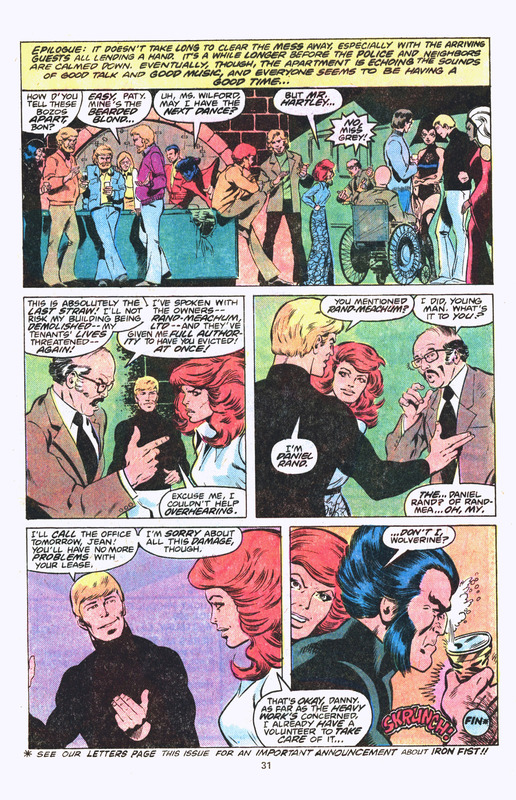 Then both men became rivals for the affections of Lucas’ work colleague Reva Connors. 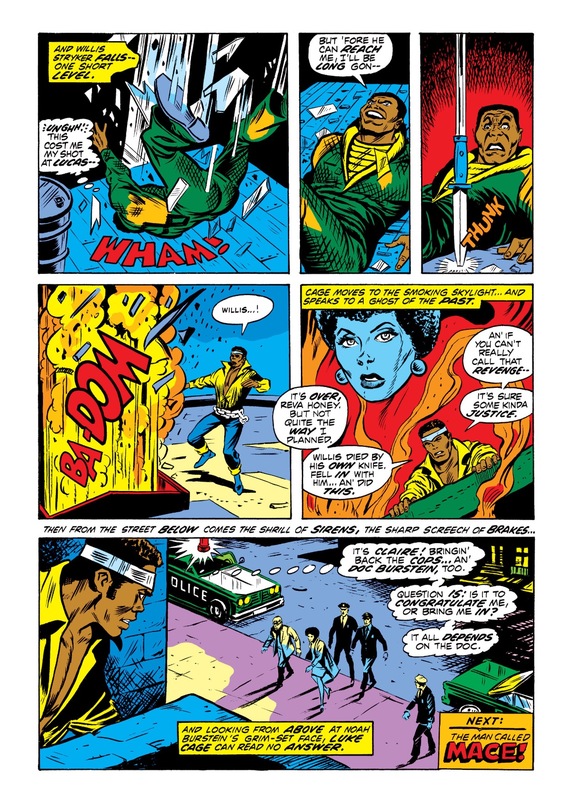 At first Willis’ money impressed Reva, but witnessing Syndicate heavies ambush Willis demonstrated to her his lifestyle’s brutality. 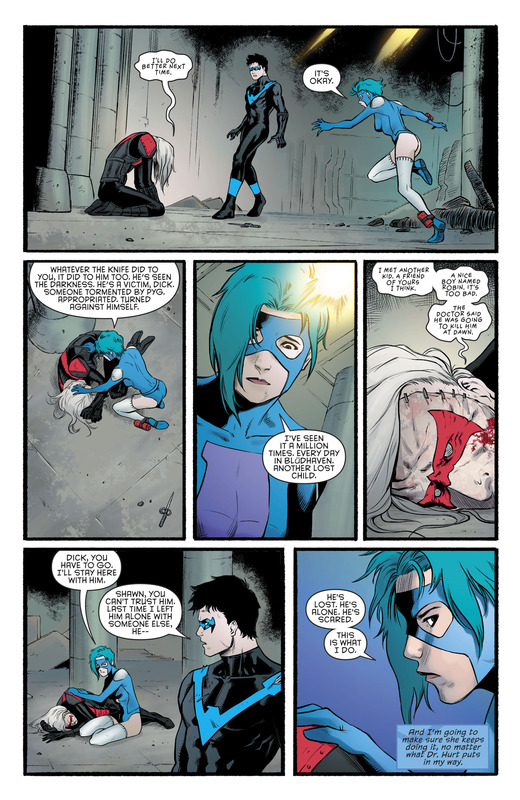 Reva fled for help, returning with Lucas in time to save Willis’ life. 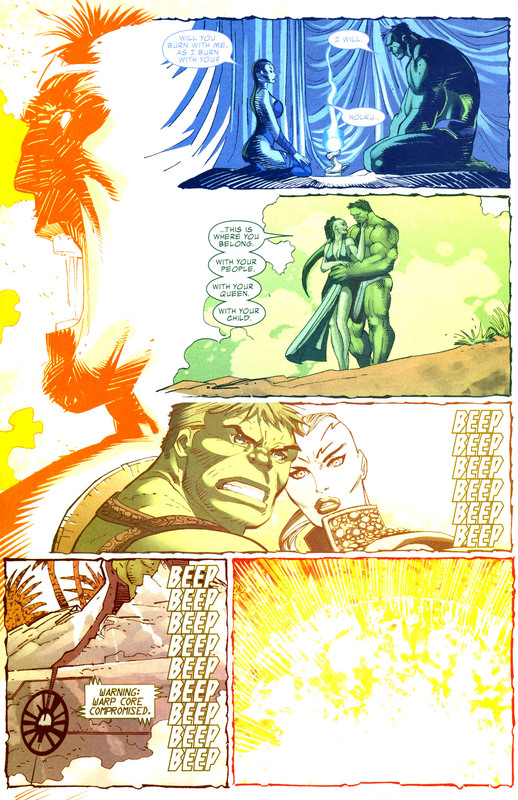 Despite this, an enraged Willis blamed Lucas when Reva dumped him. 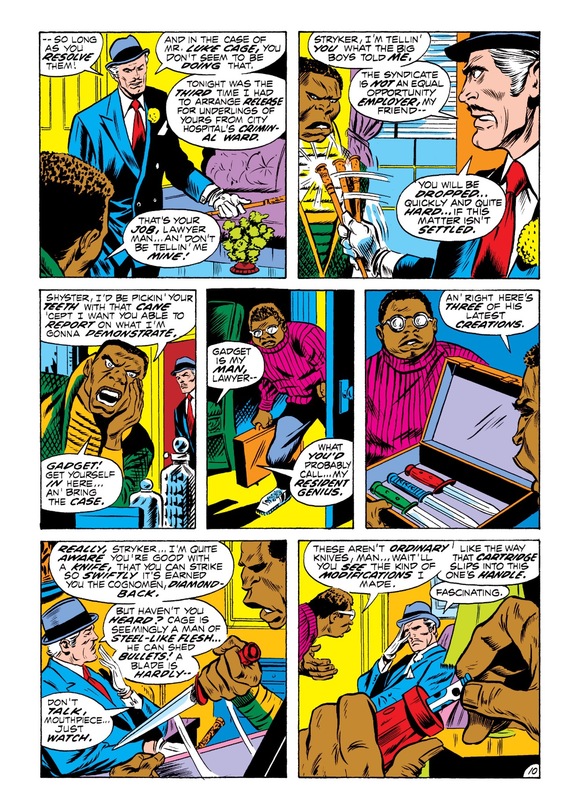 Willis stole two kilos of uncut heroin from his rival Cornell Cottonmouth’s gang, and used it to frame Lucas, who was imprisoned, allowing Willis to move in on Reva, falsely promising to help prove Lucas’ innocence. 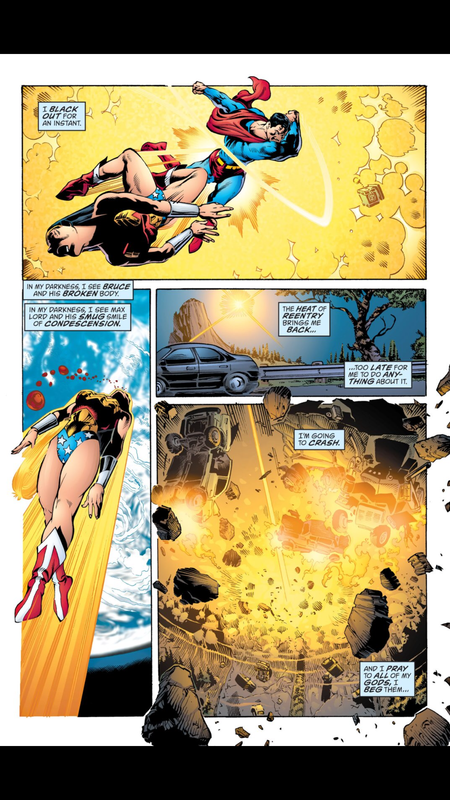 She was in Willis’ car when it was forced off the road in retaliation for the theft; he survived, but she did not. 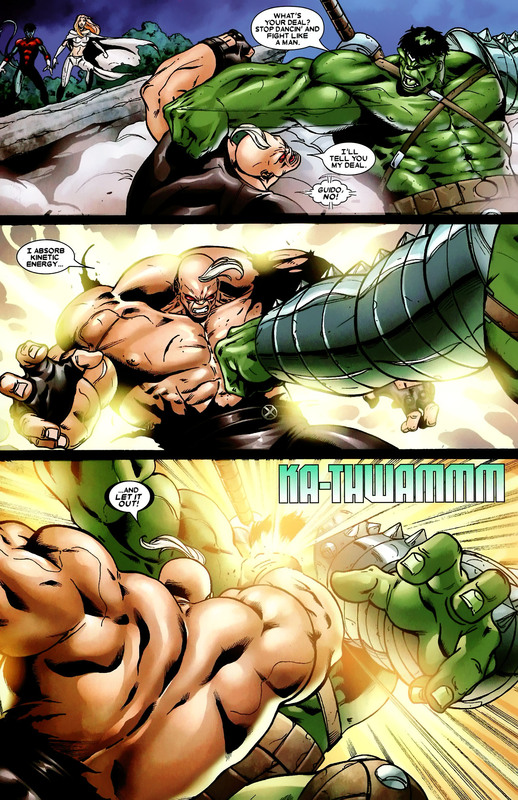 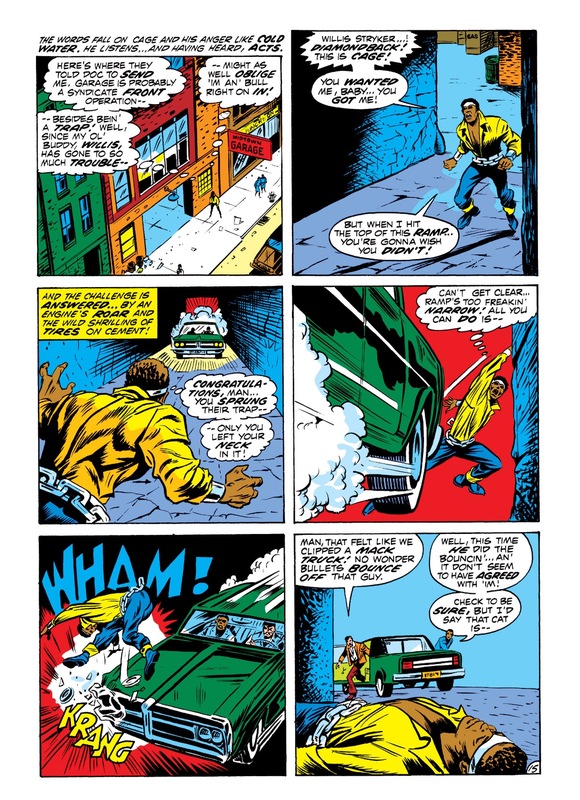 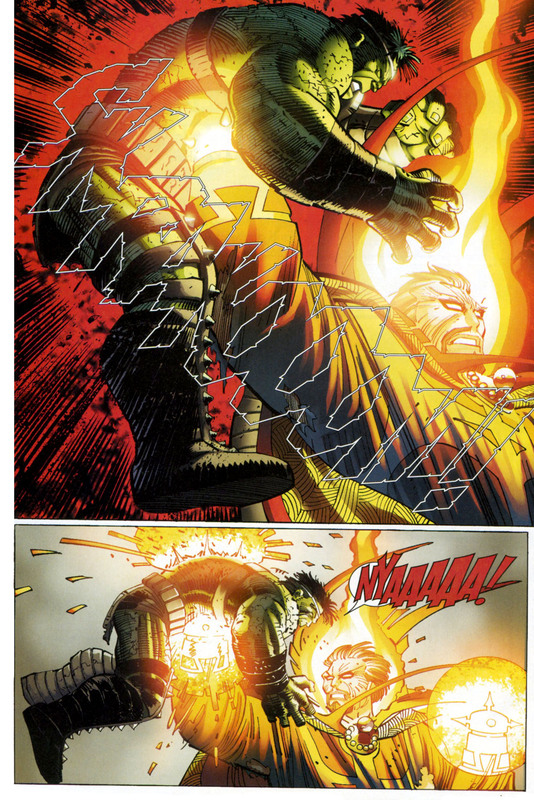 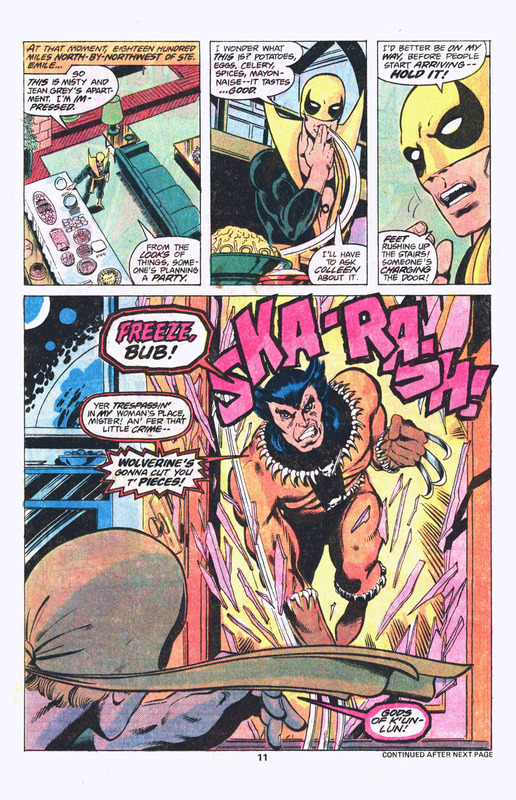 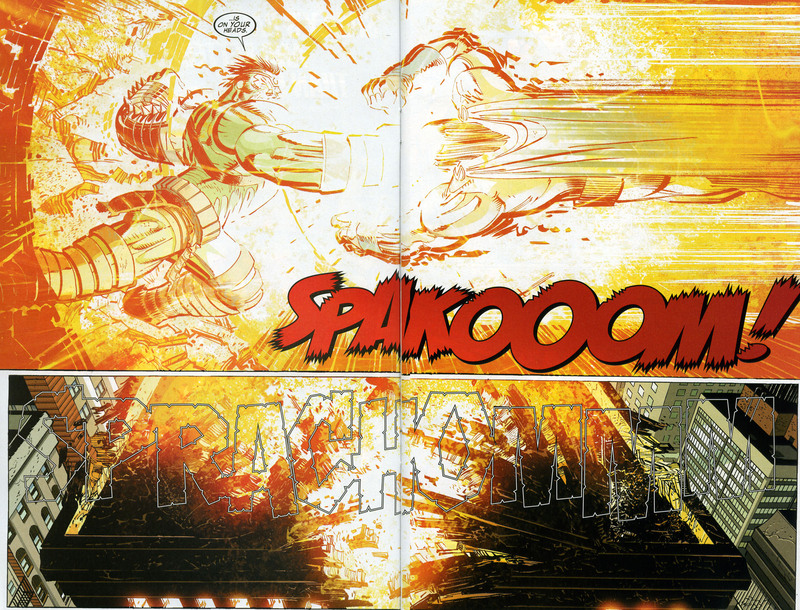 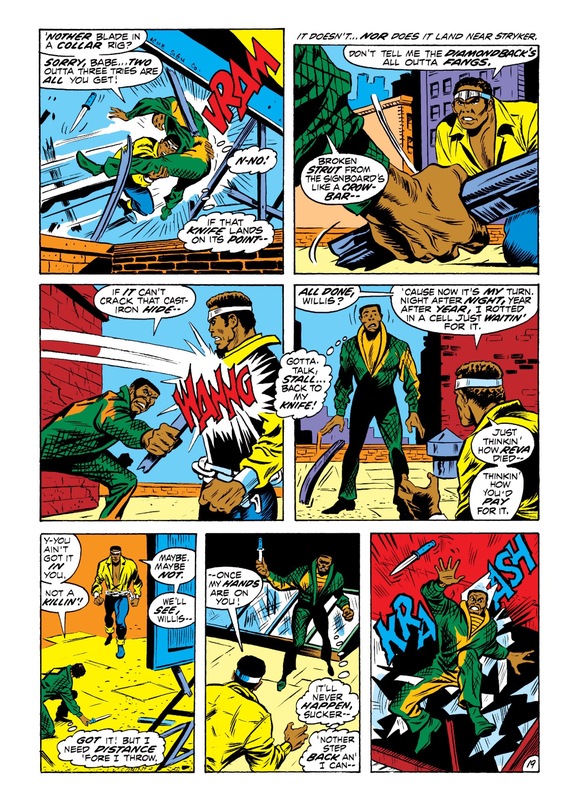 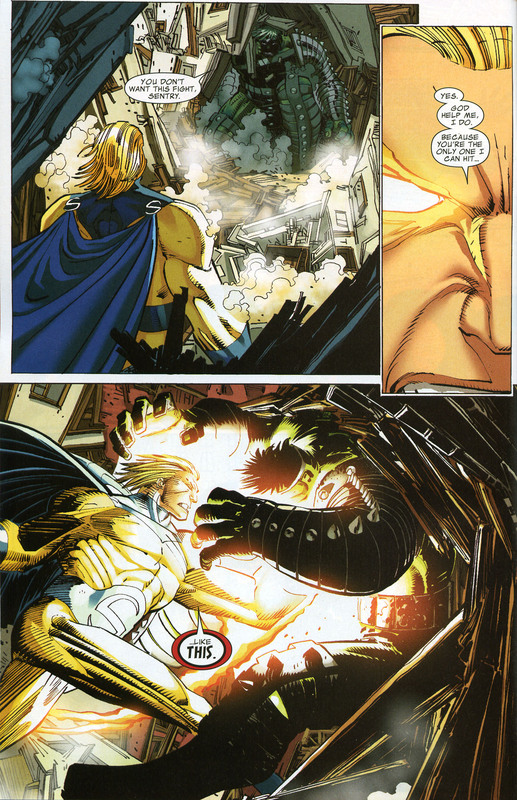 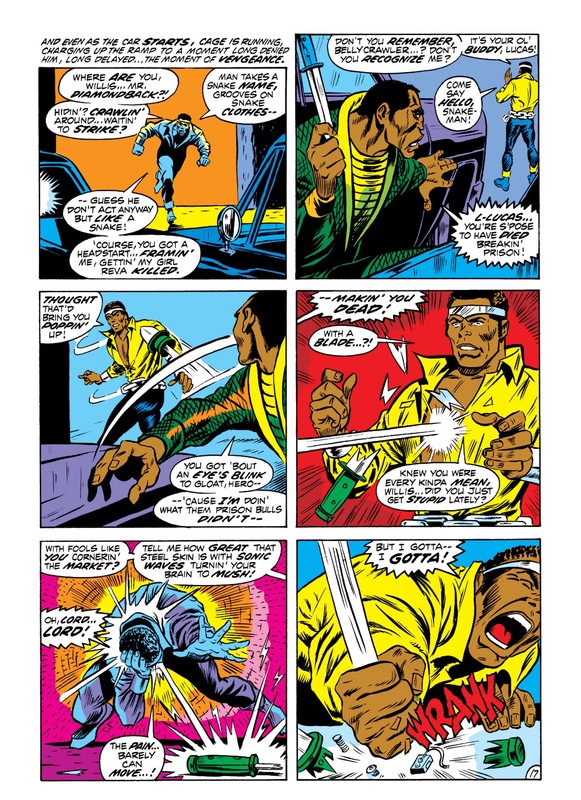 This entry was posted in Luke Cage, Marvel Comics, Power Man, Versus and tagged diamondback, luke cage, Power Man, Willis Stryker on October 3, 2016 by lowbrowcomics. 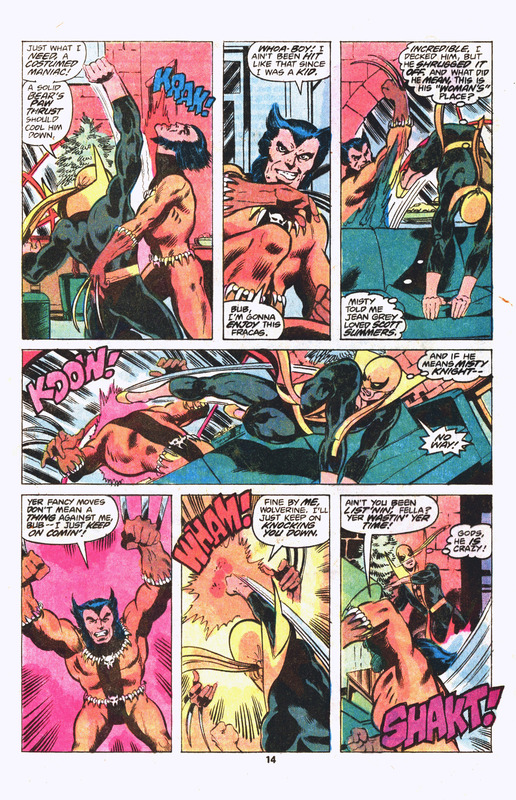 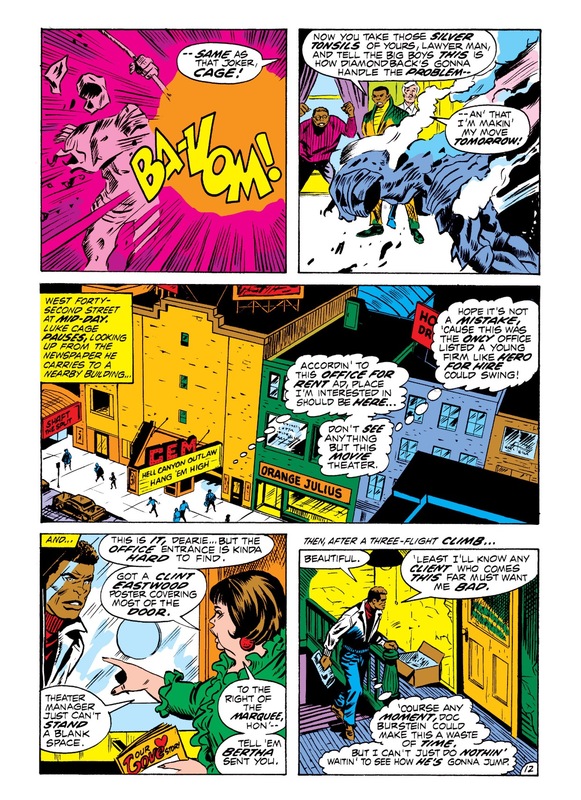 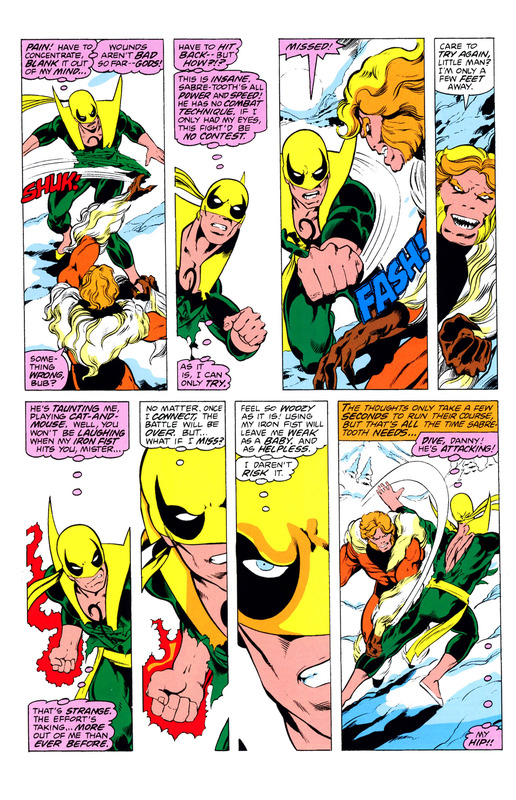 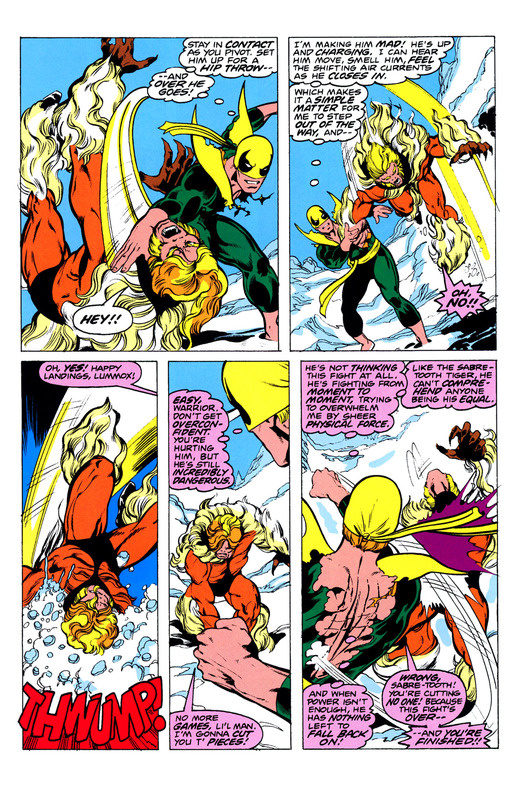 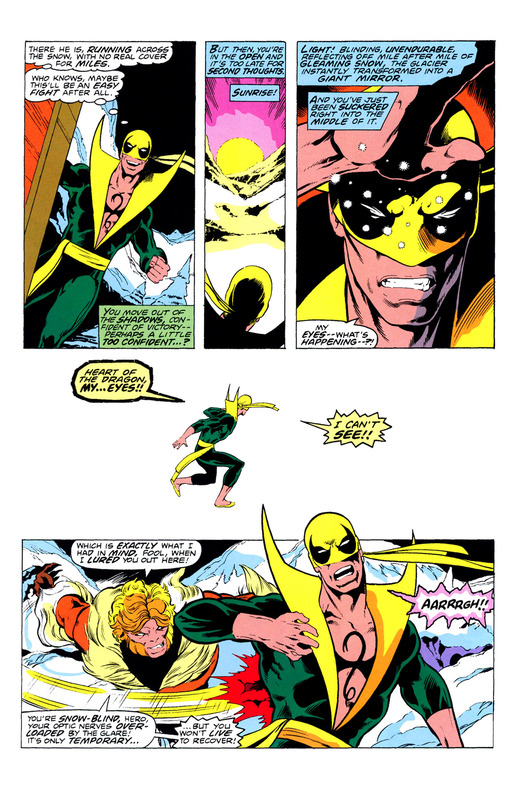 This entry was posted in Colleen Wing, Iron Fist, Marvel Comics, Versus and tagged colleen wing, iron fist, sabertooth, VS on October 2, 2016 by lowbrowcomics. 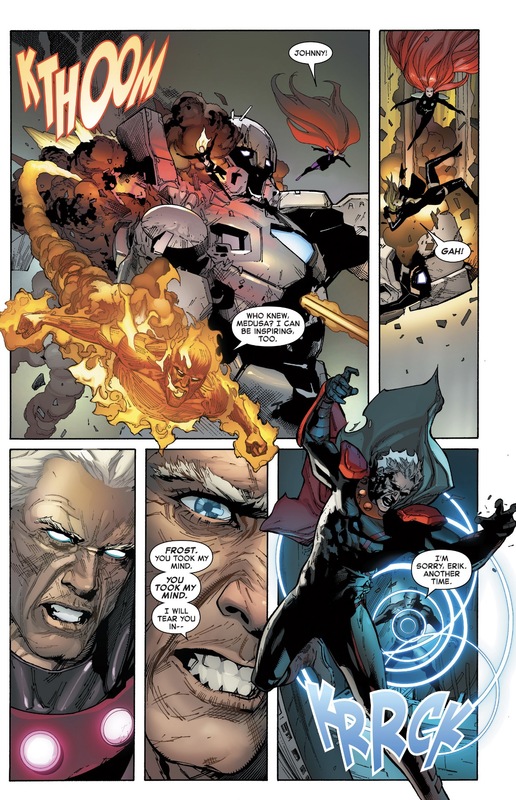 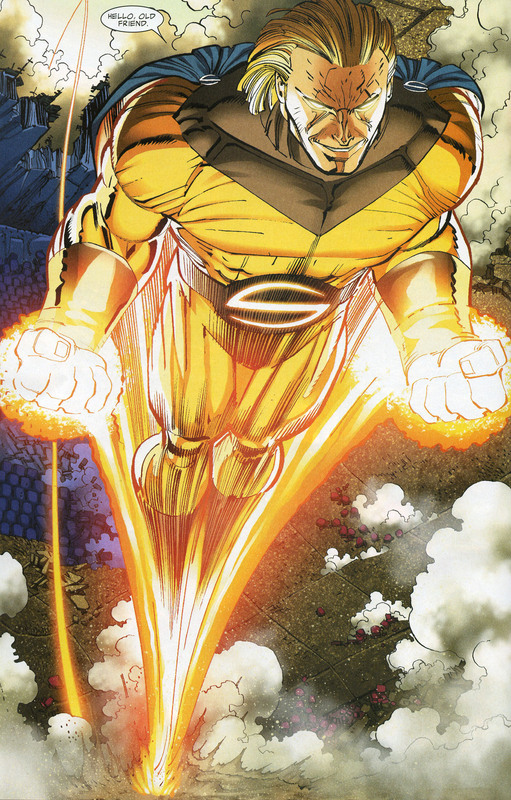 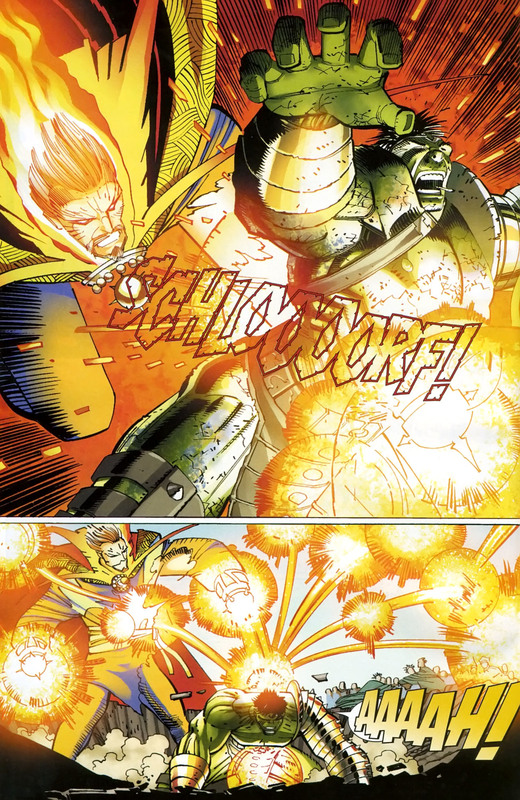 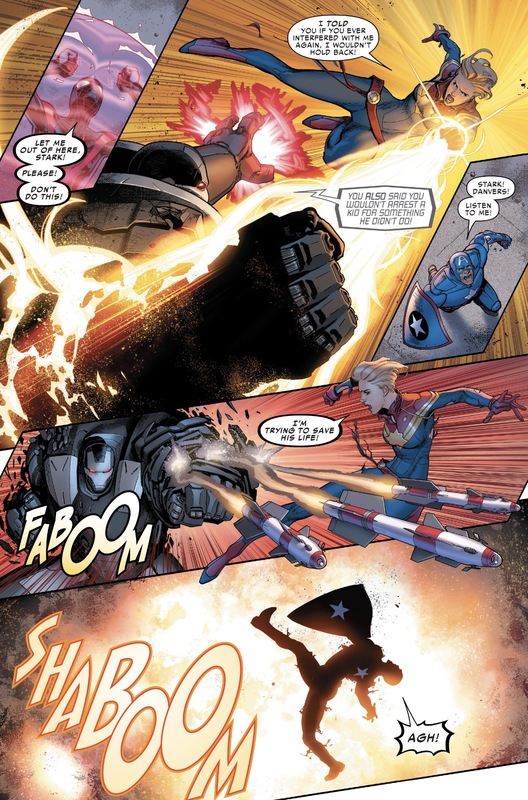 The character John Walker was first introduced as the super villain Super-Patriot in Captain America #323. 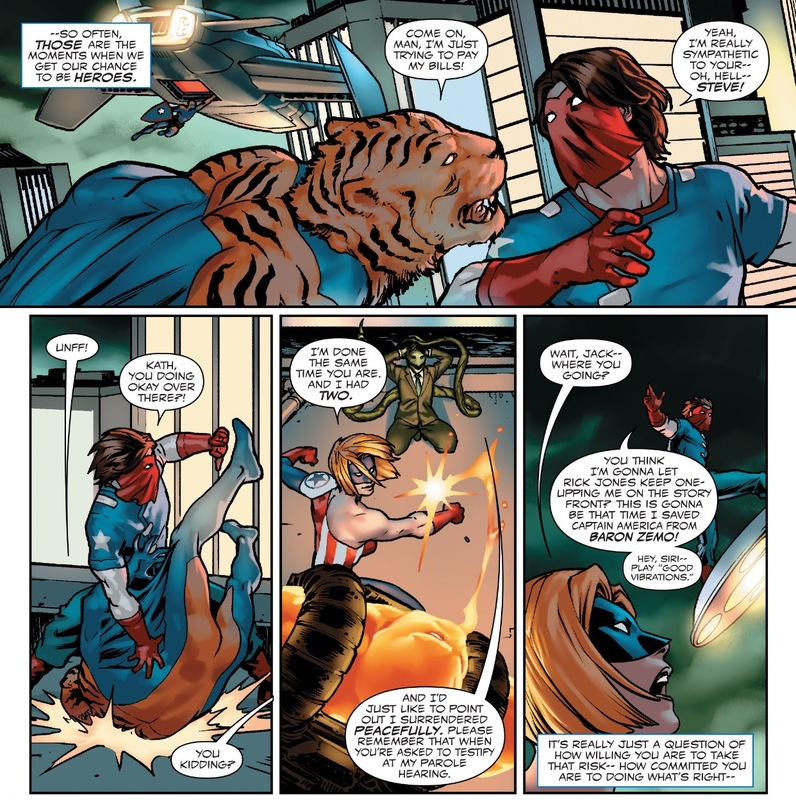 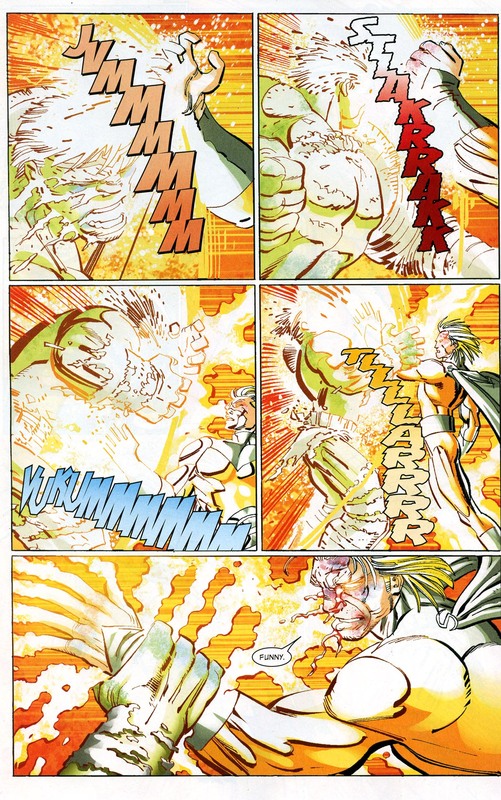 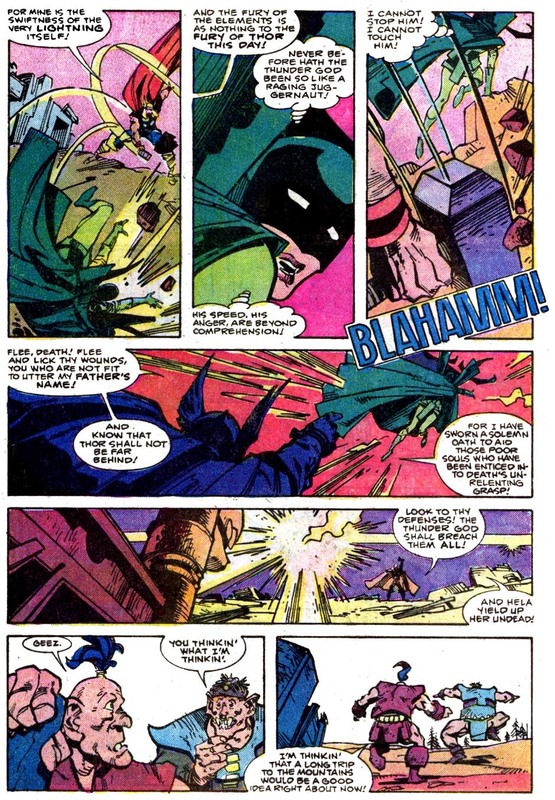 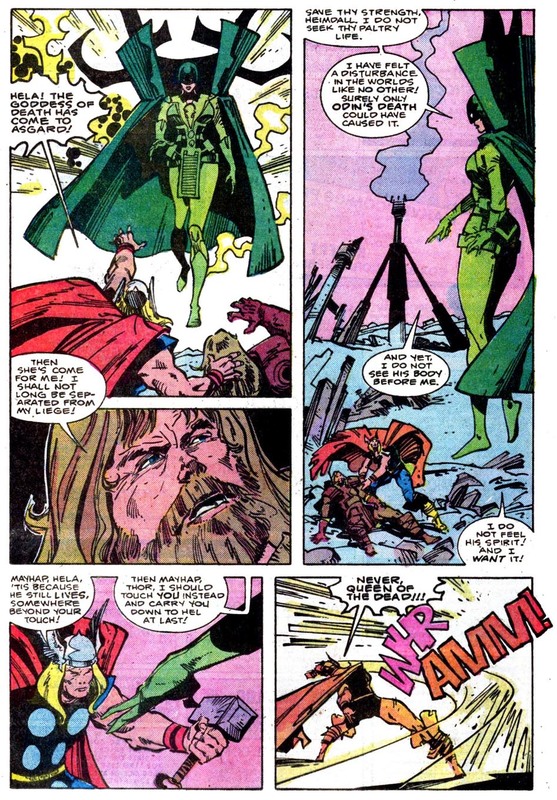 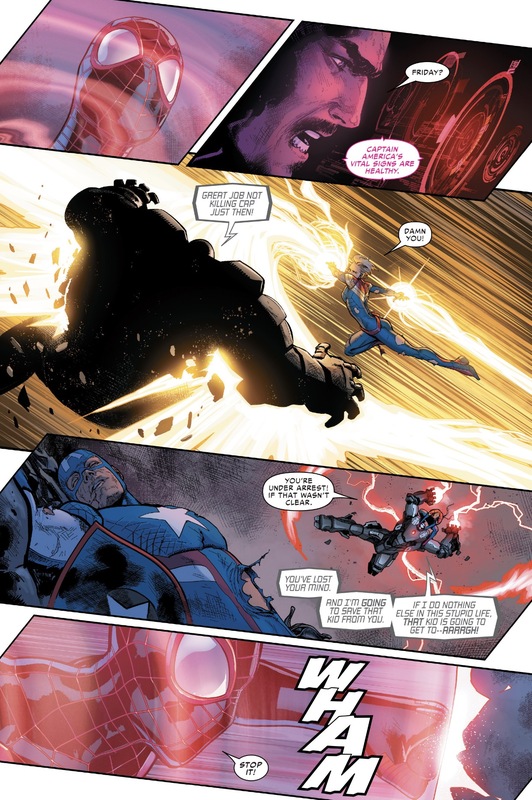 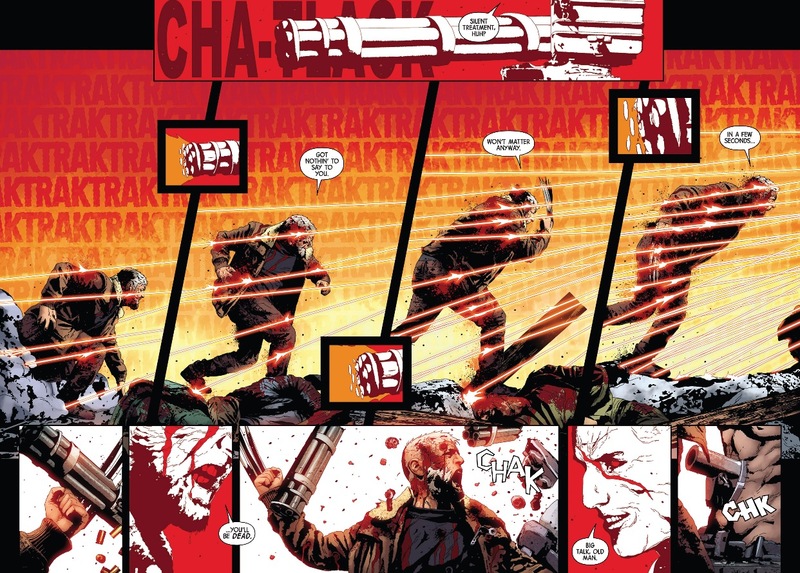 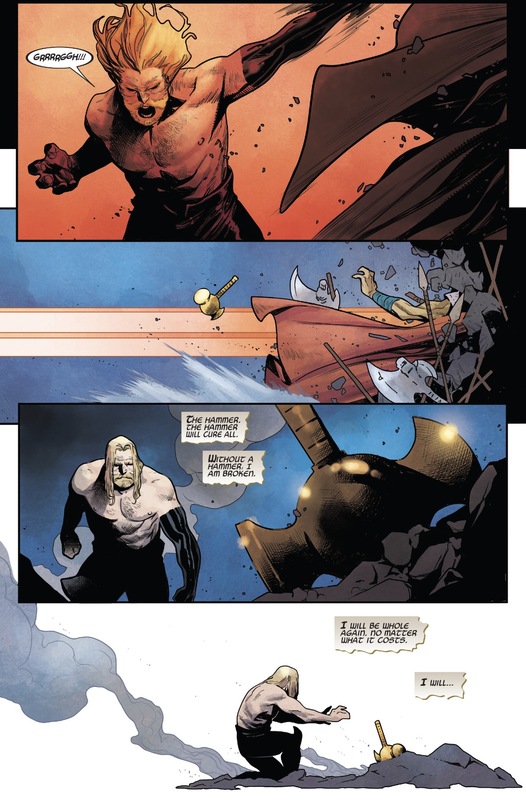 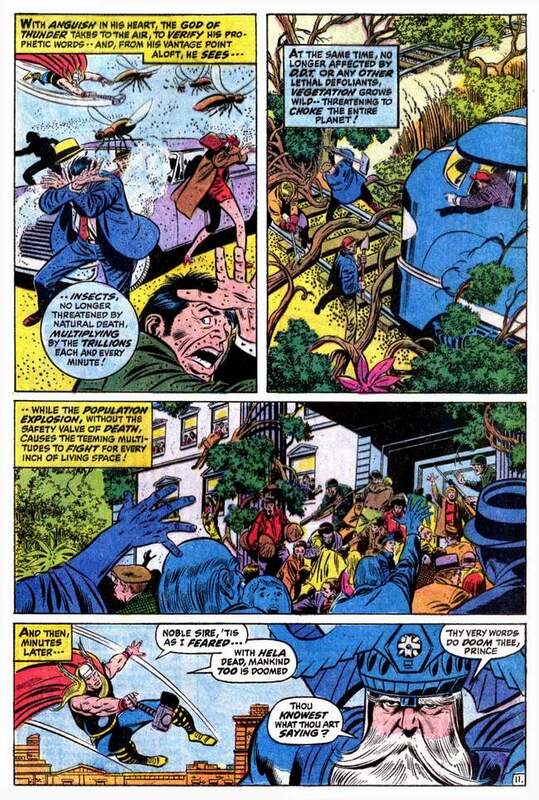 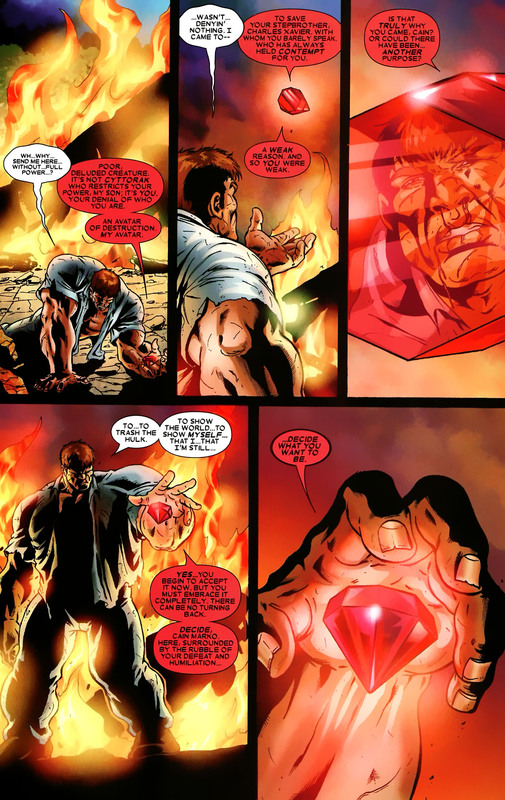 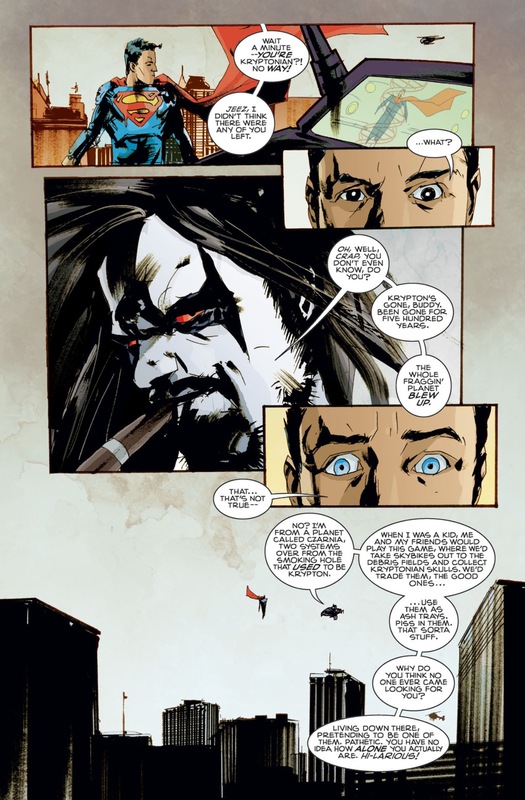 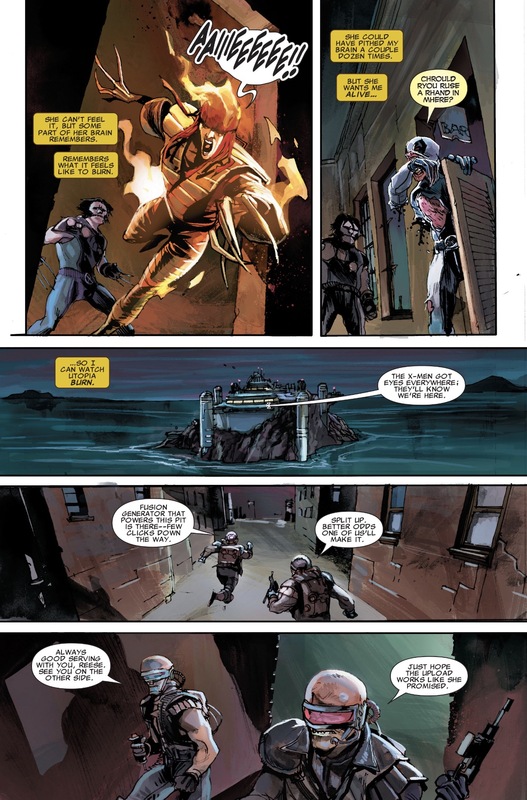 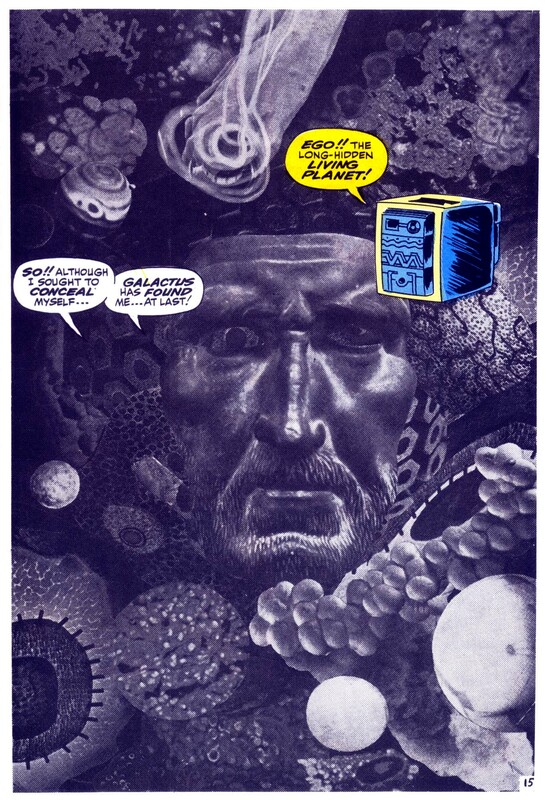 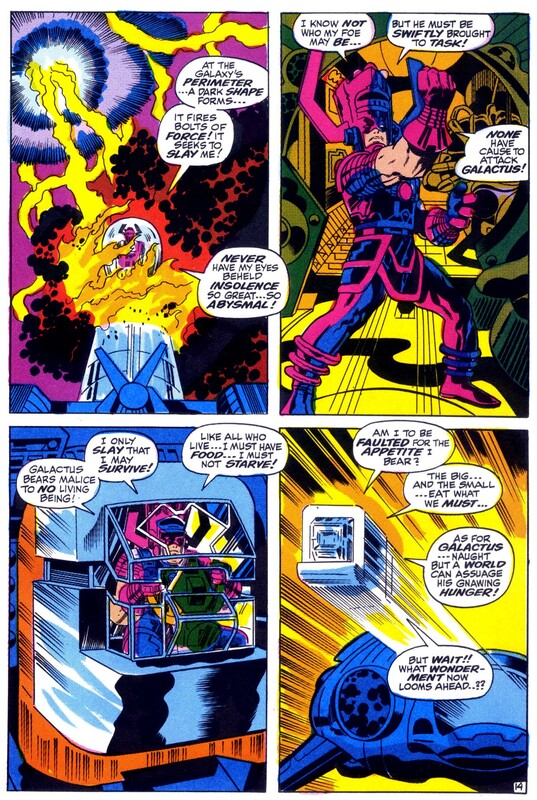 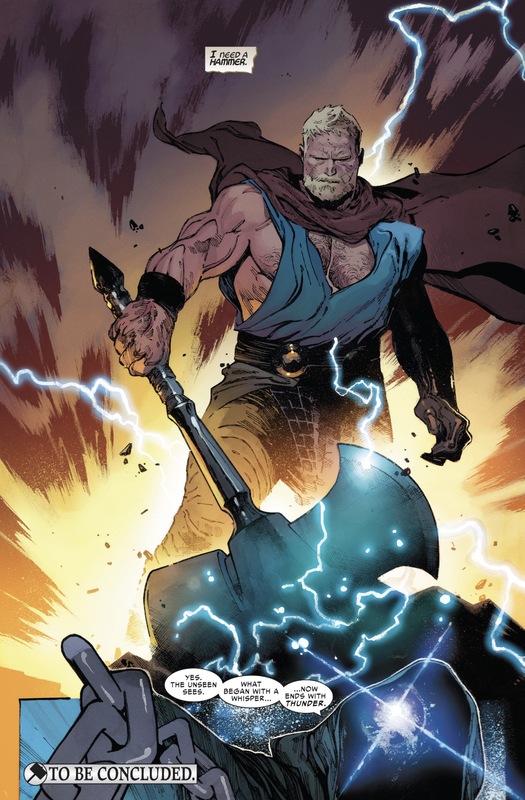 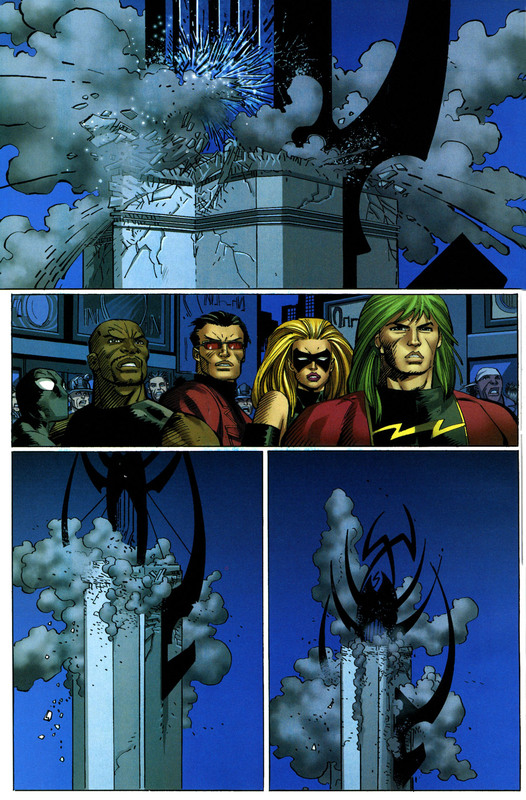 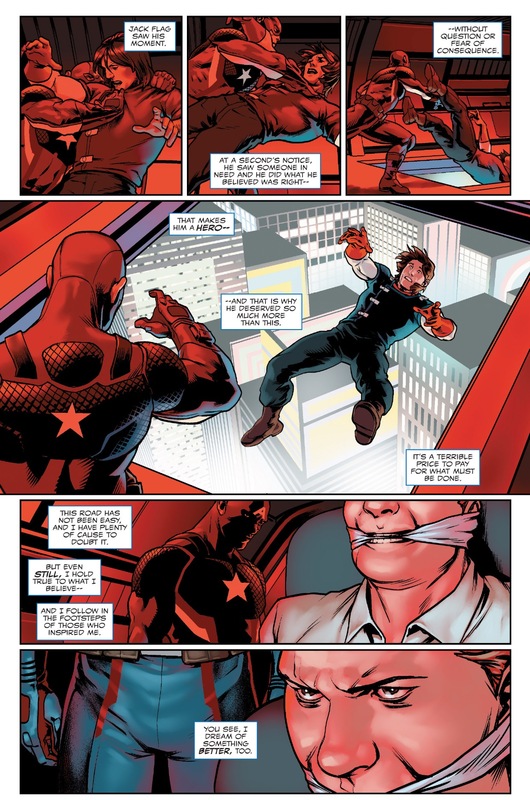 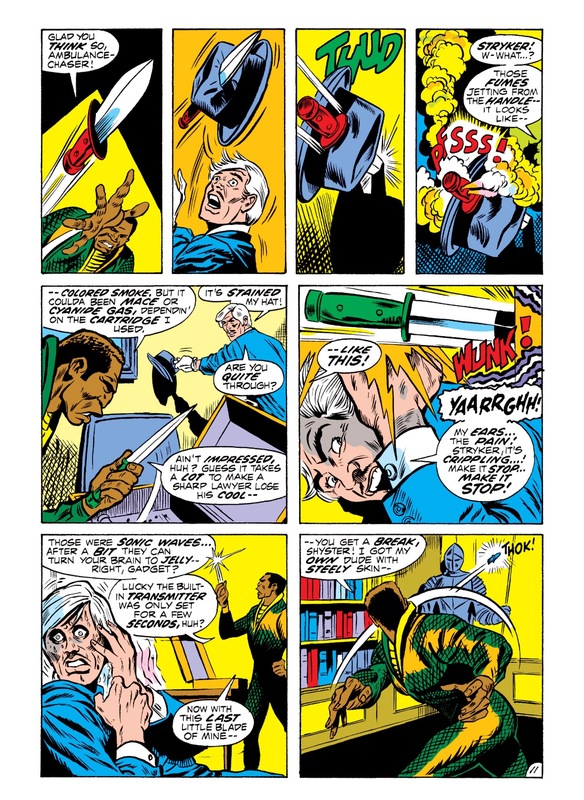 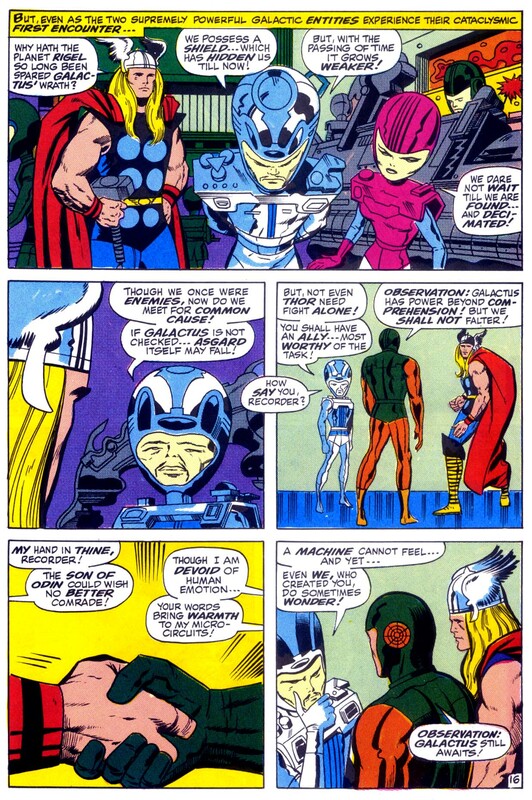 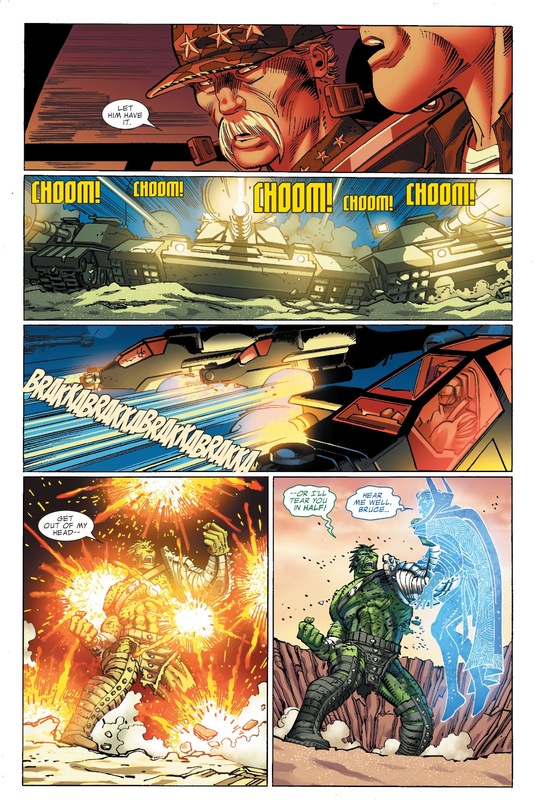 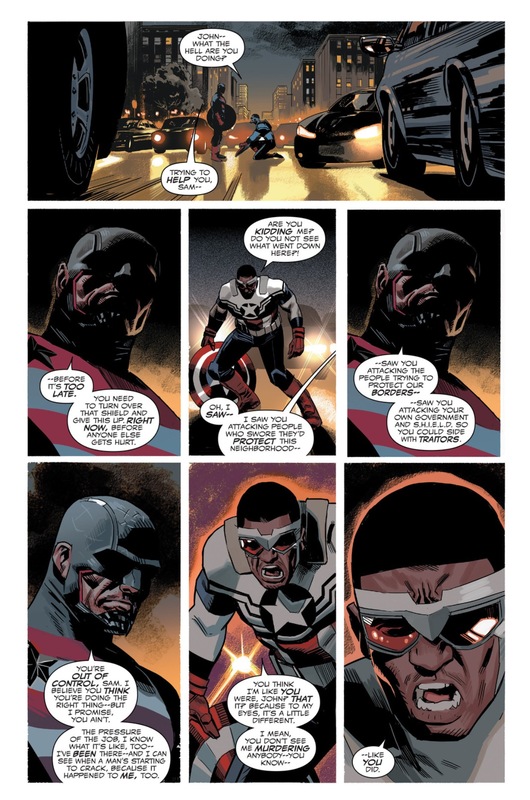 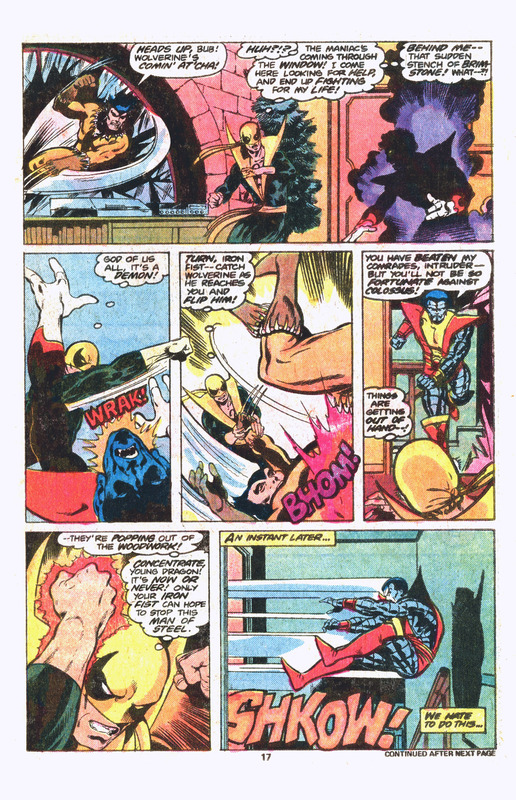 Mark Gruenwald created Walker to counter the general message in Captain America of patriotism being invariably good, describing him as someone who embodied patriotism in a way that Captain America didn’t—a patriotic villain. 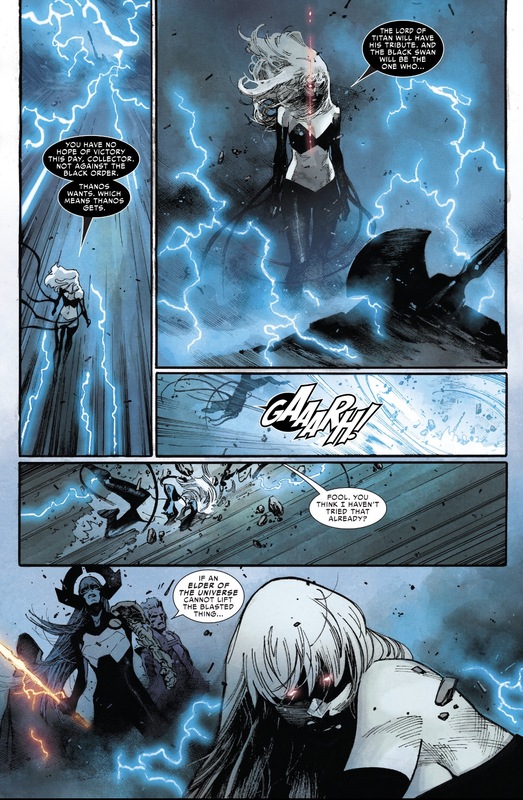 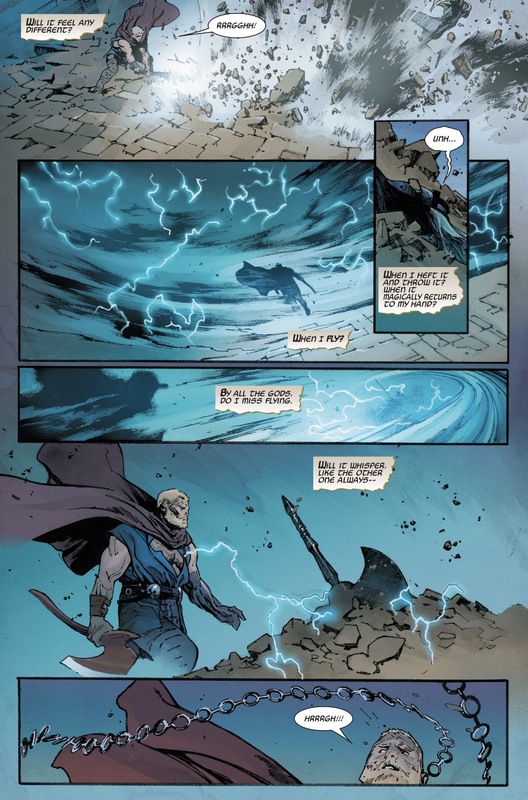 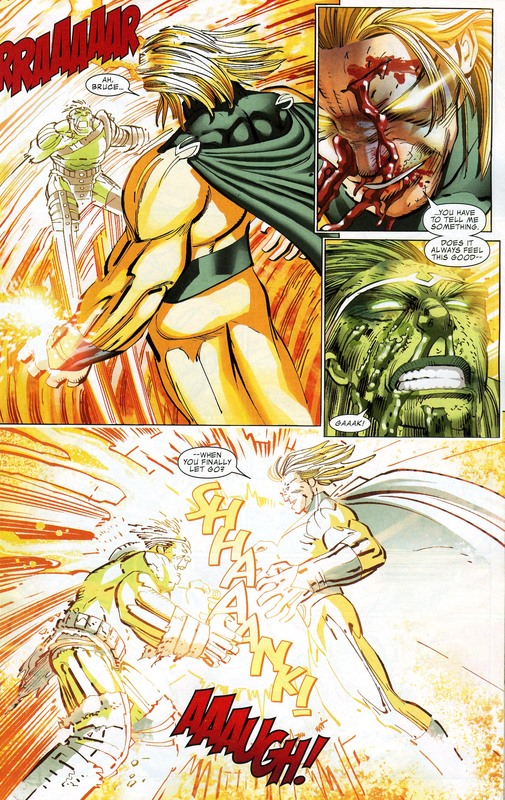 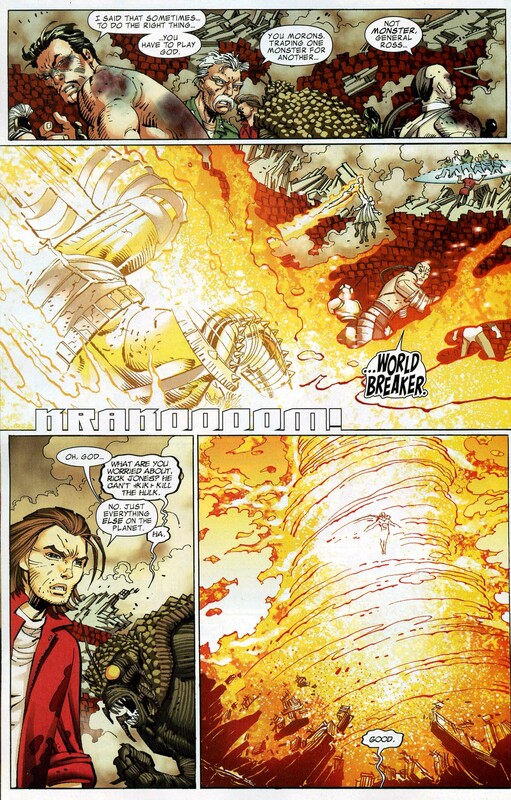 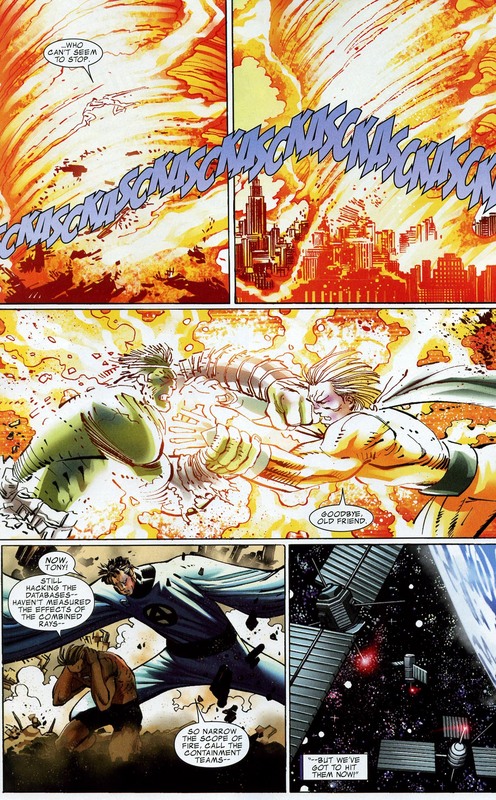 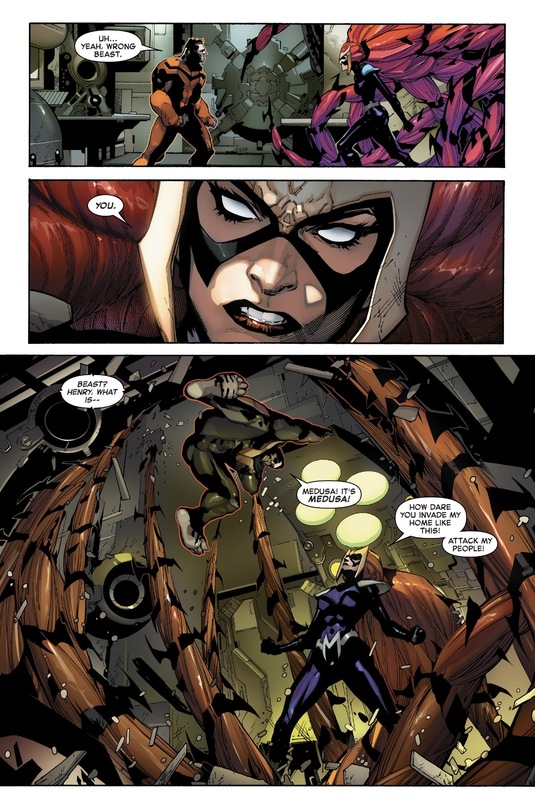 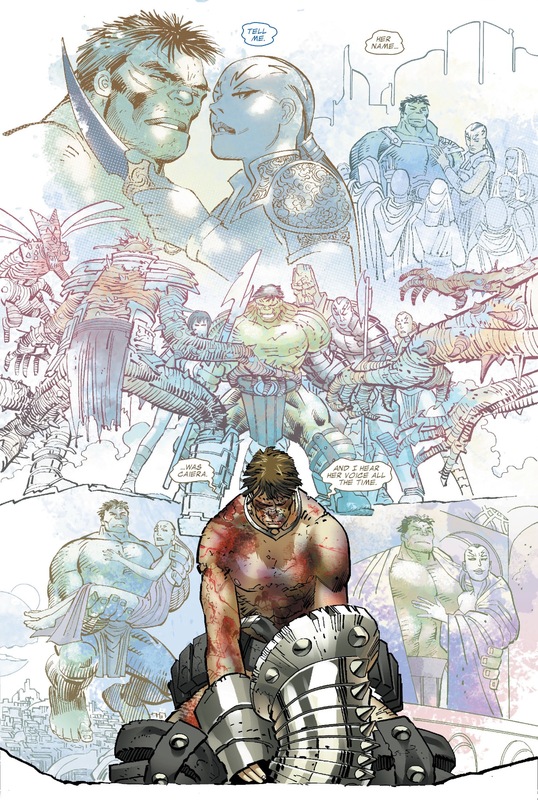 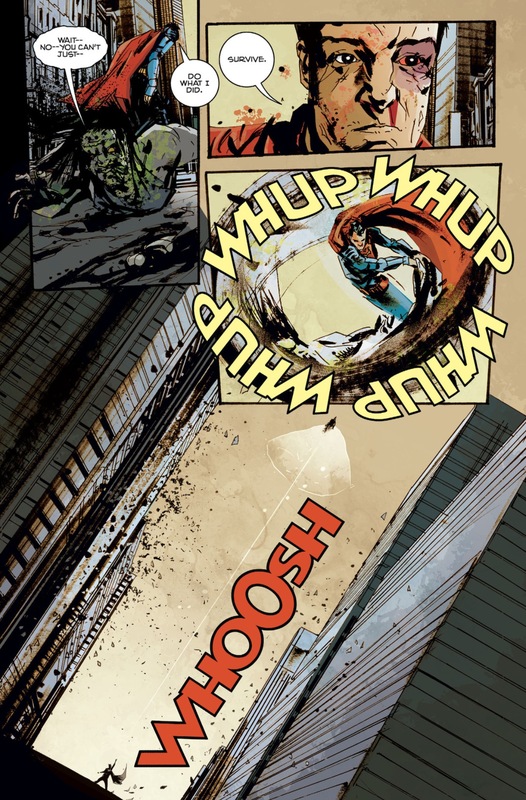 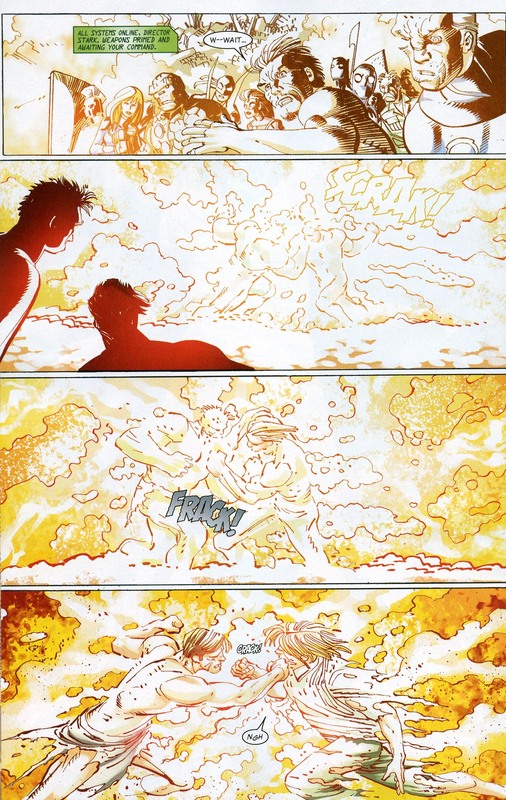 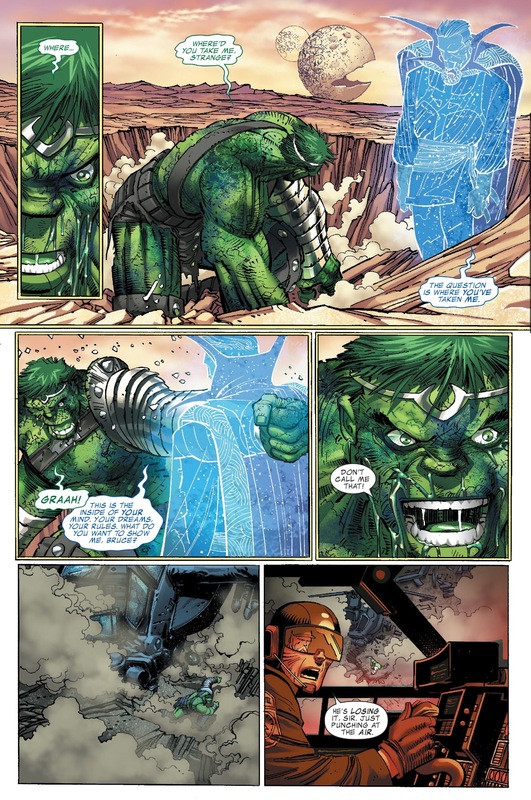 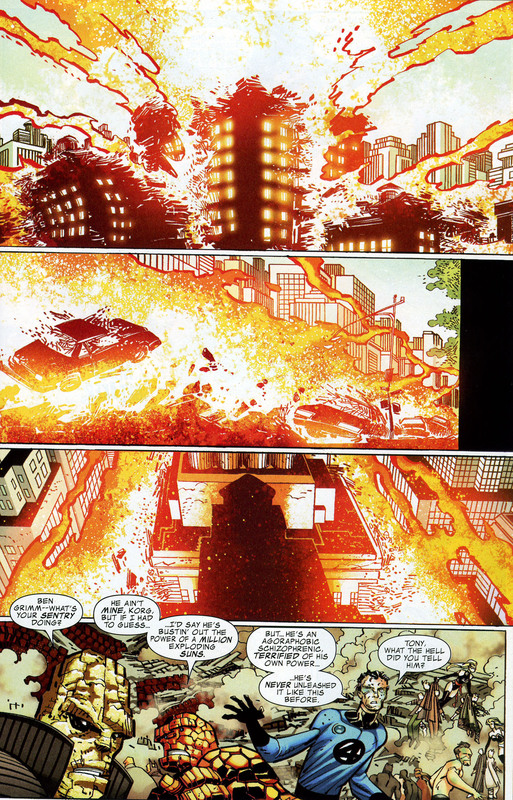 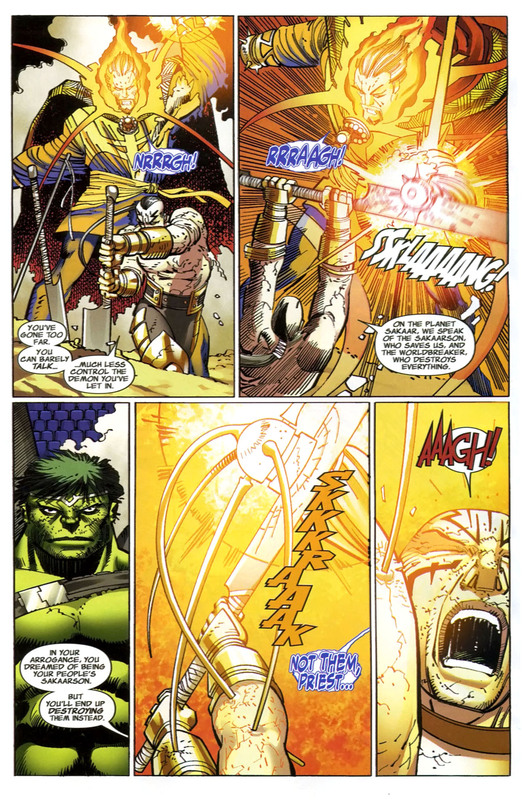 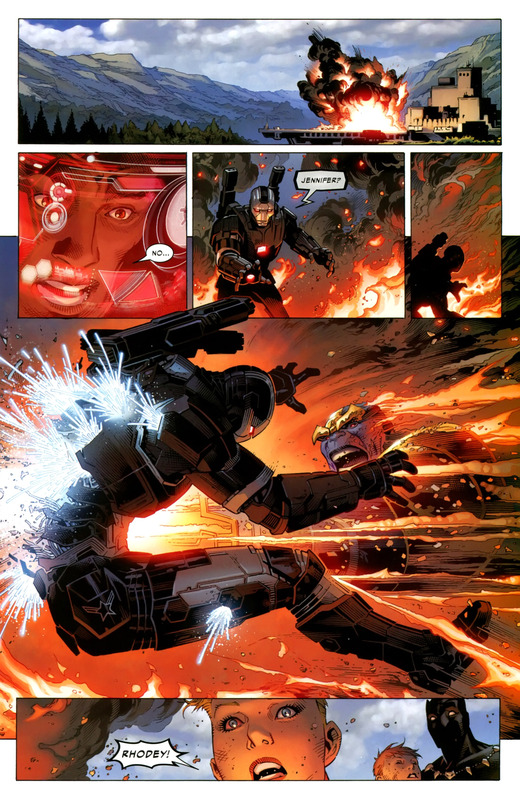 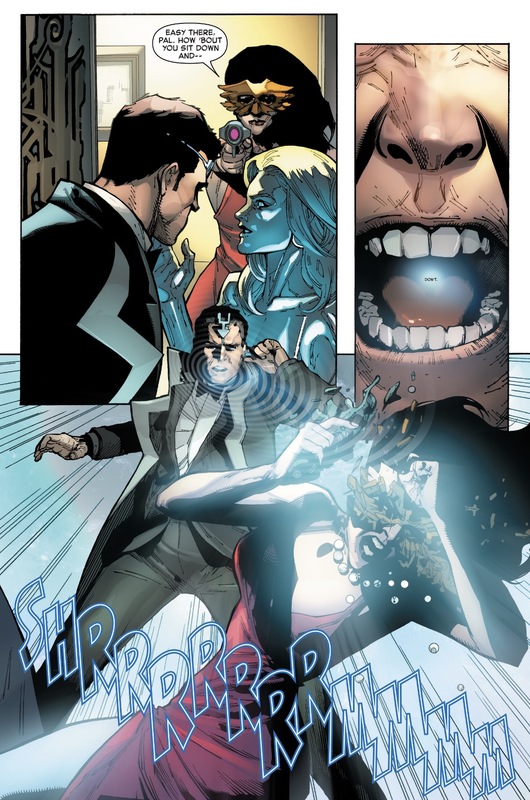 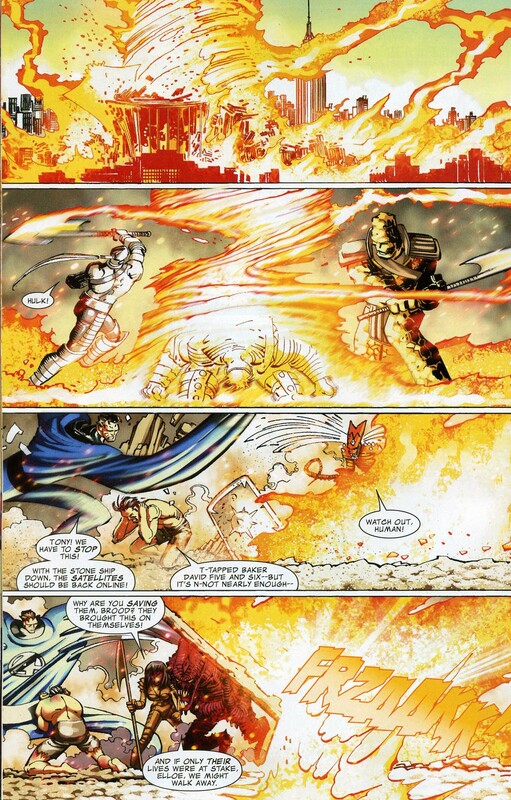 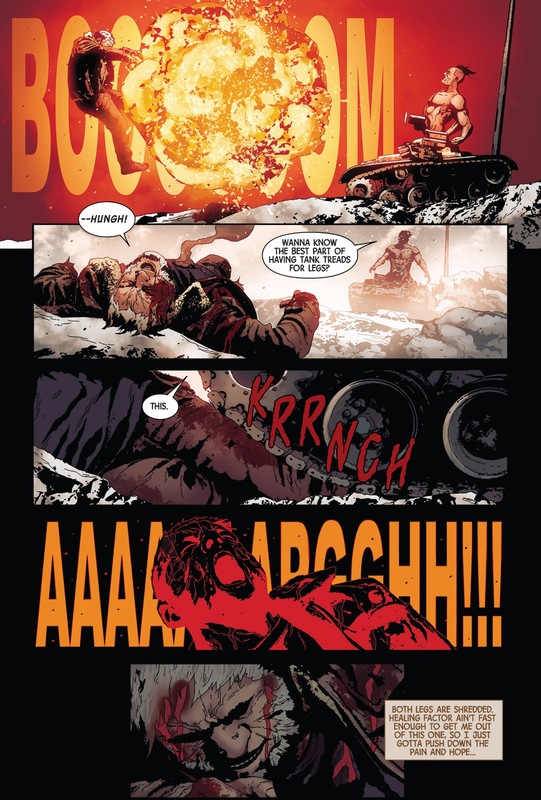 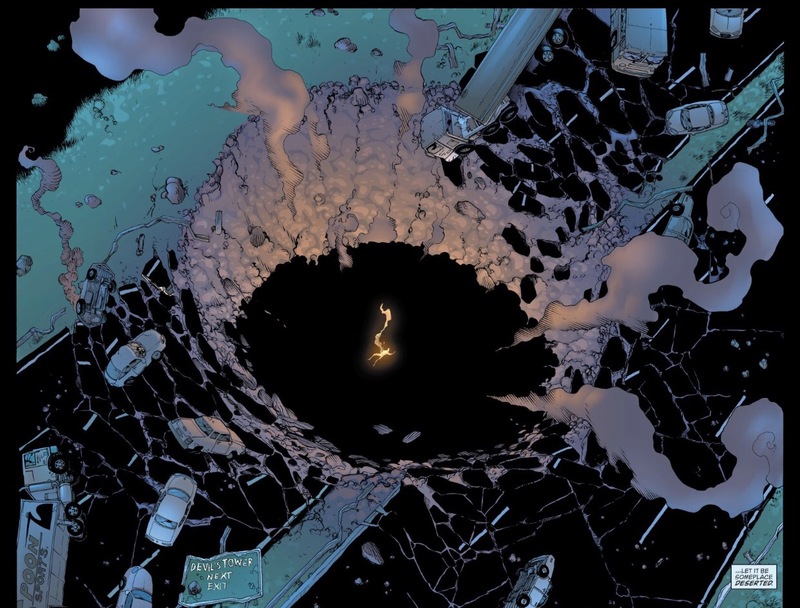 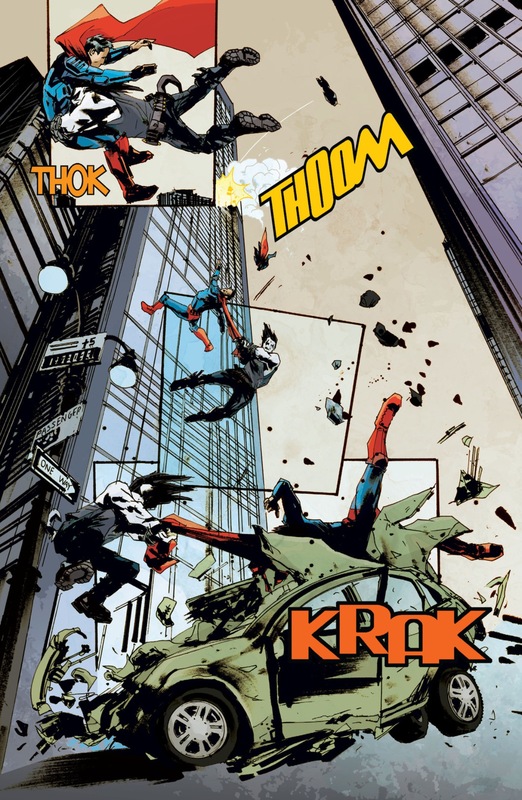 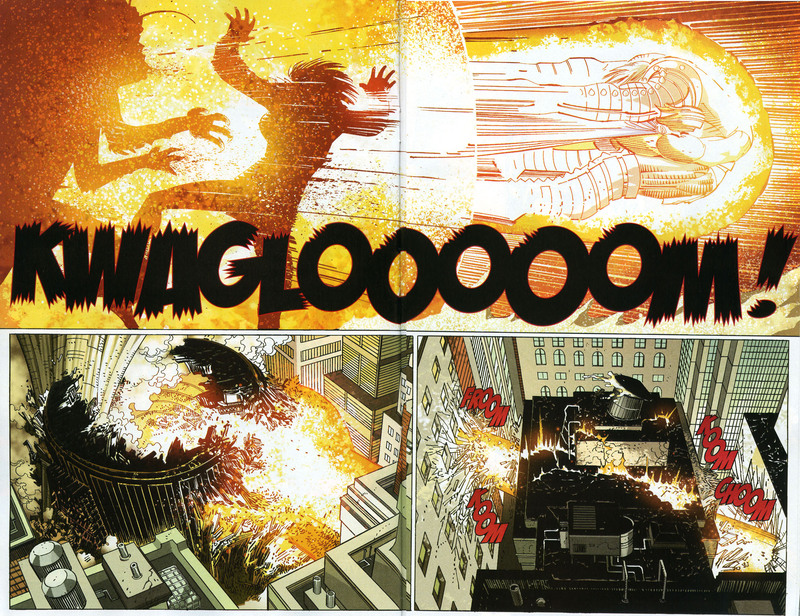 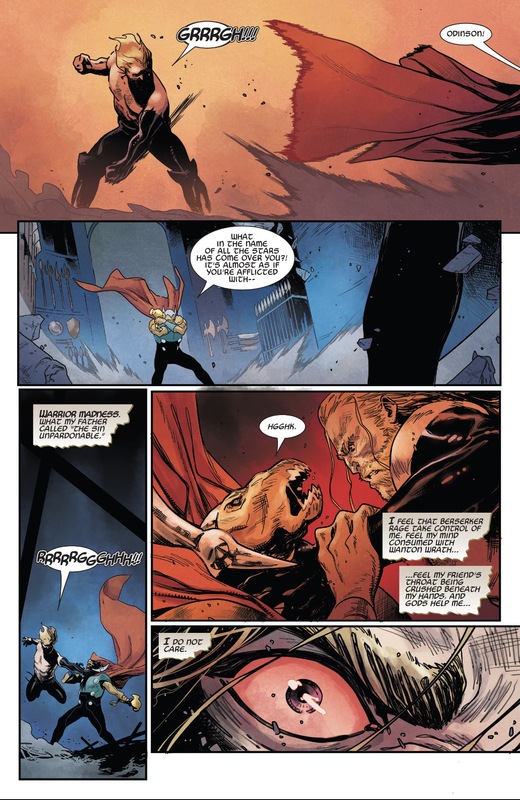 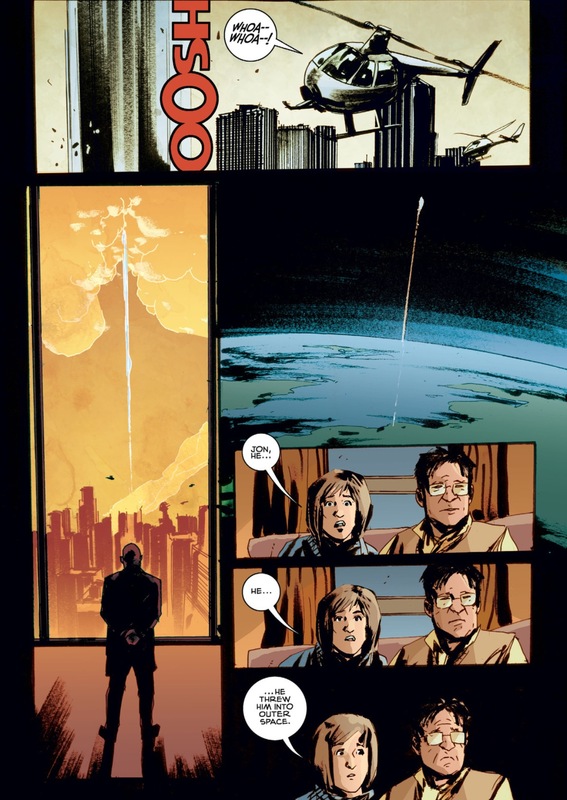 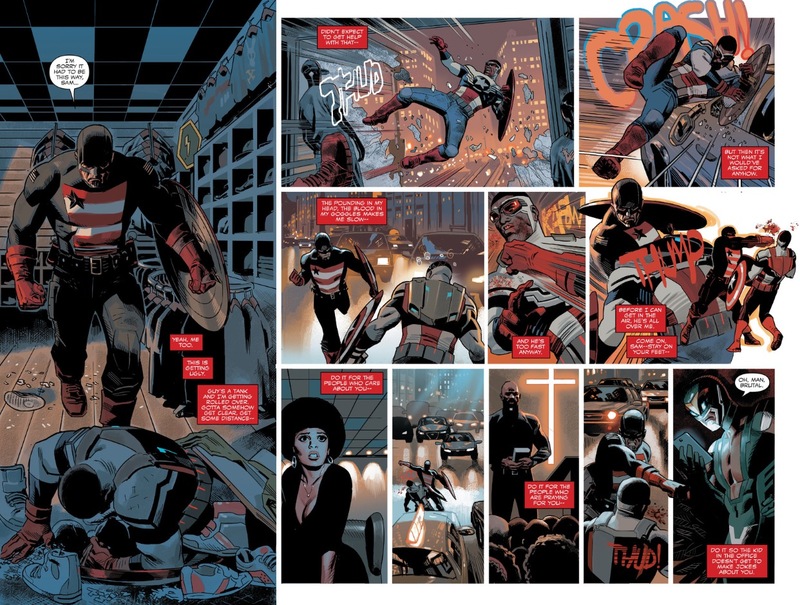 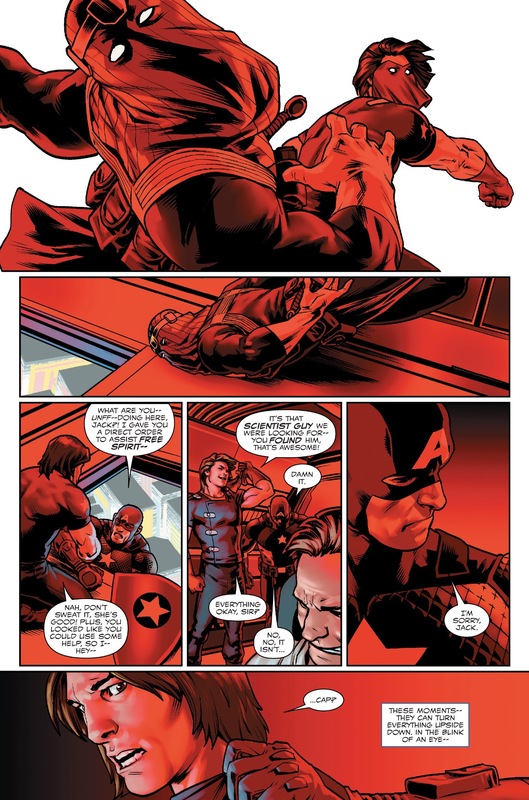 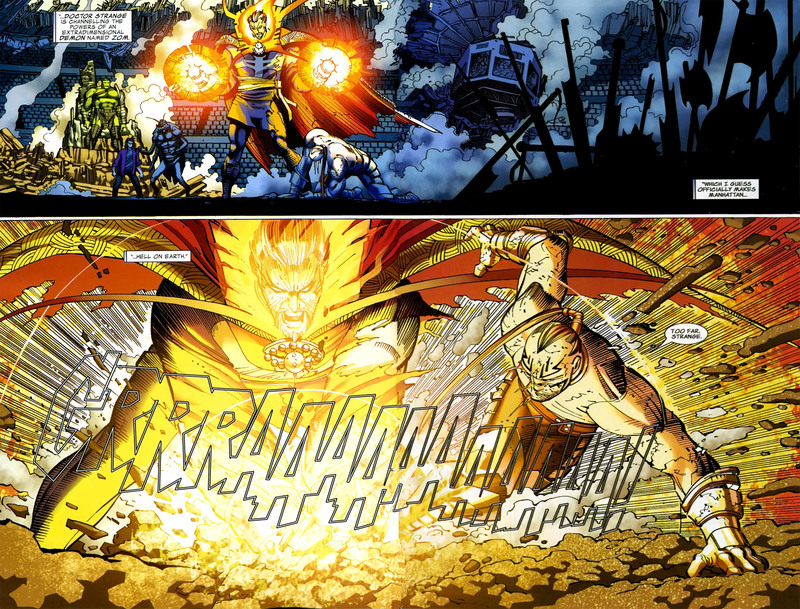 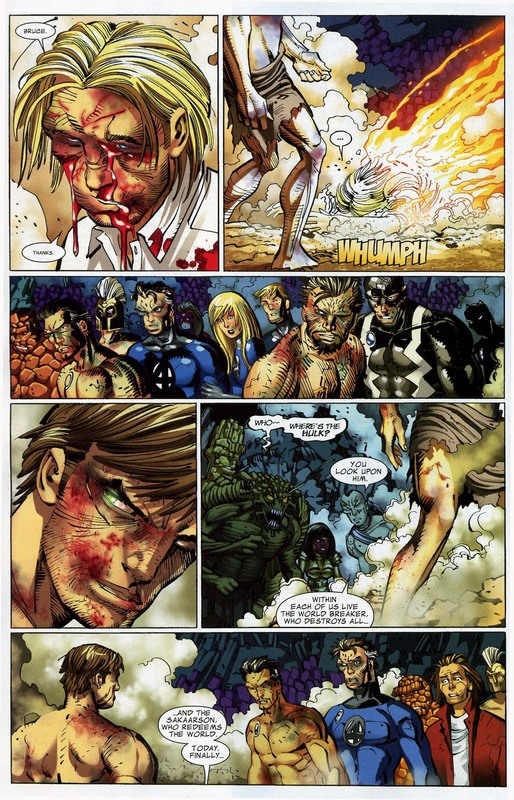 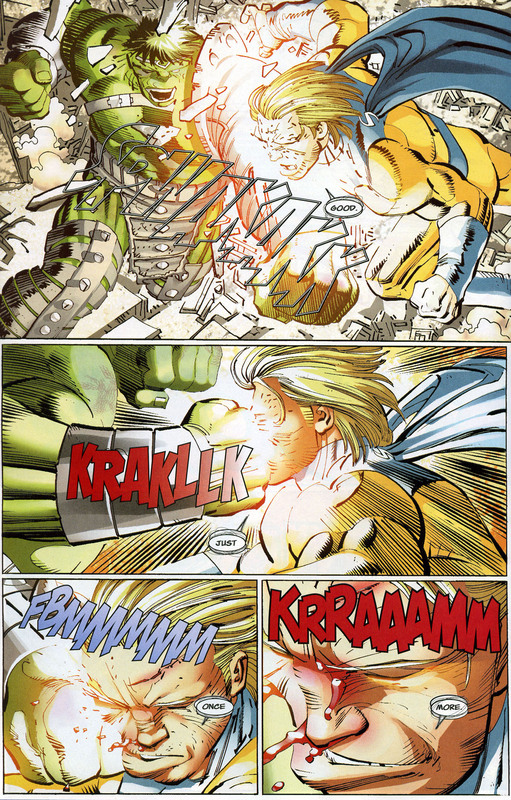 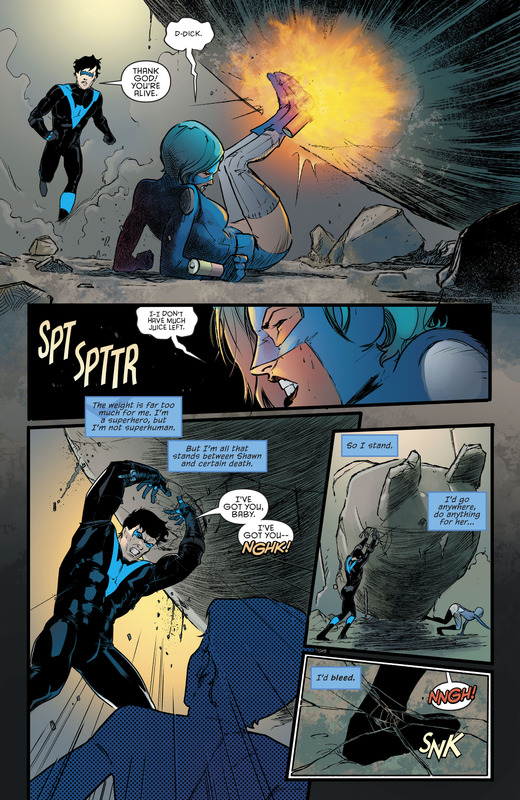 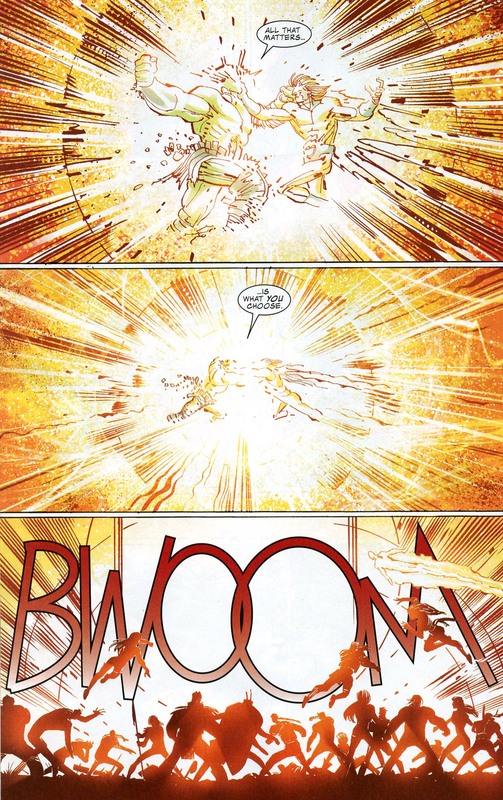 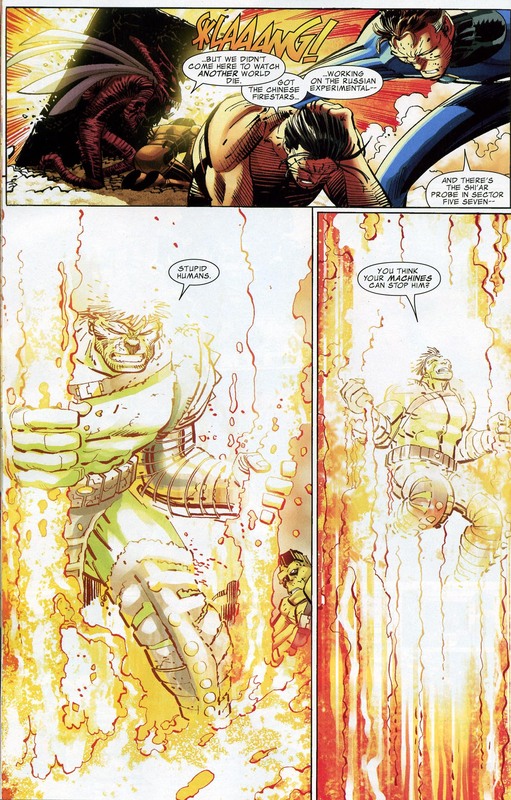 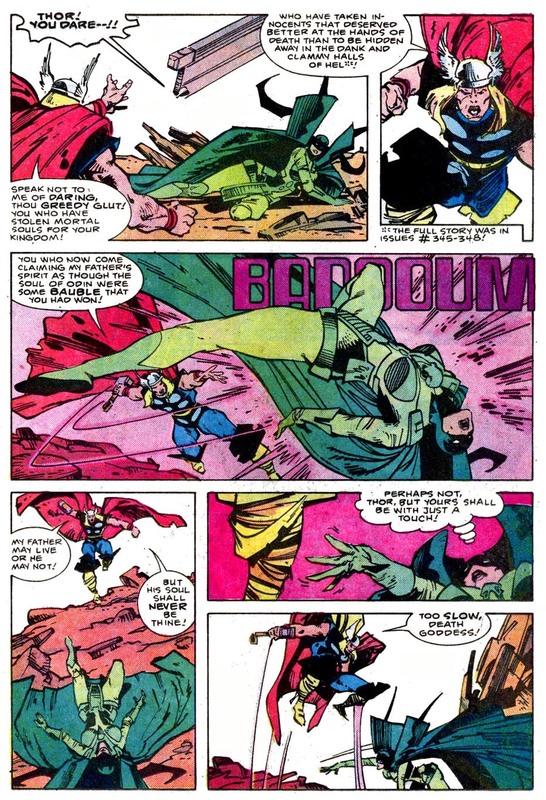 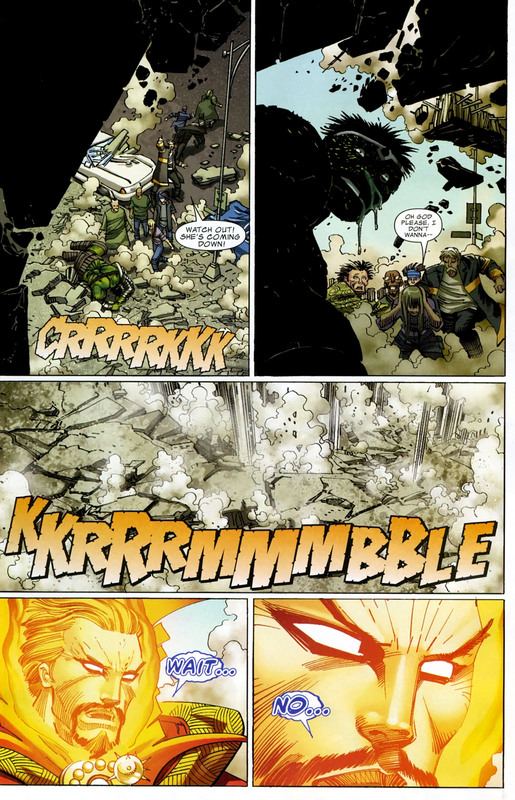 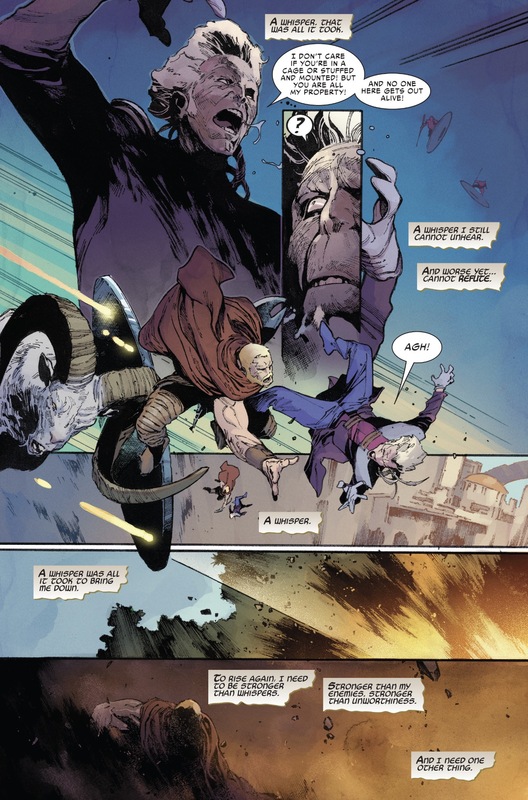 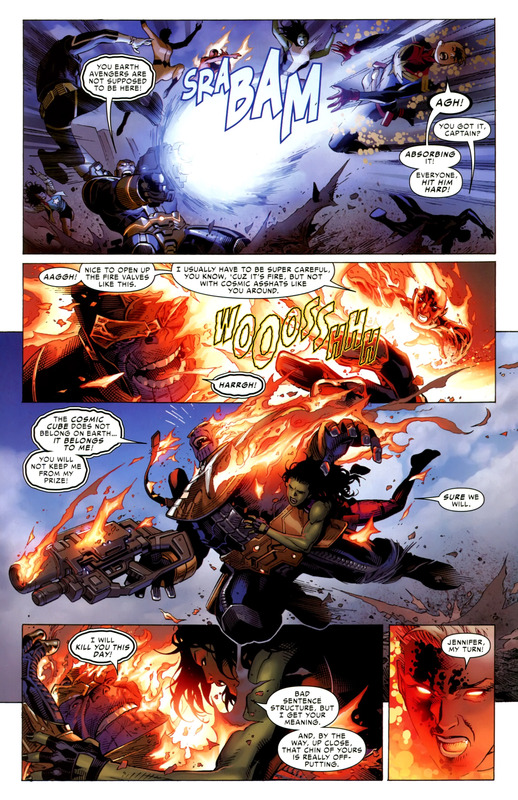 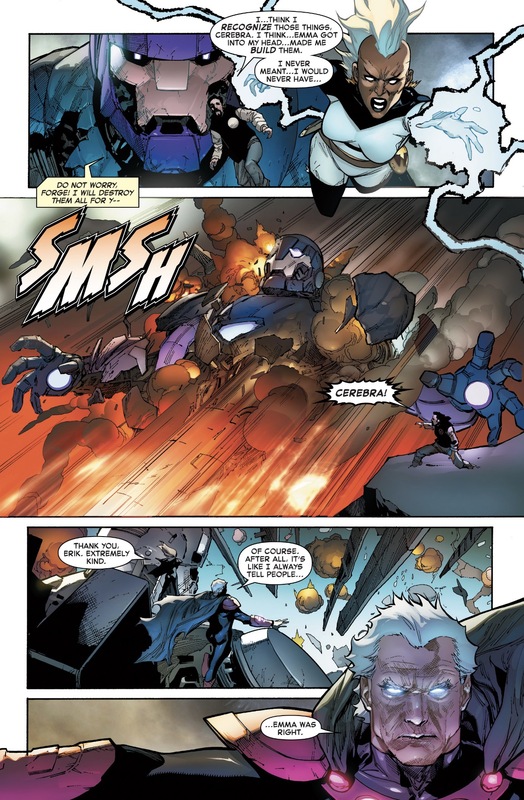 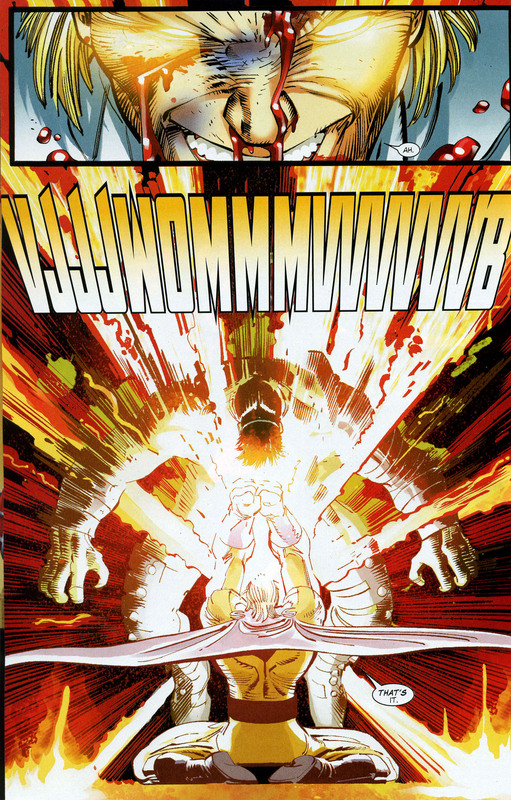 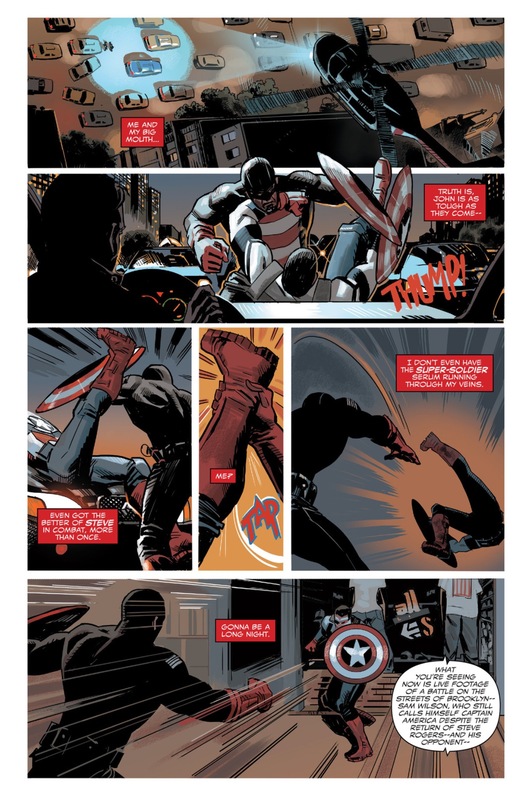 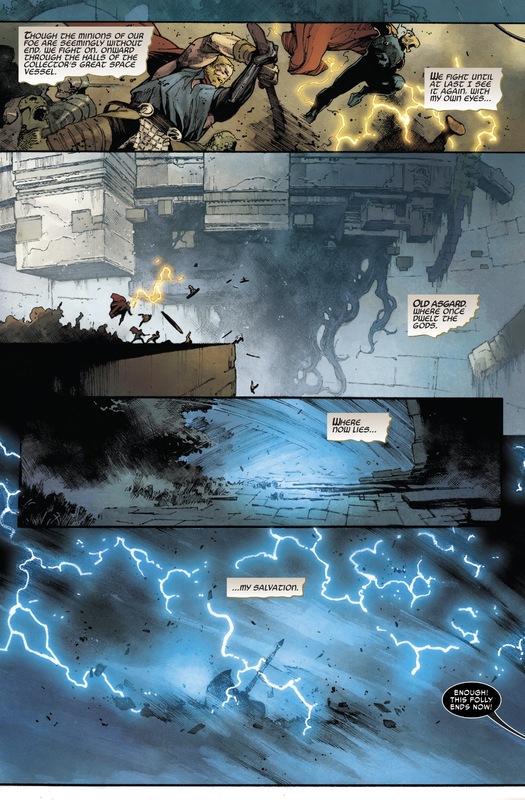 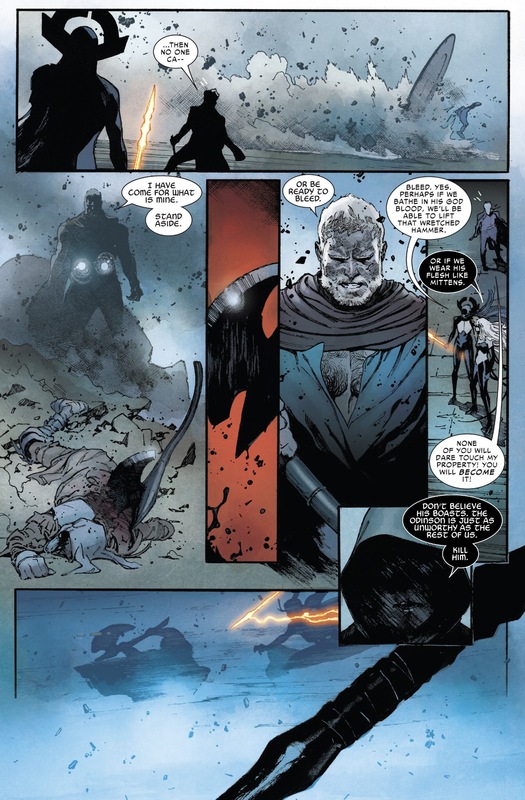 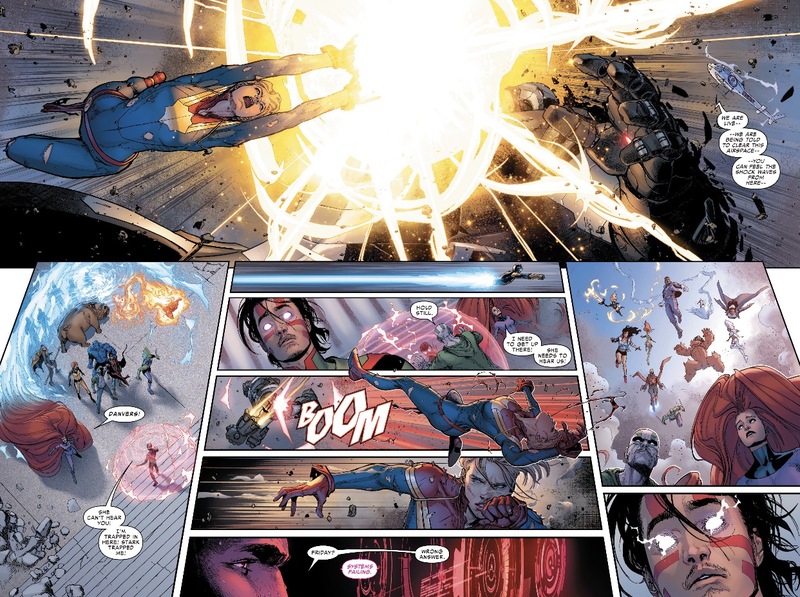 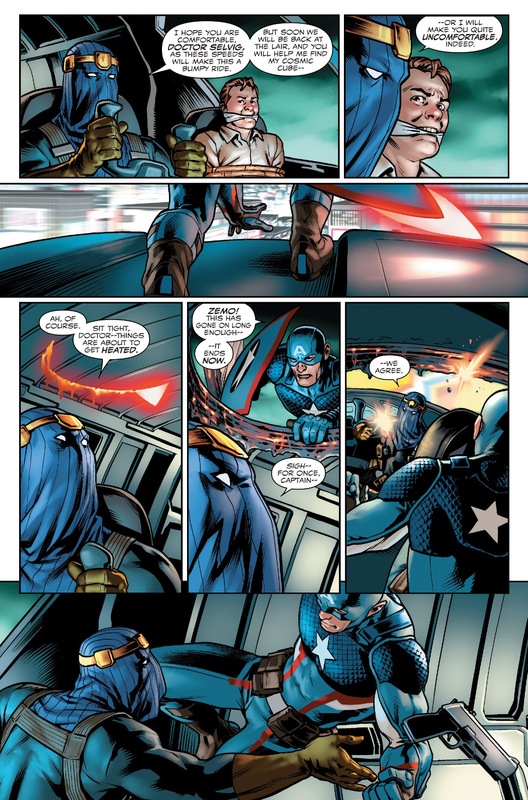 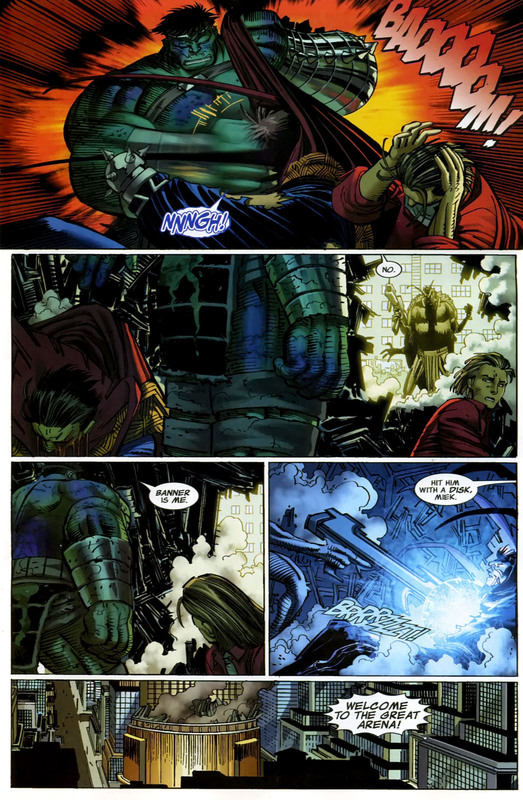 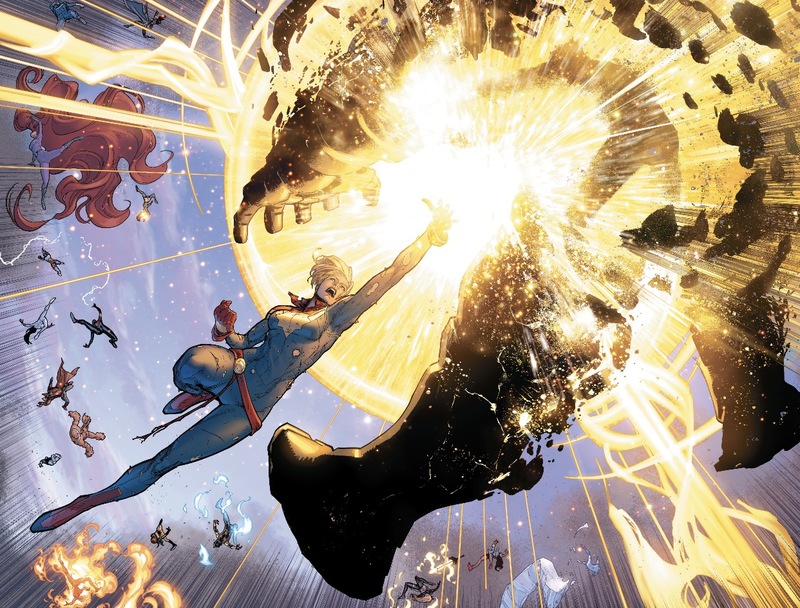 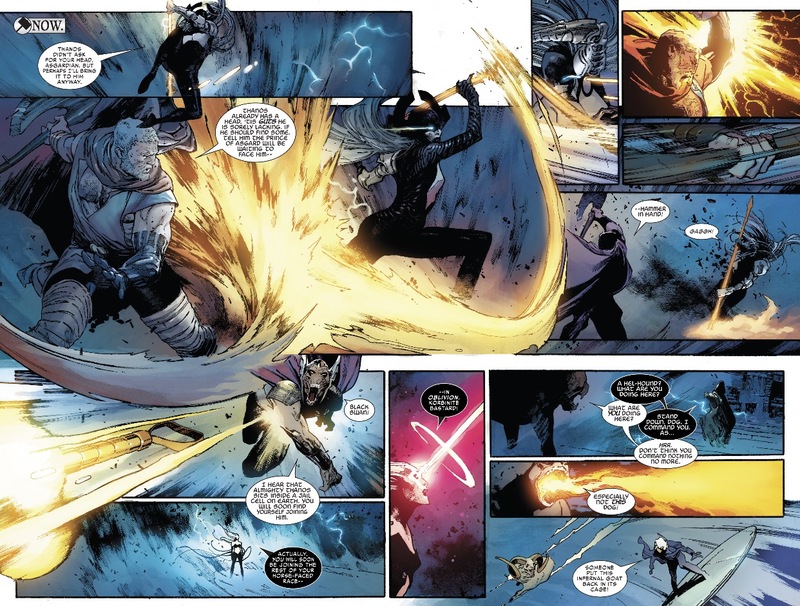 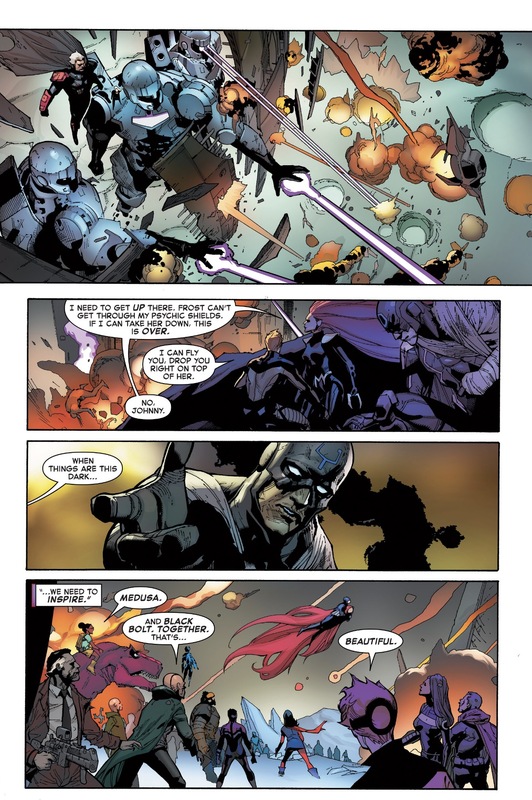 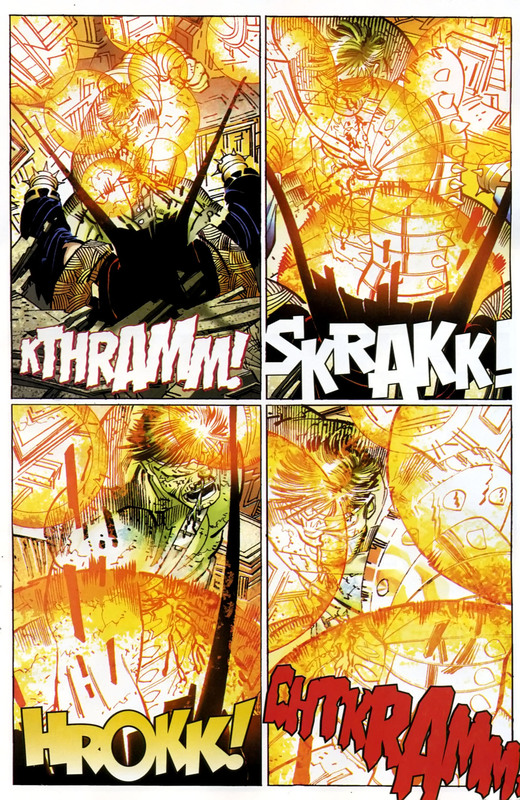 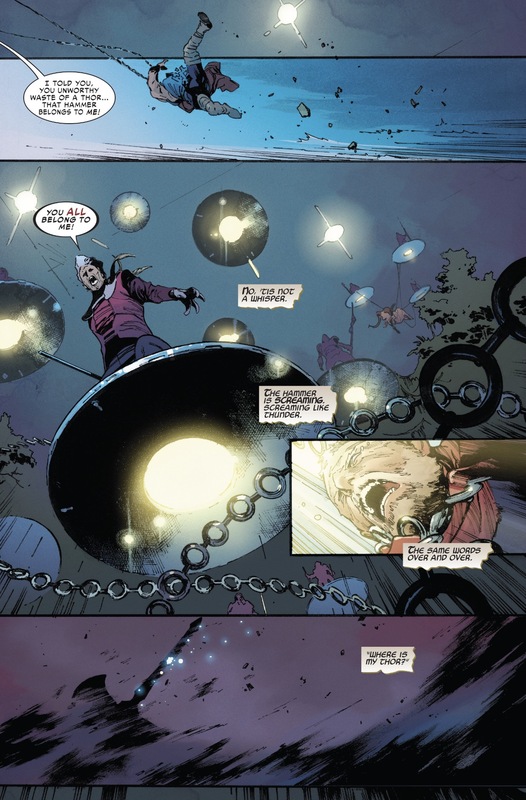 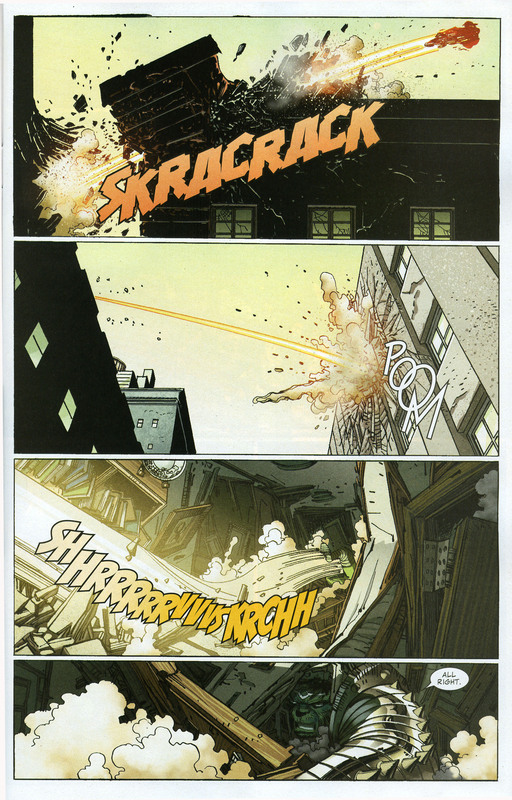 John Walker’s installation as Captain America indeed provided a major boost to the series’s sales and he remained the main character of Captain America for issues 333 through 350, during which his character generally becomes more heroic. 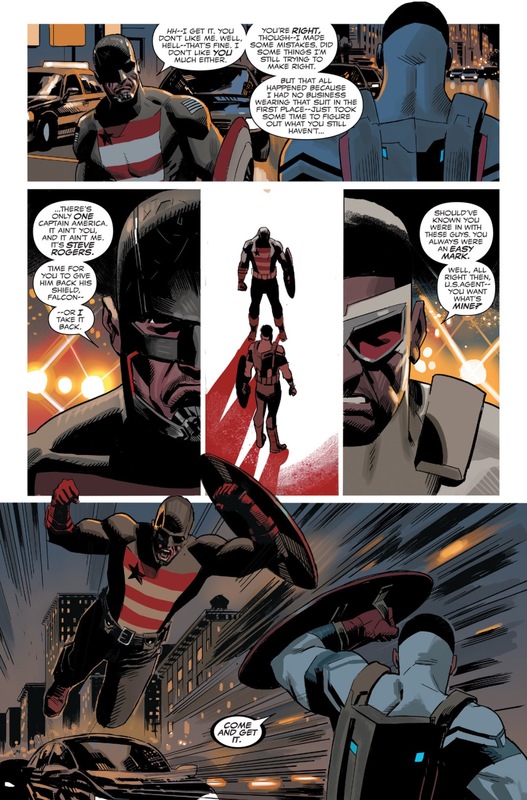 In Captain America #354 he is given another name and costume change, this time as U.S. 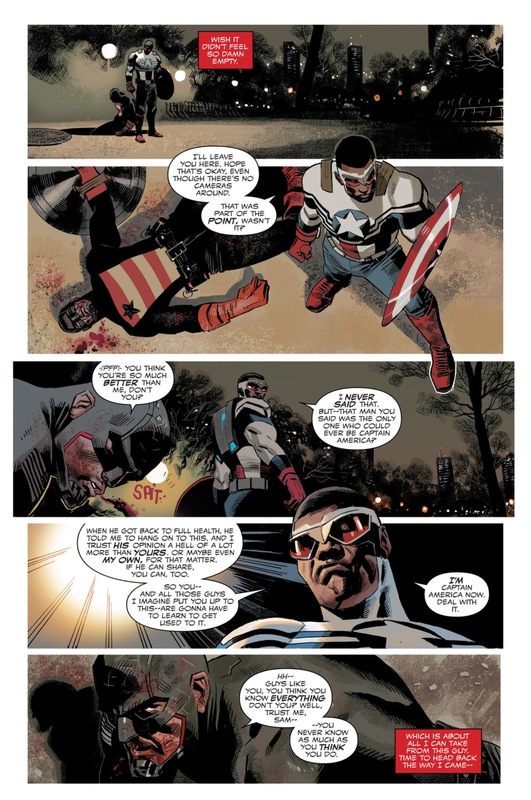 Agent using a discarded costume of Steve Rogers (the original Captain America), a black outfit with a different alignment of the stars and stripes to differentiate it from Steve Rogers’ suit. 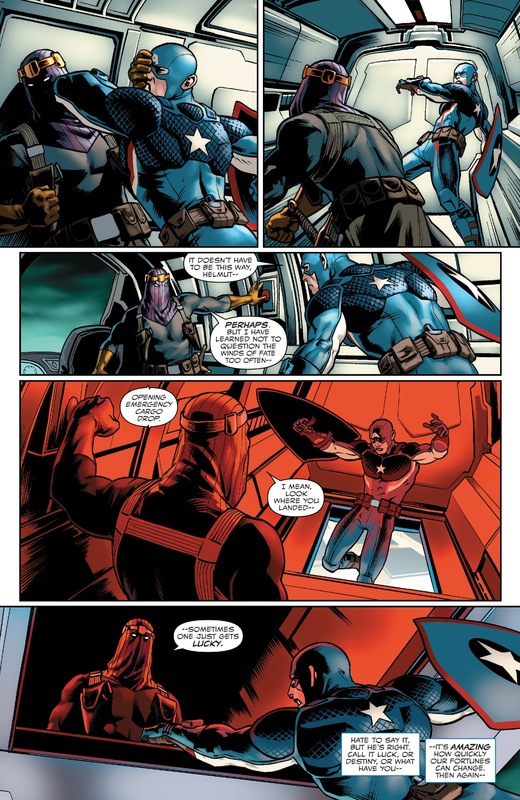 Like some West Coast Avengers teammates who had their own series (such as Iron Man, or Hawkeye in Solo Avengers), the character U.S. 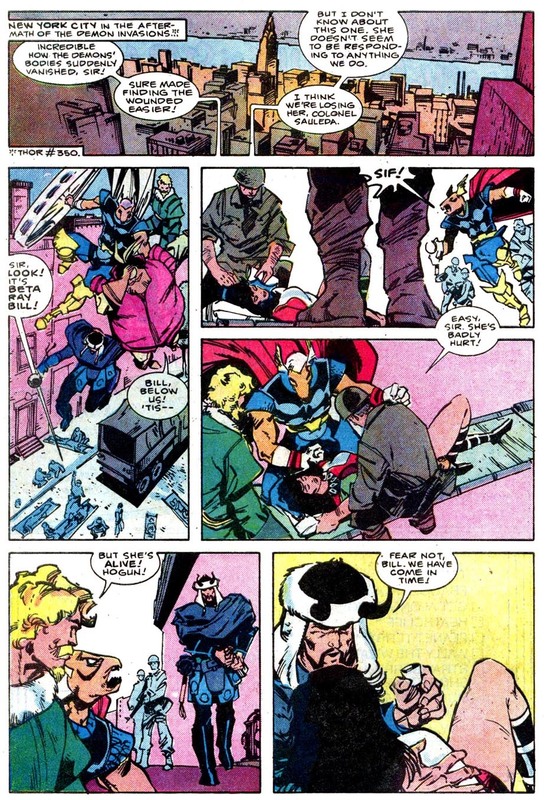 Agent was popular enough to earn his own limited series in 1993. 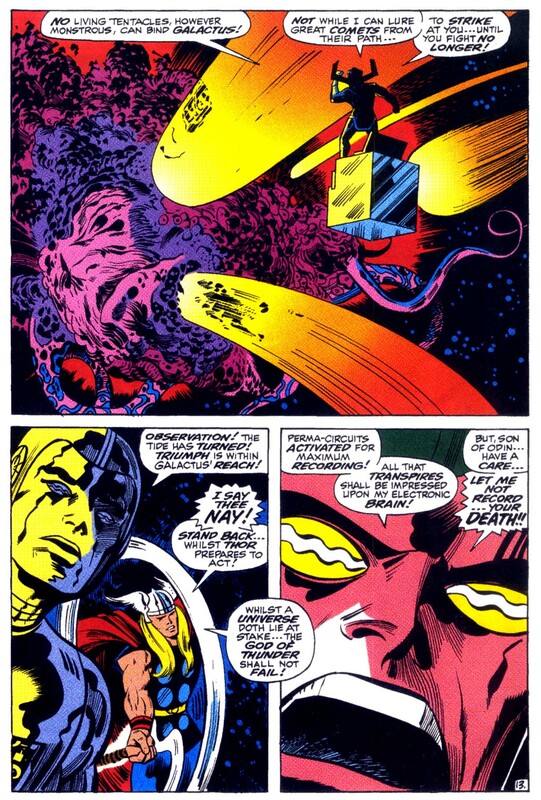 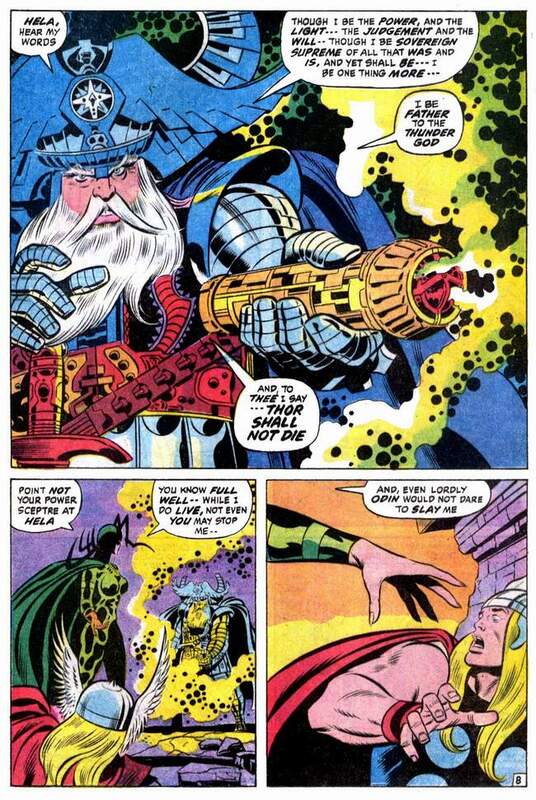 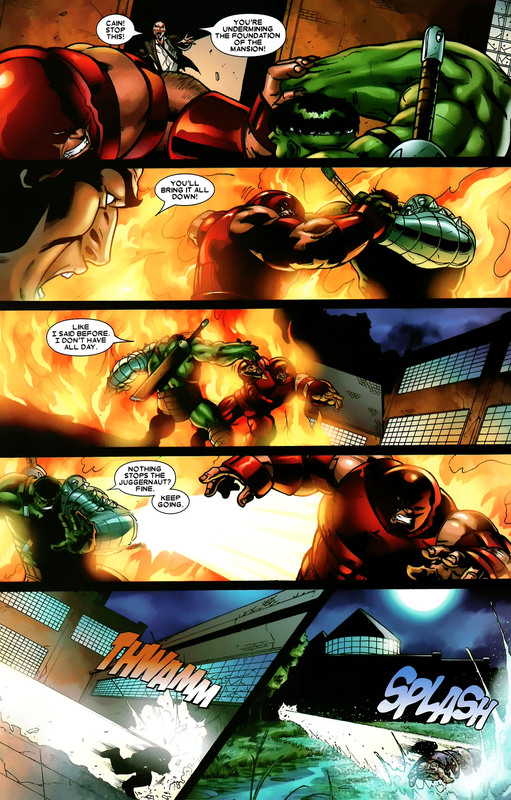 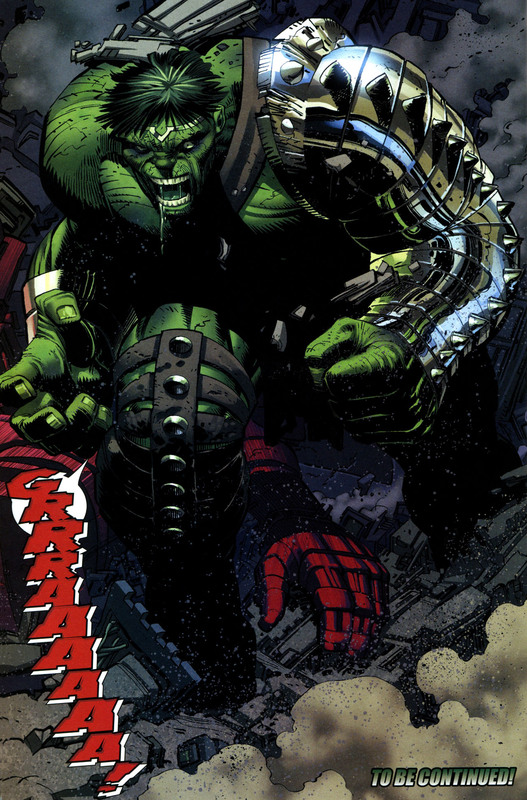 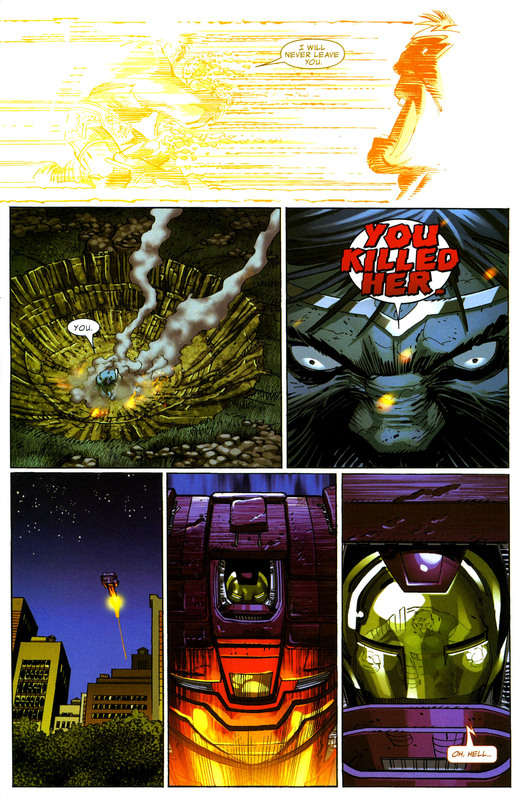 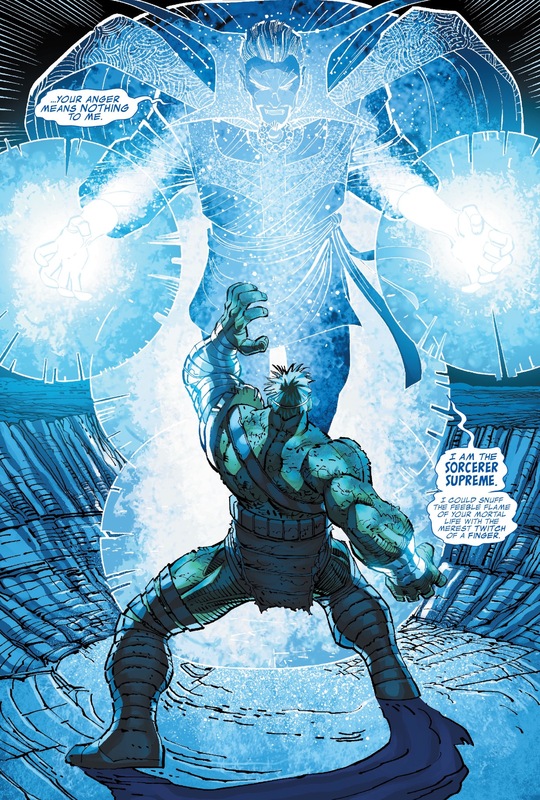 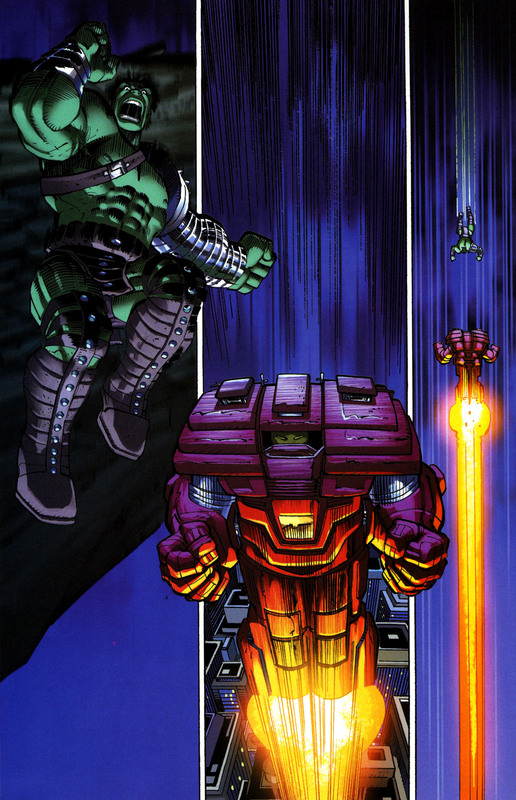 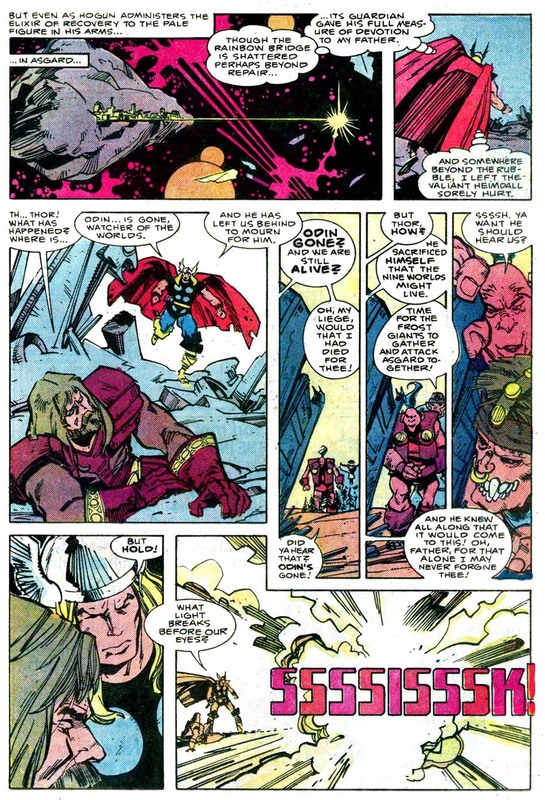 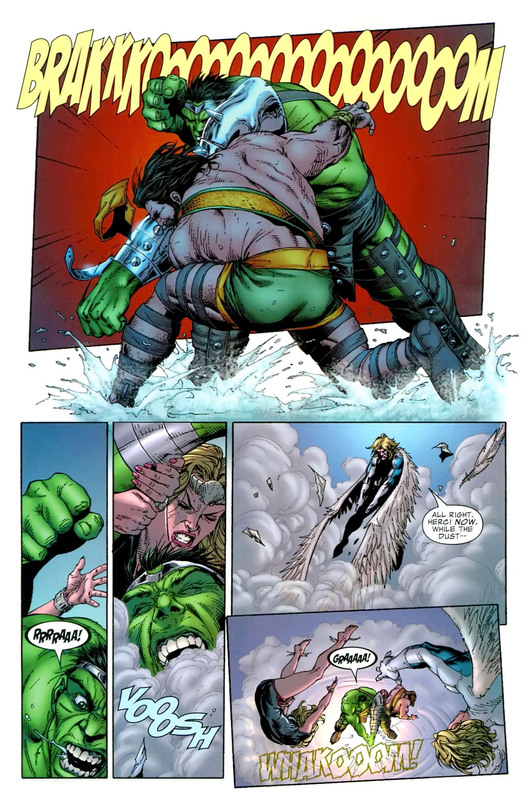 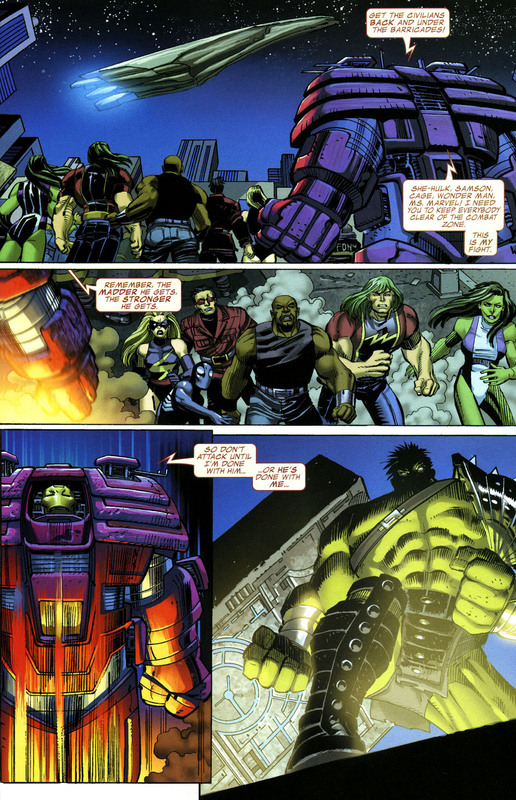 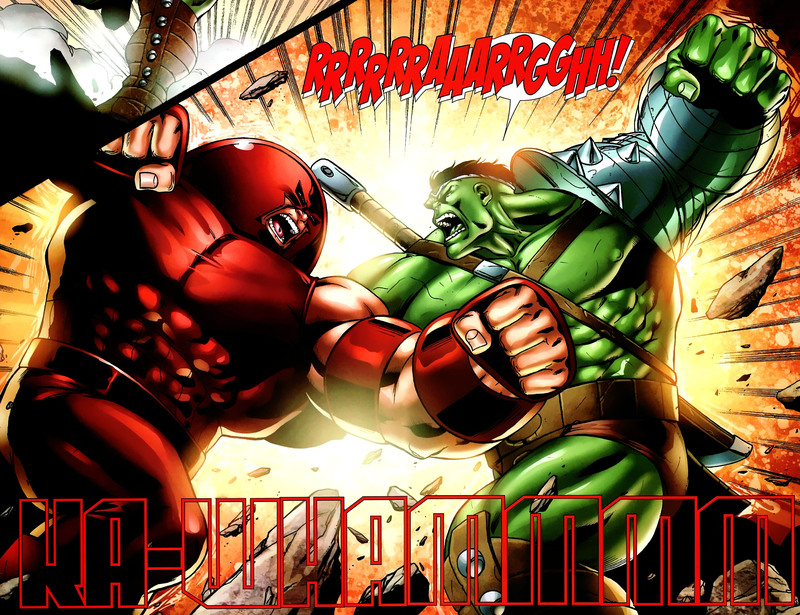 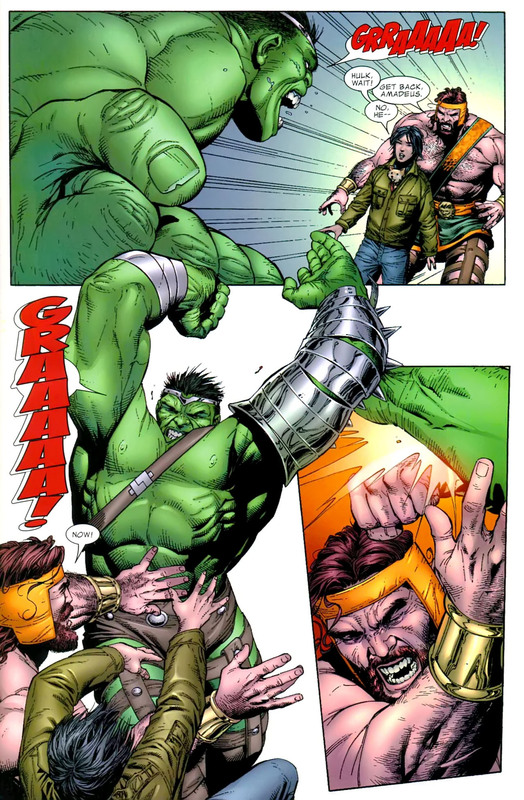 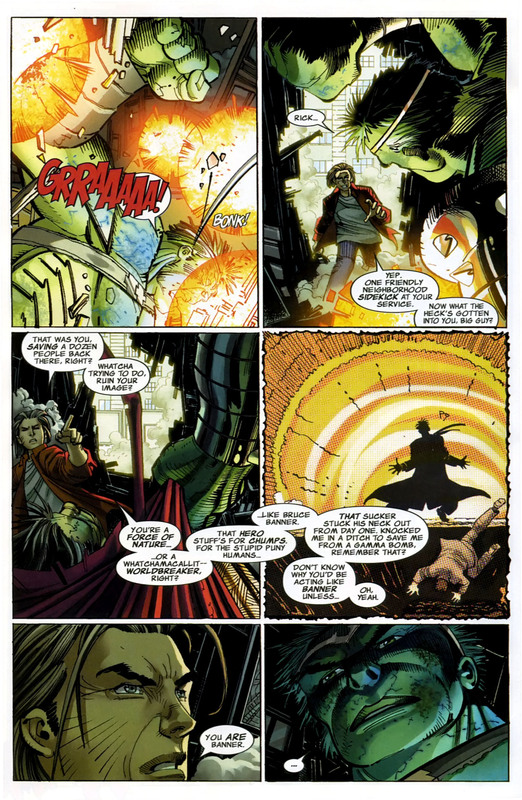 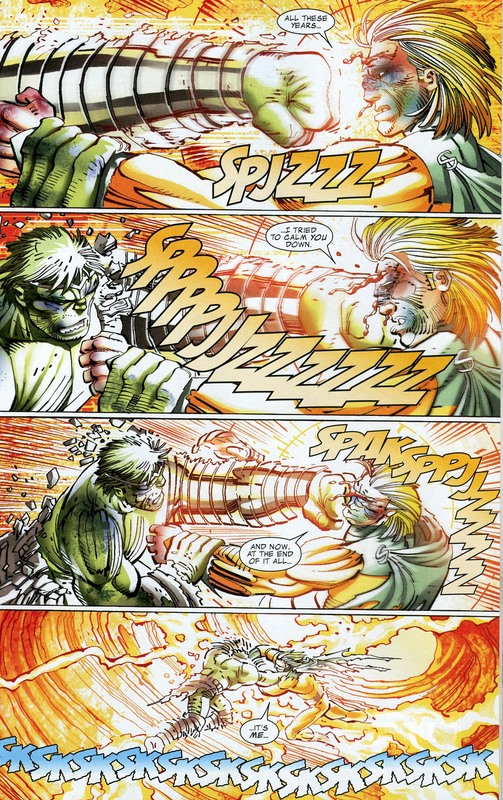 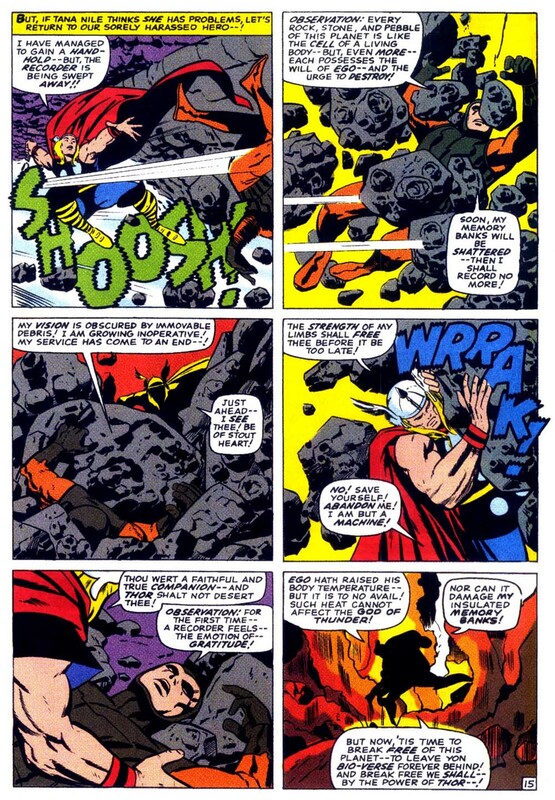 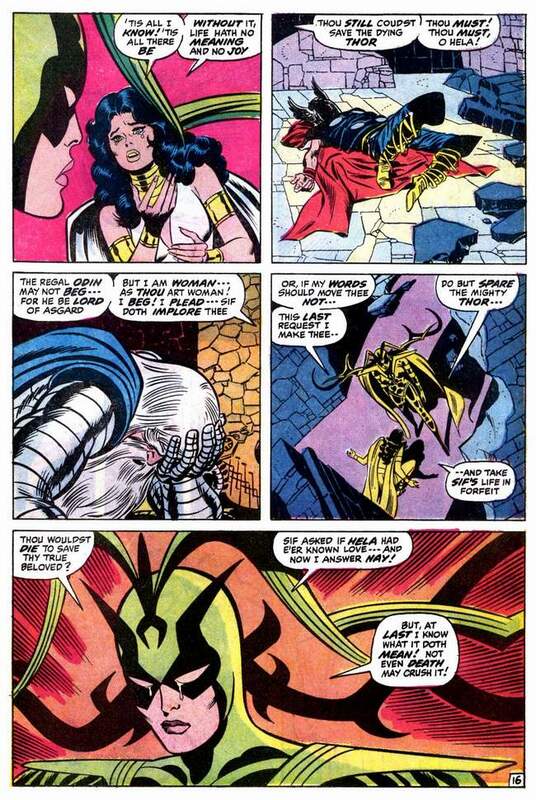 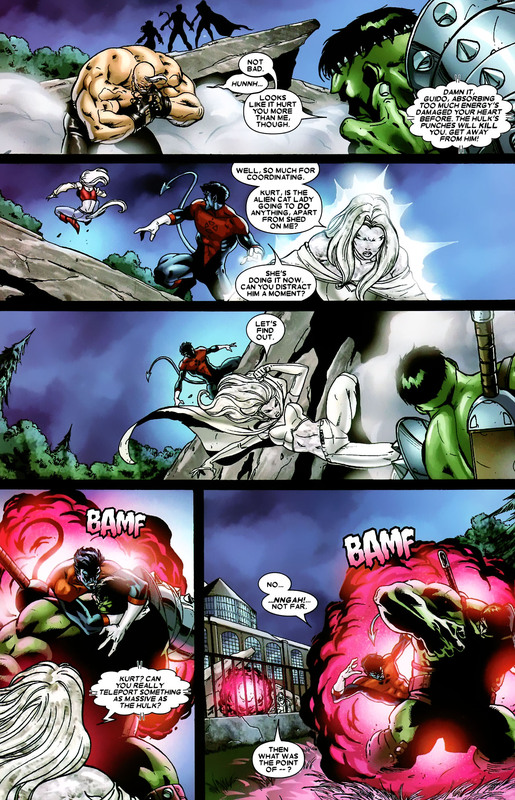 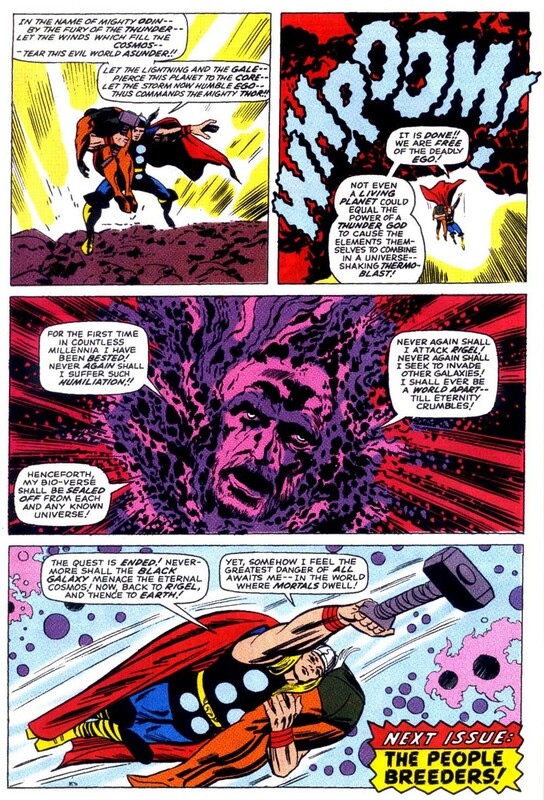 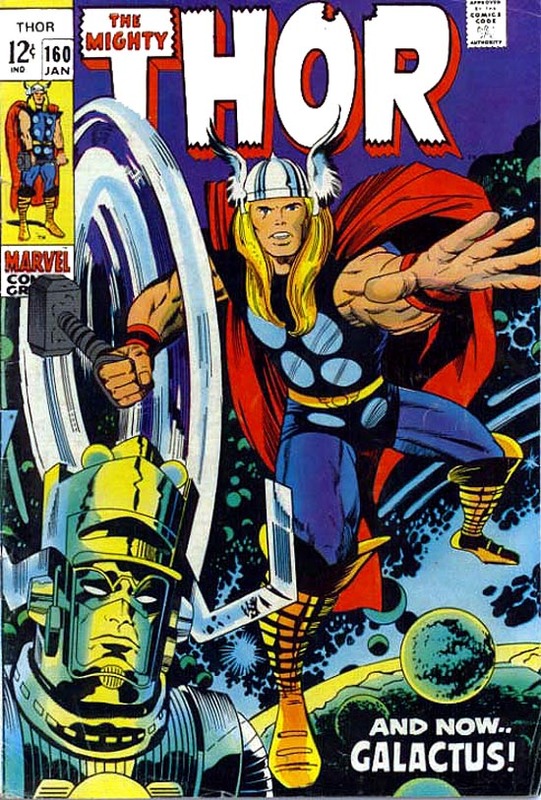 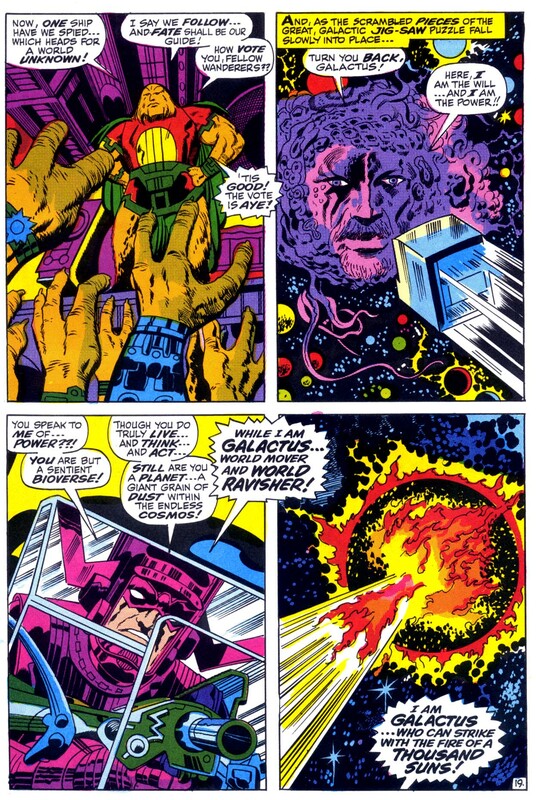 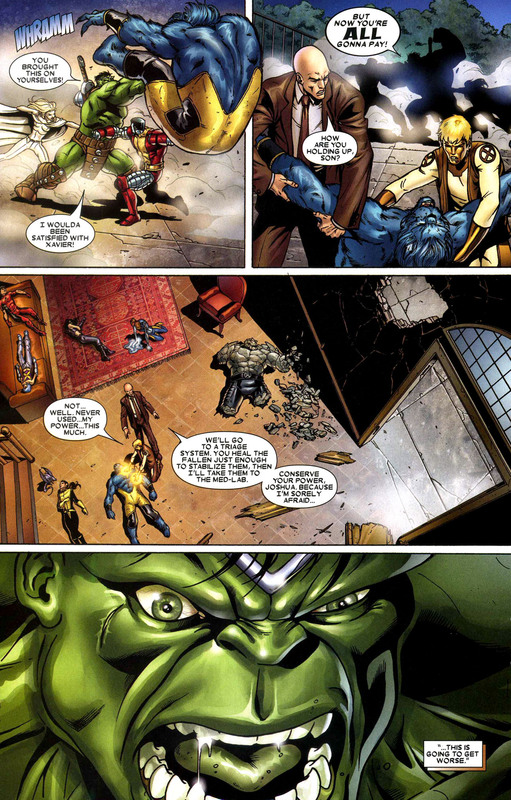 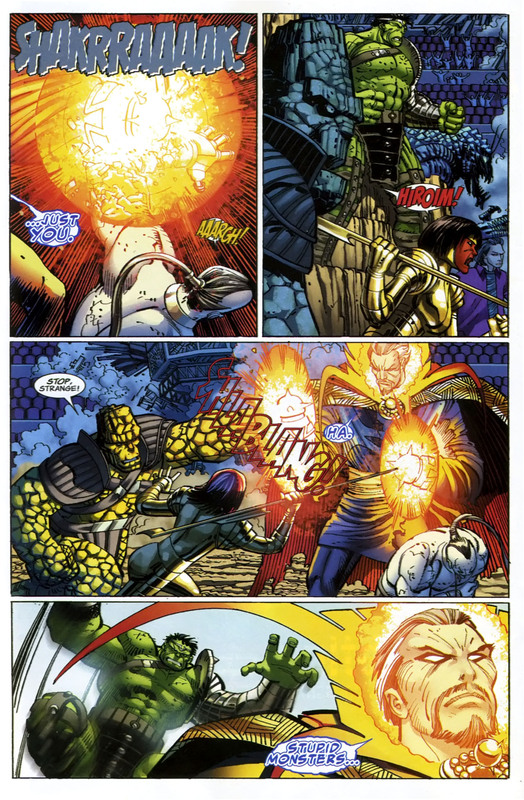 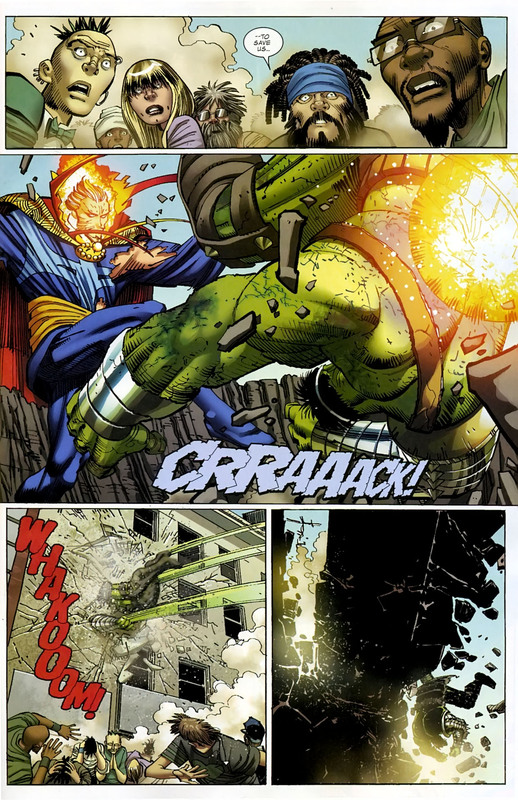 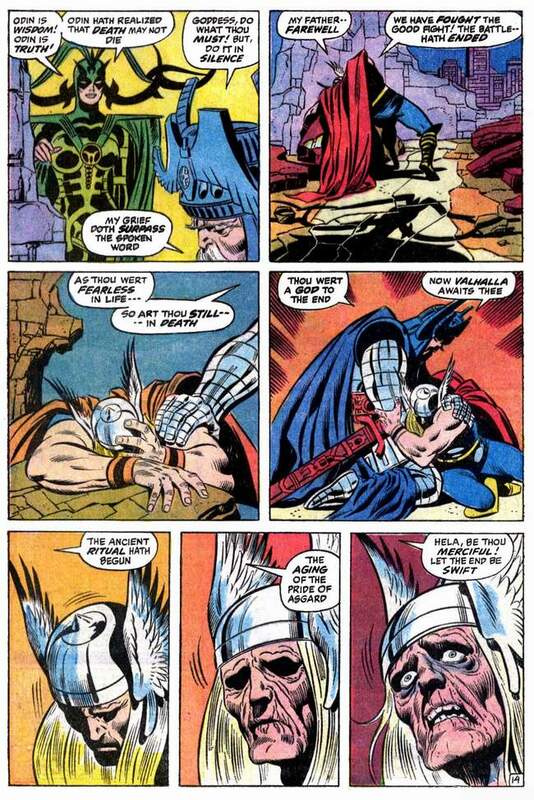 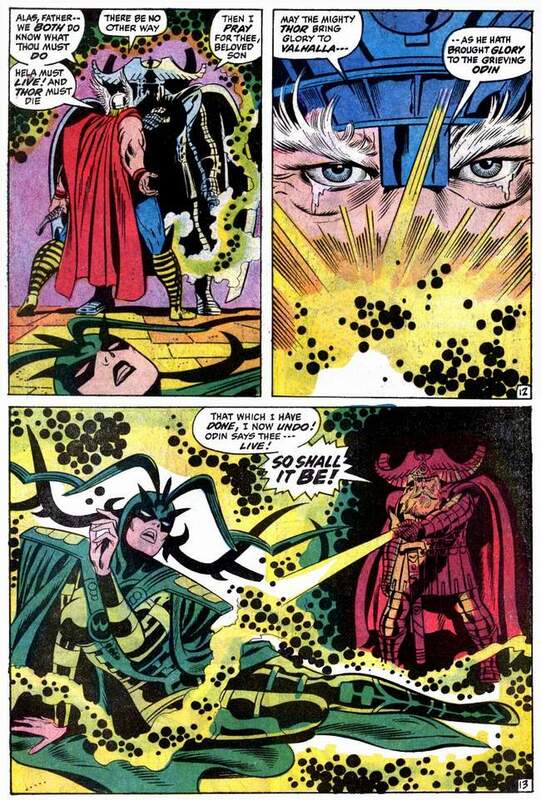 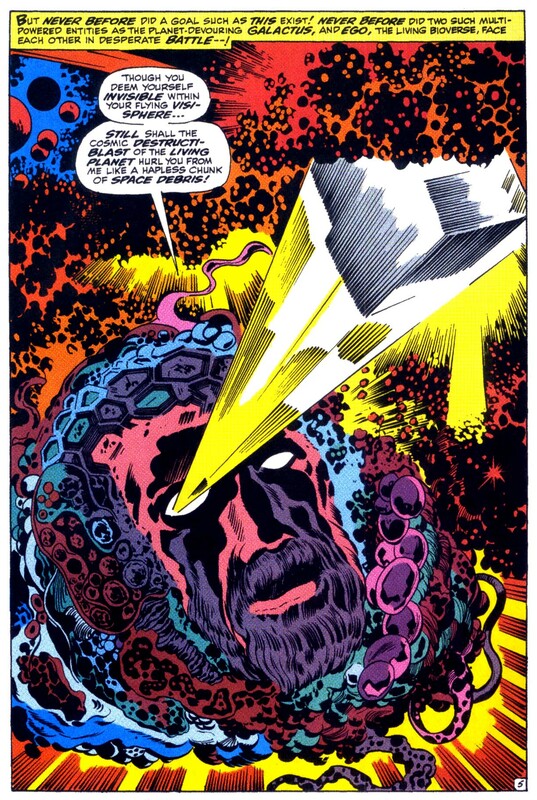 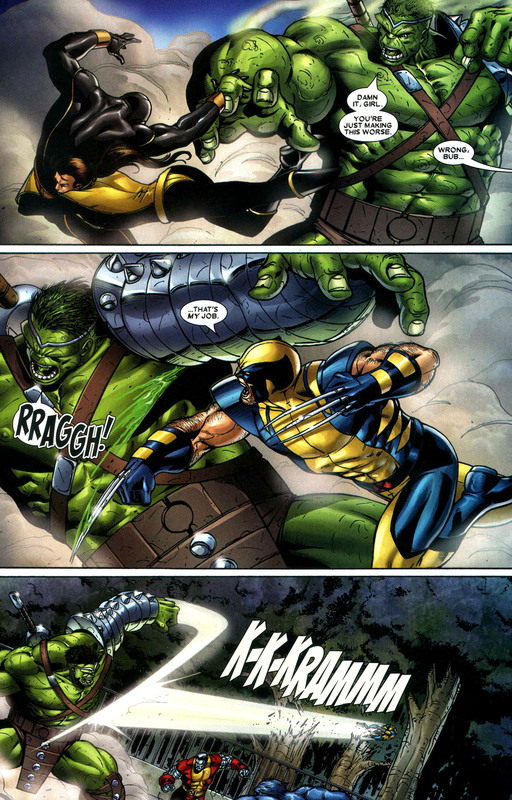 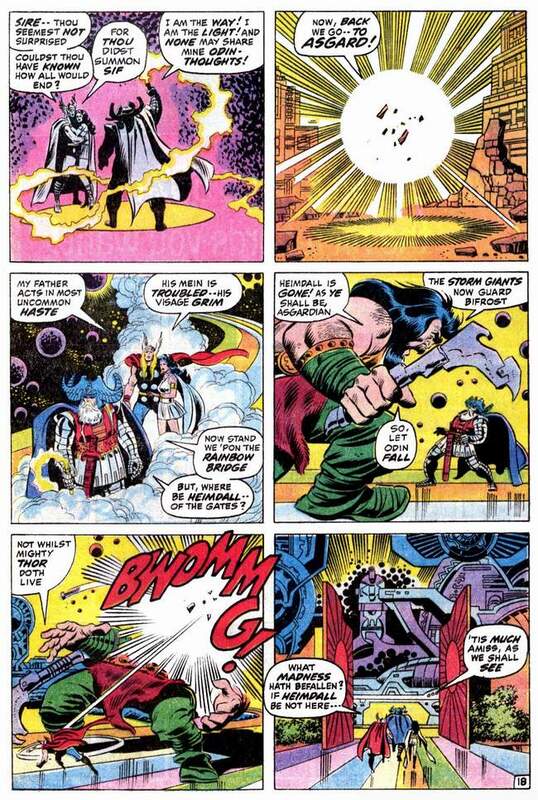 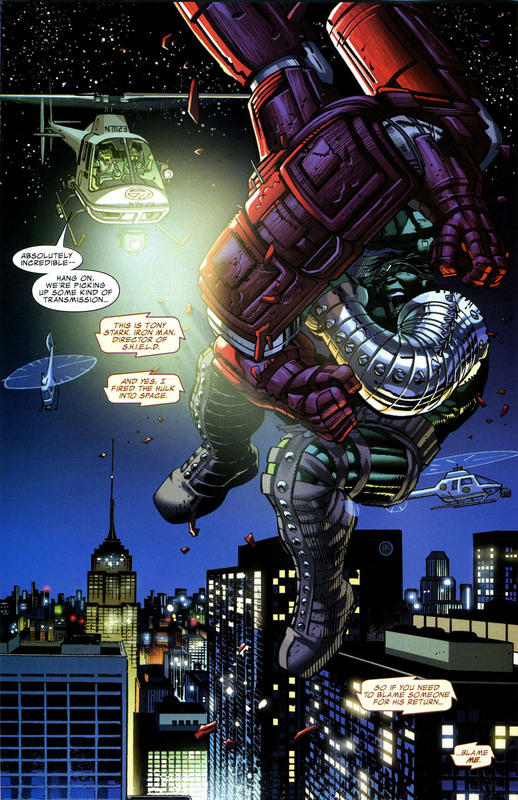 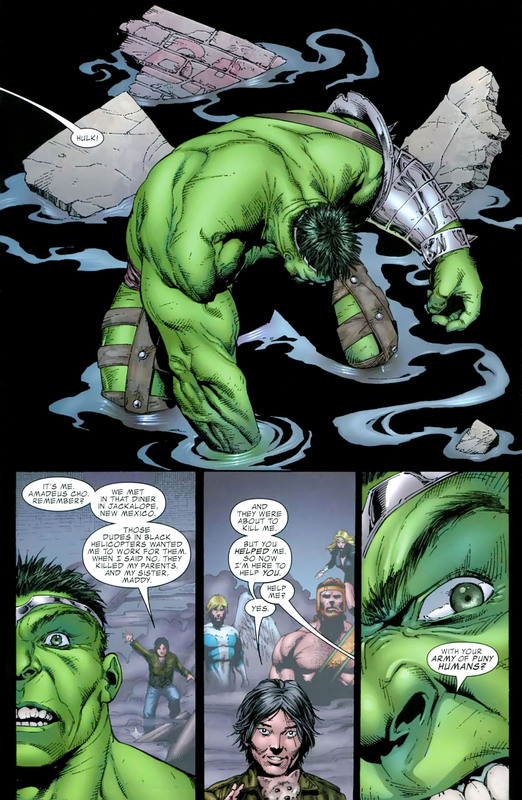 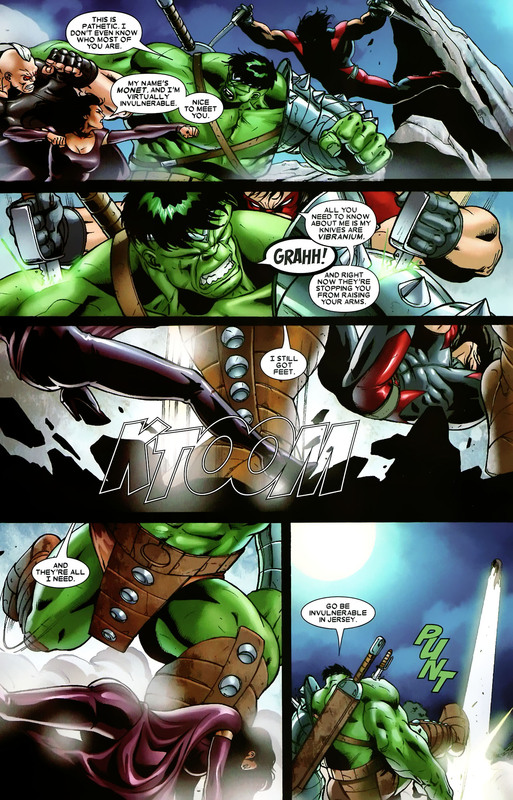 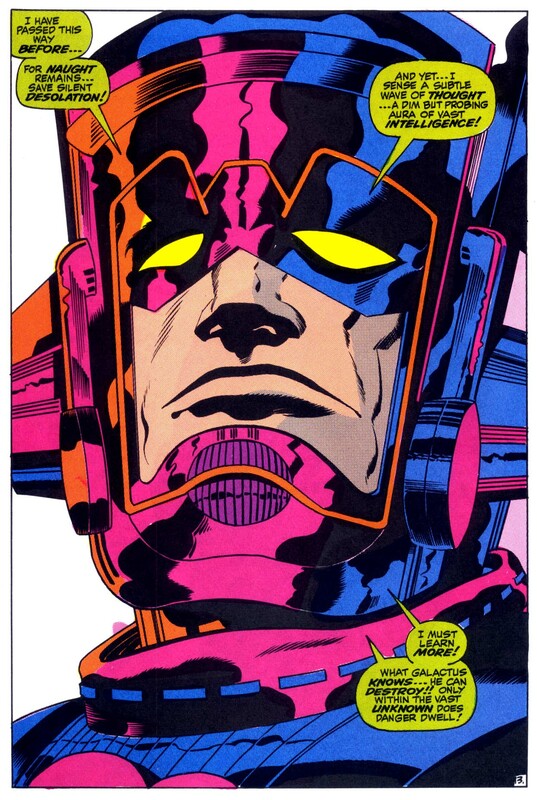 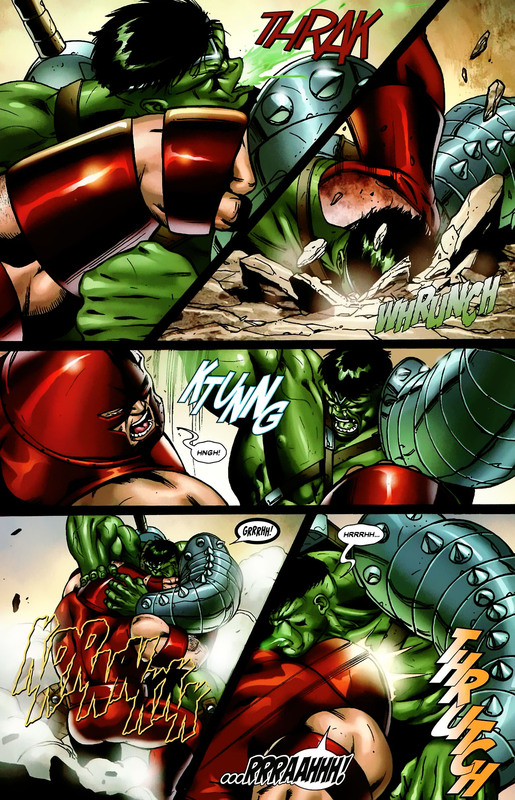 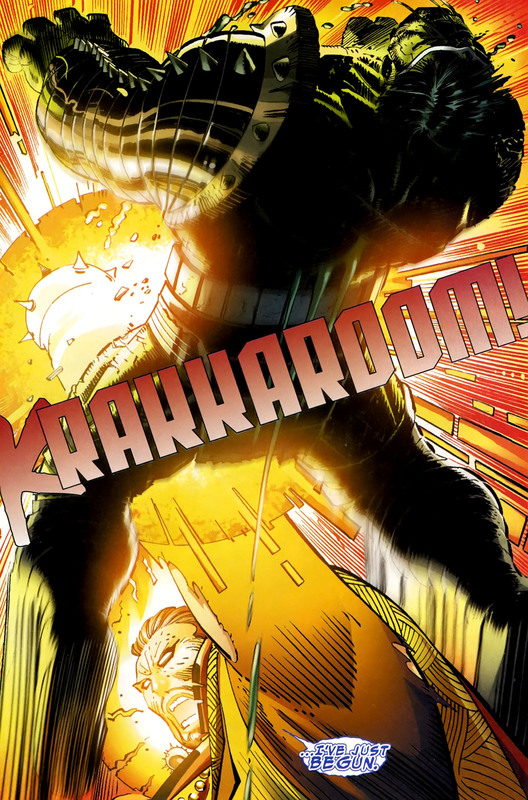 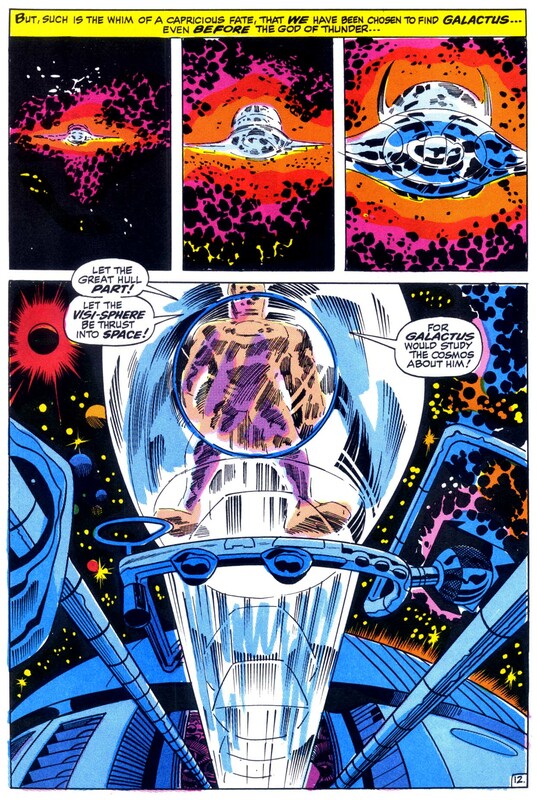 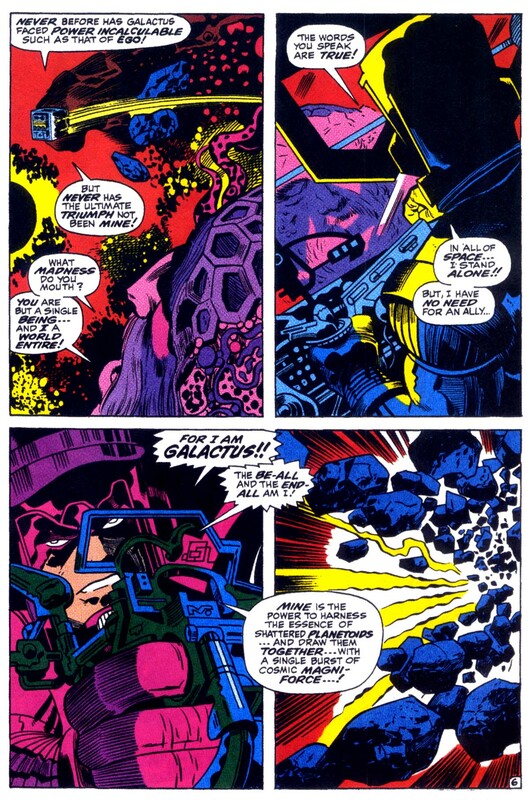 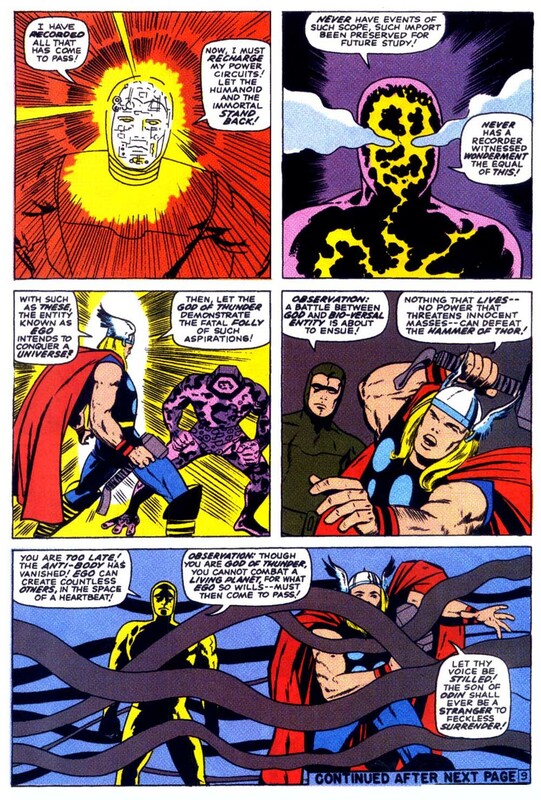 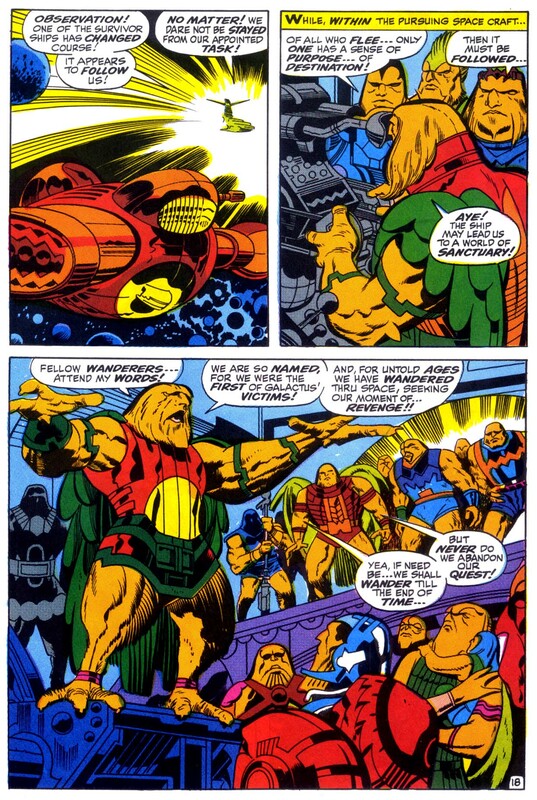 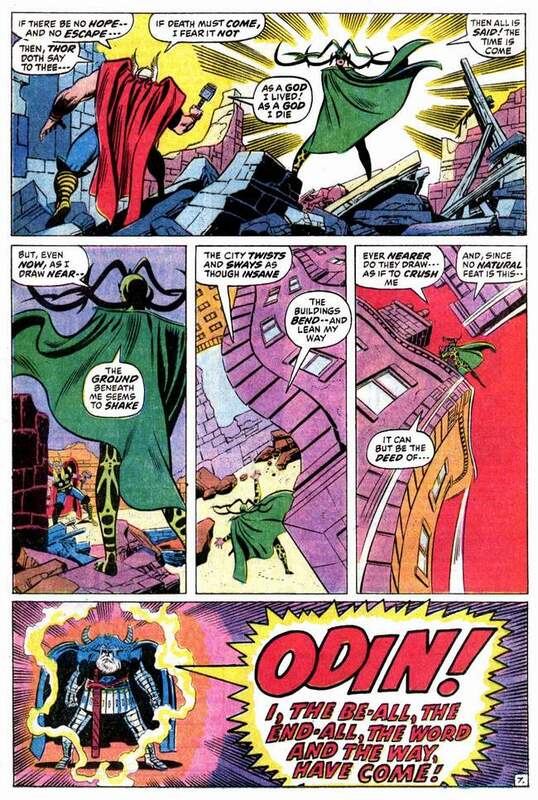 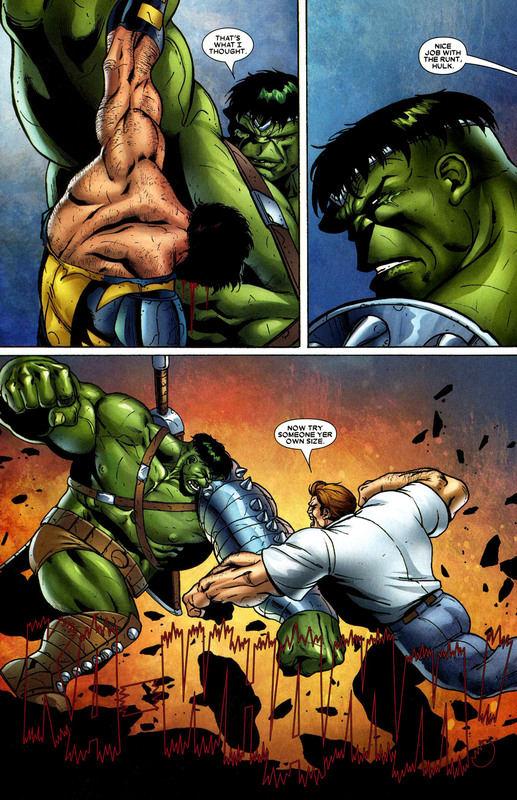 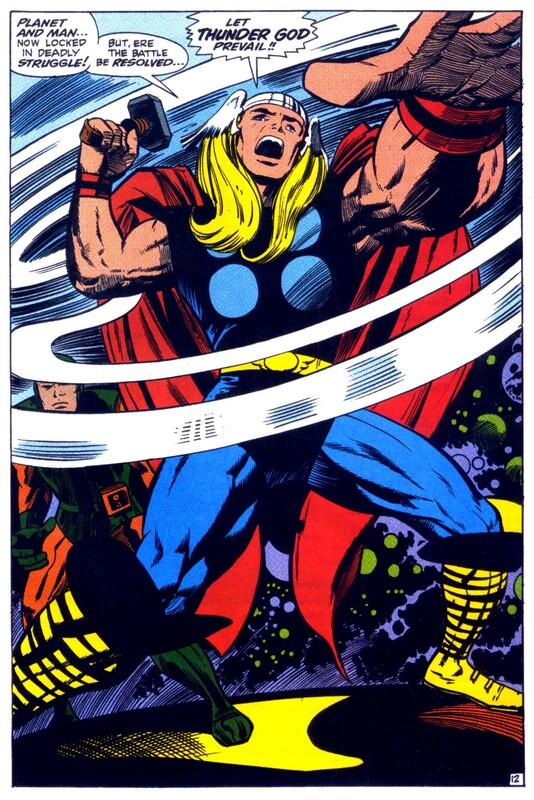 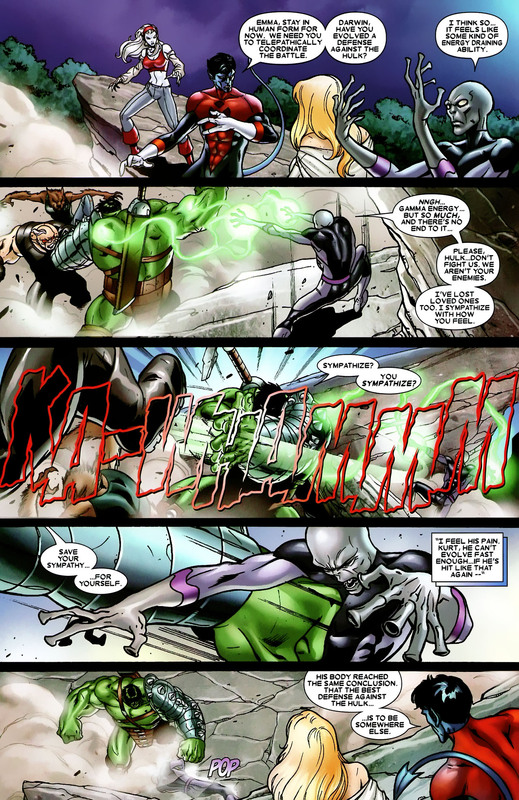 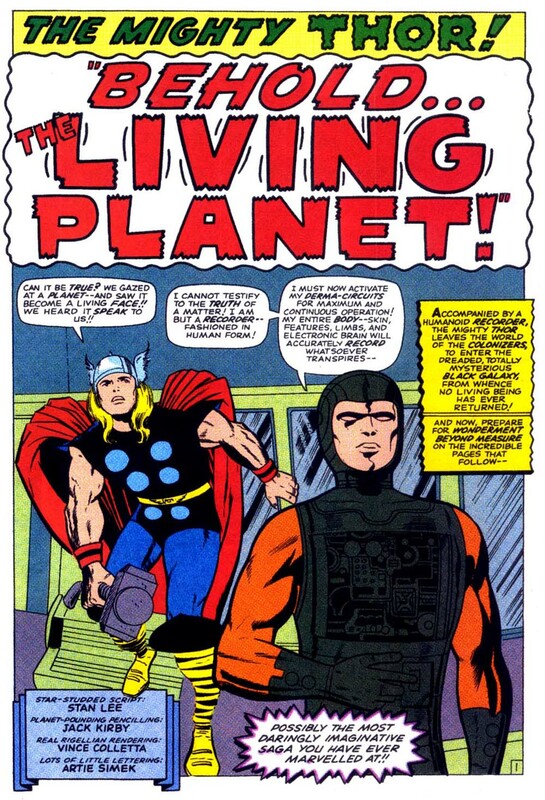 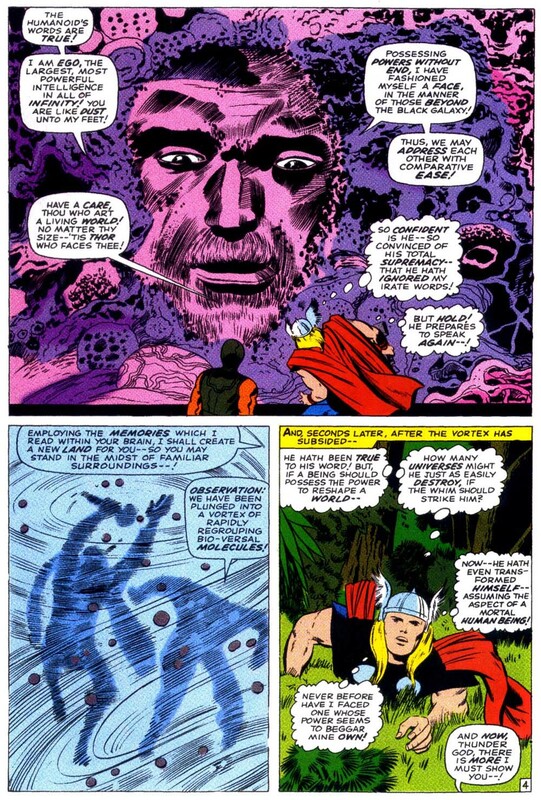 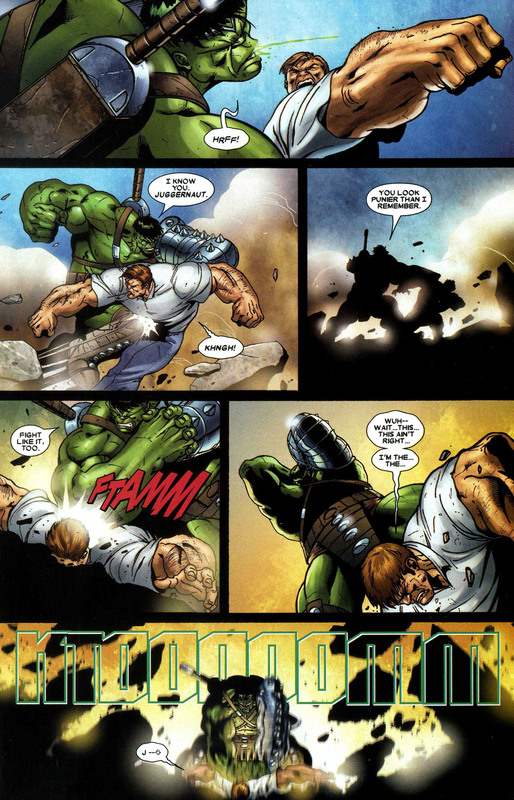 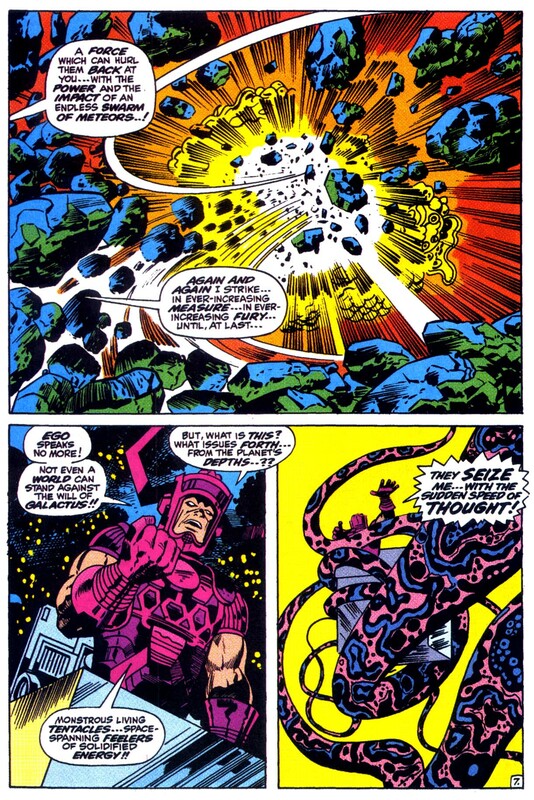 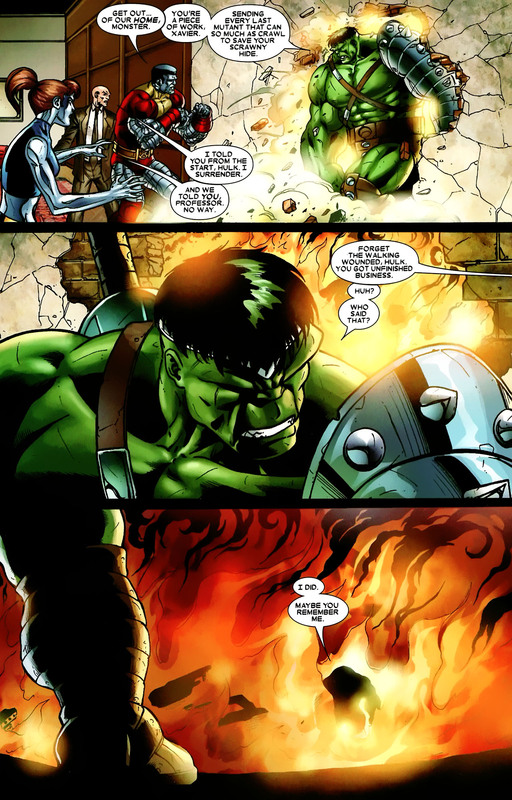 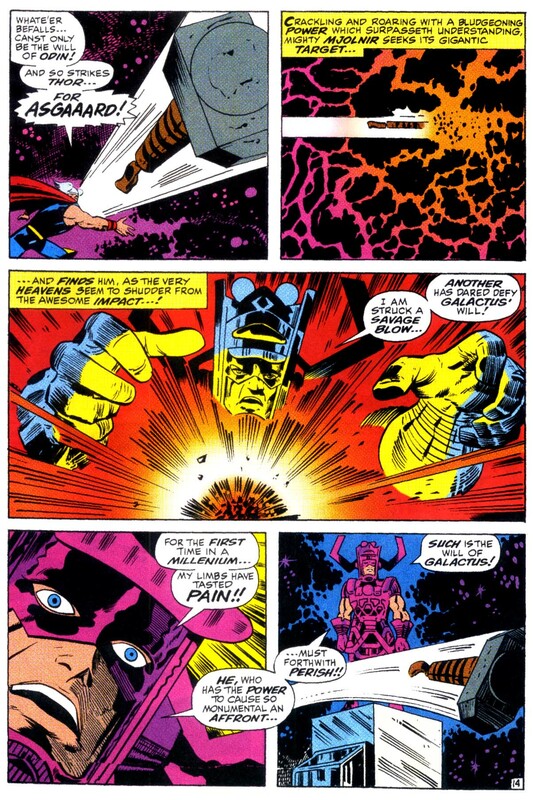 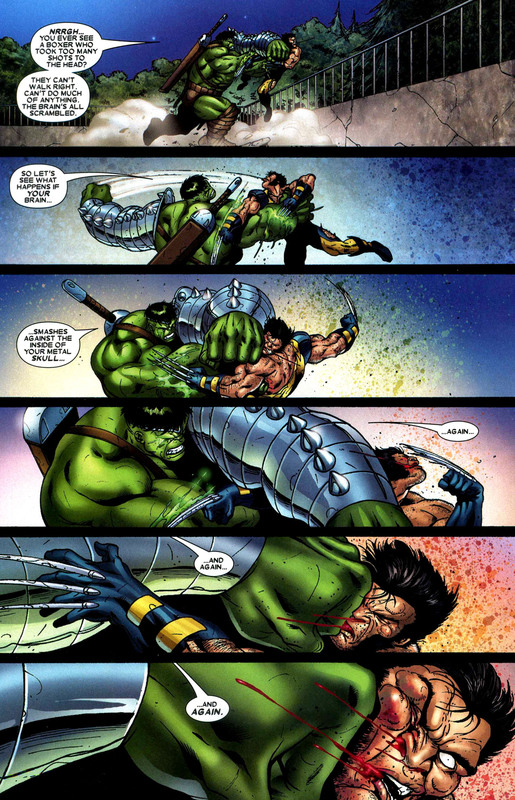 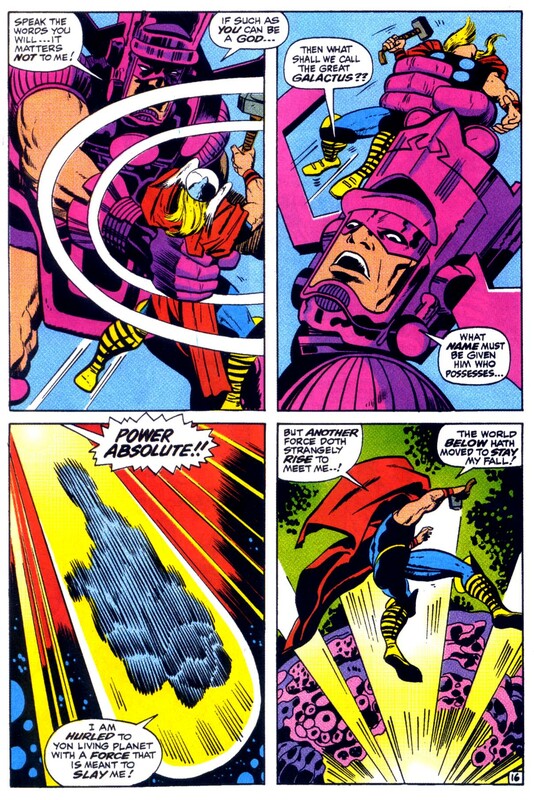 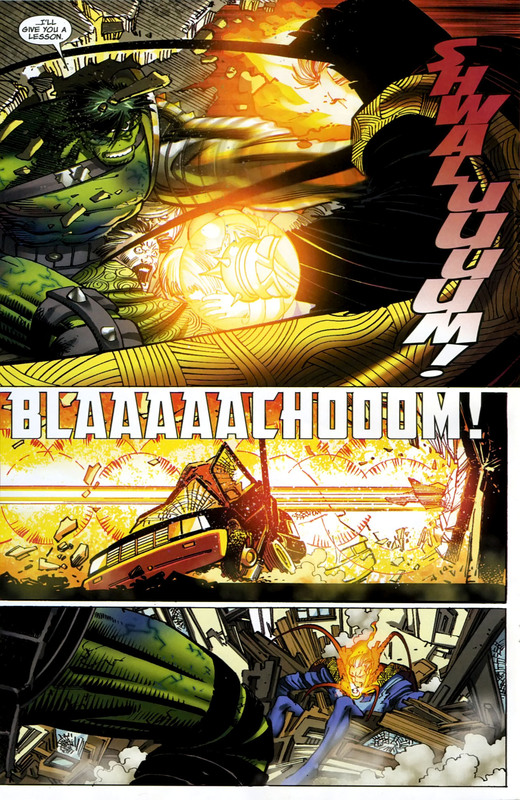 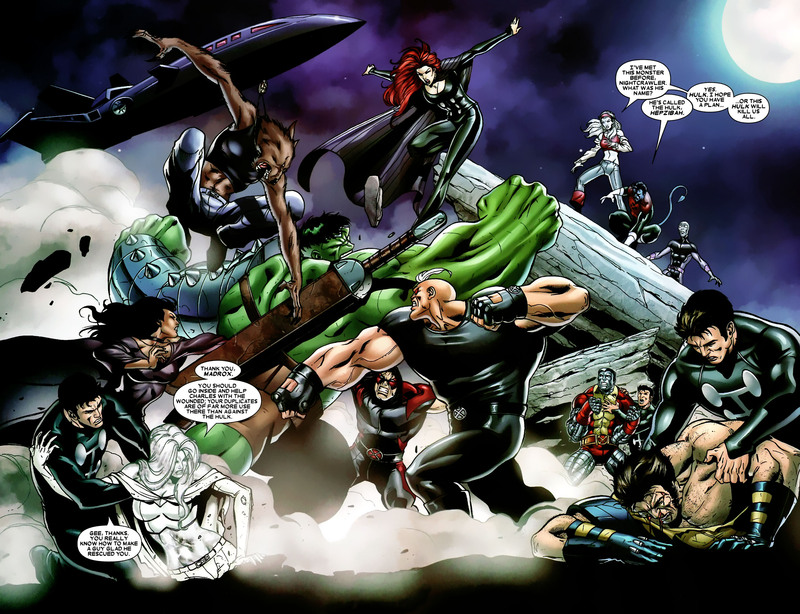 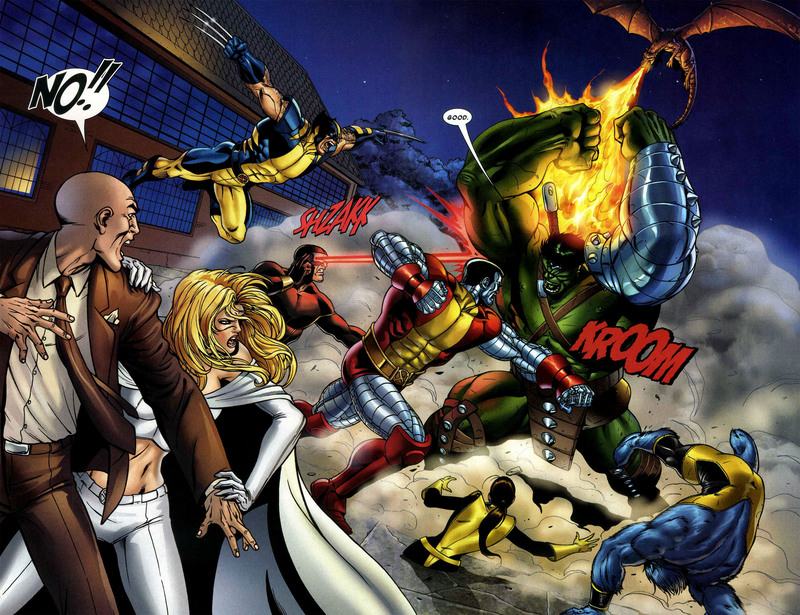 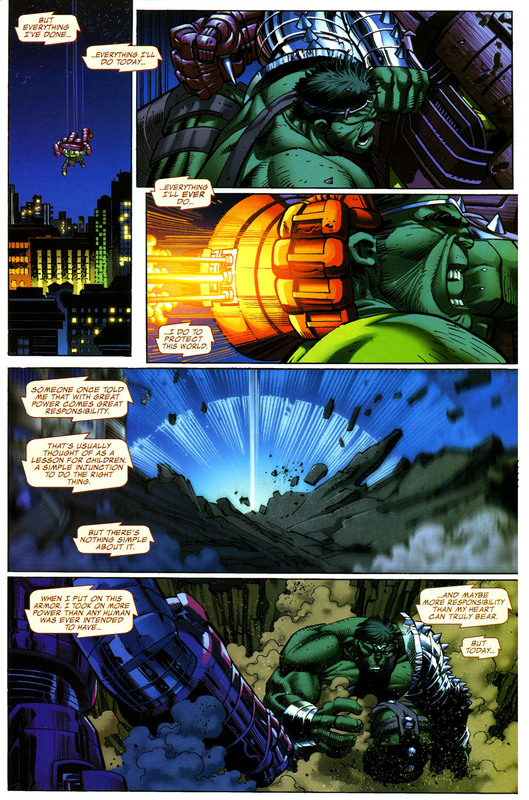 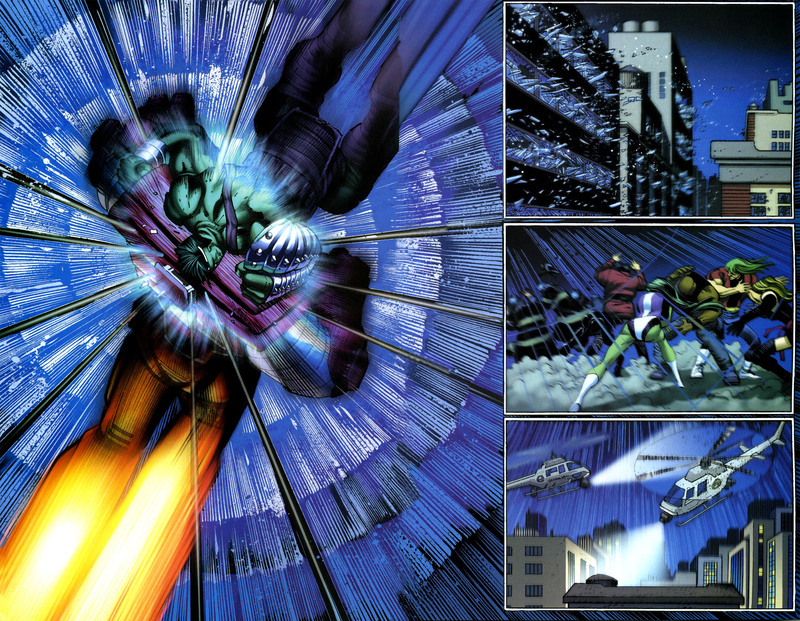 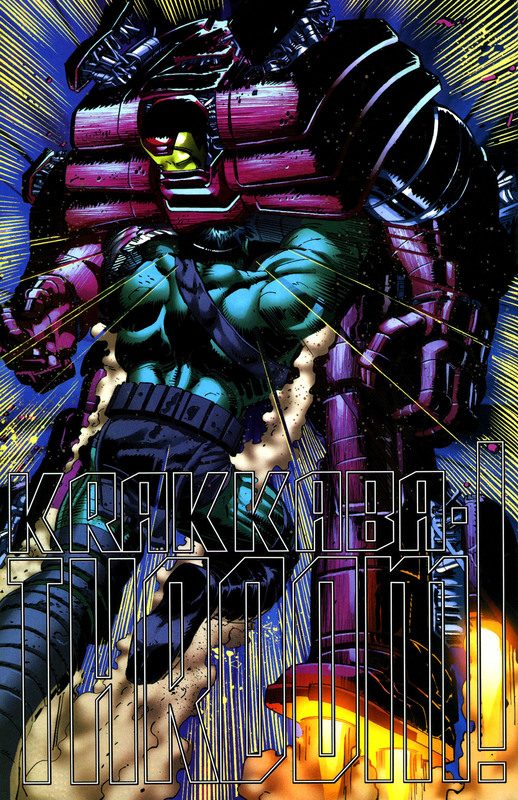 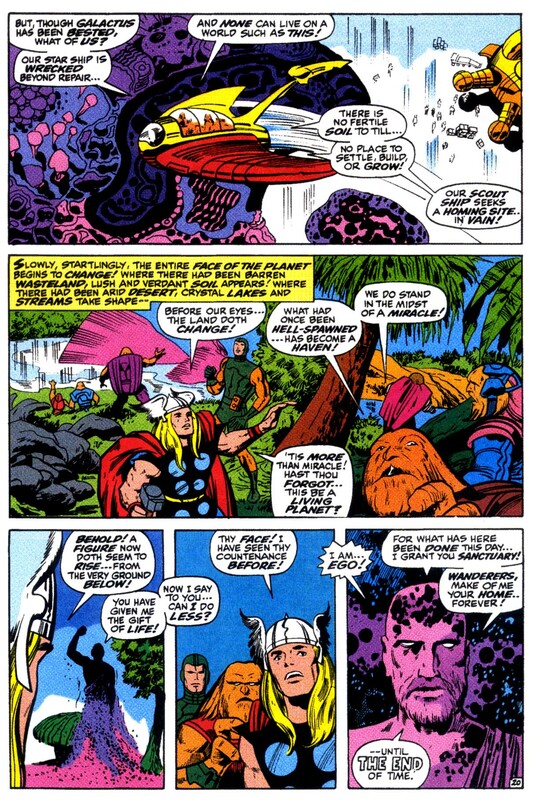 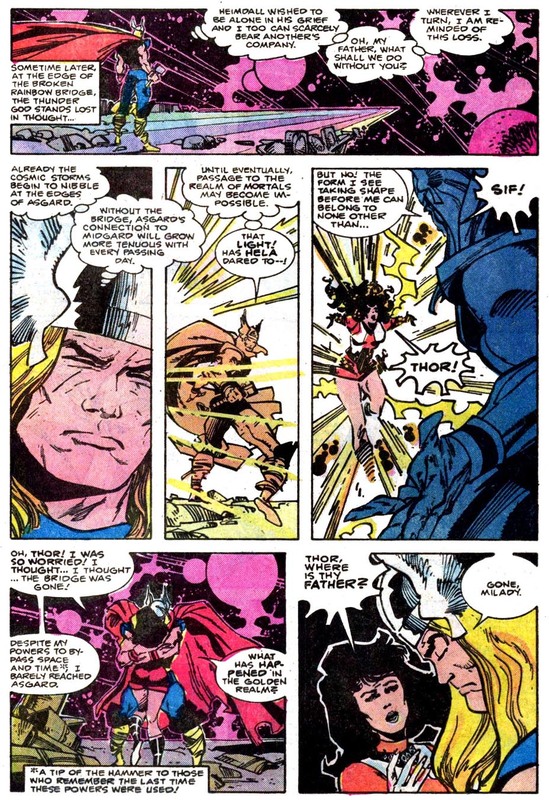 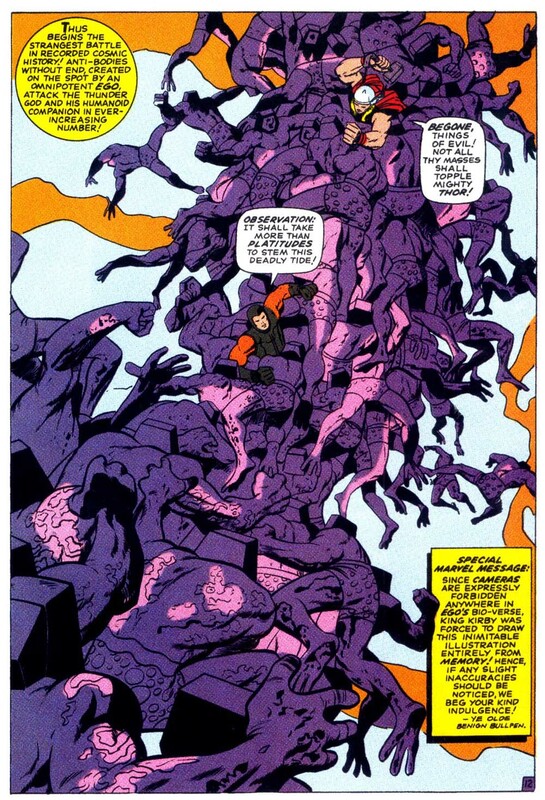 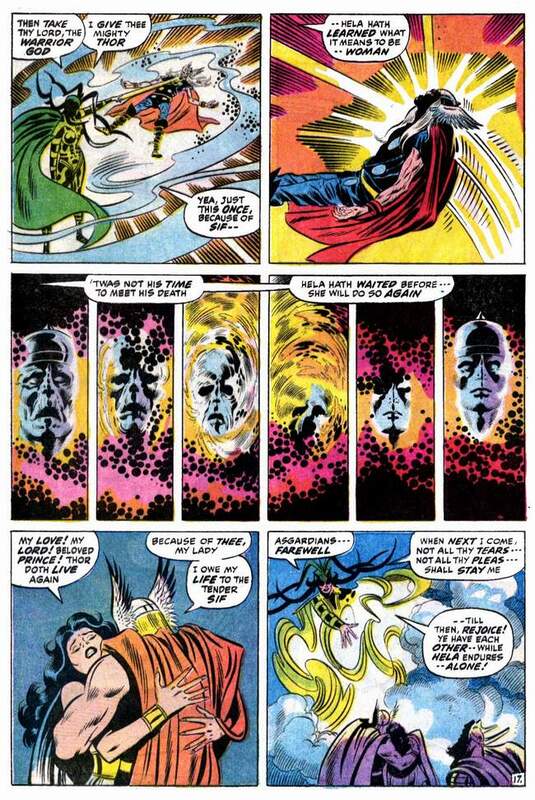 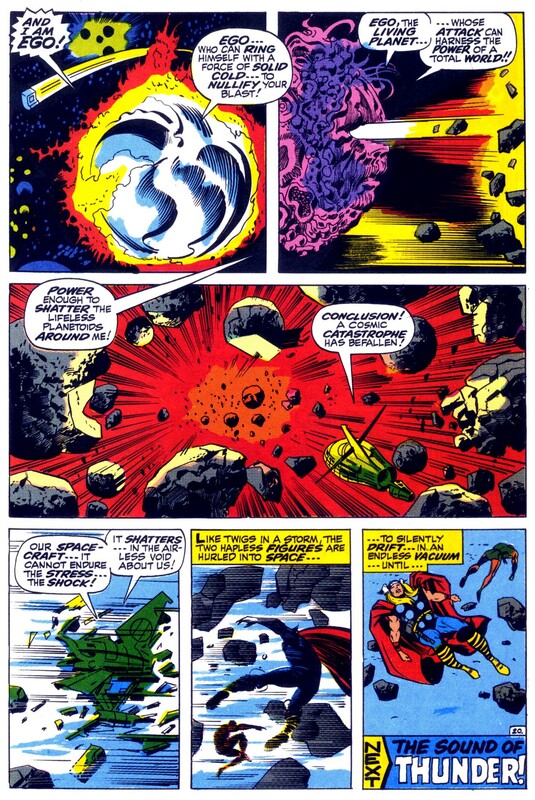 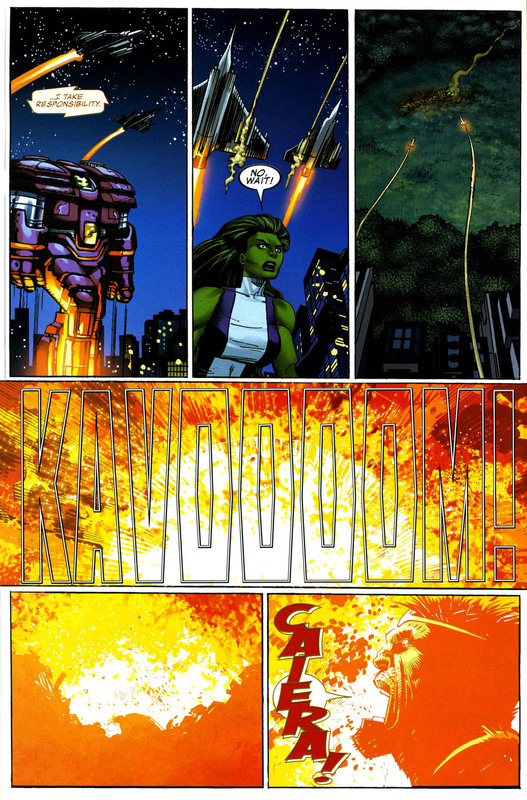 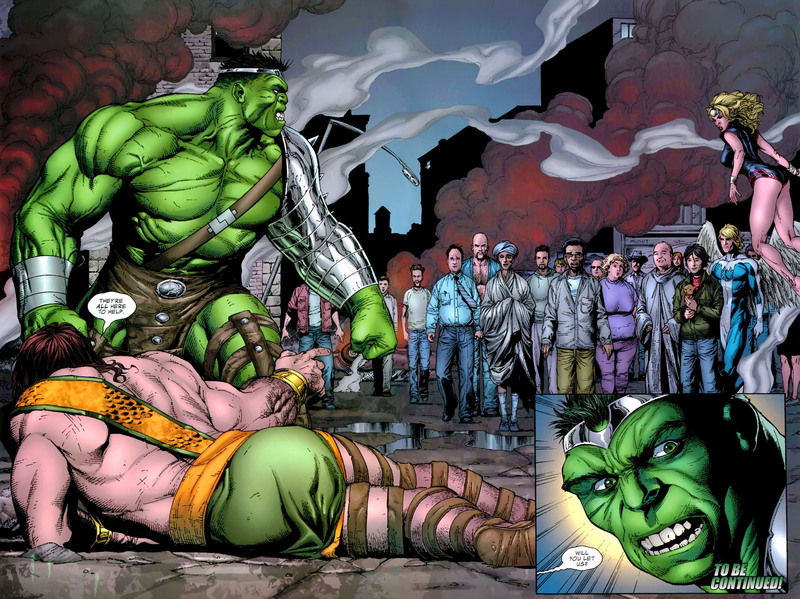 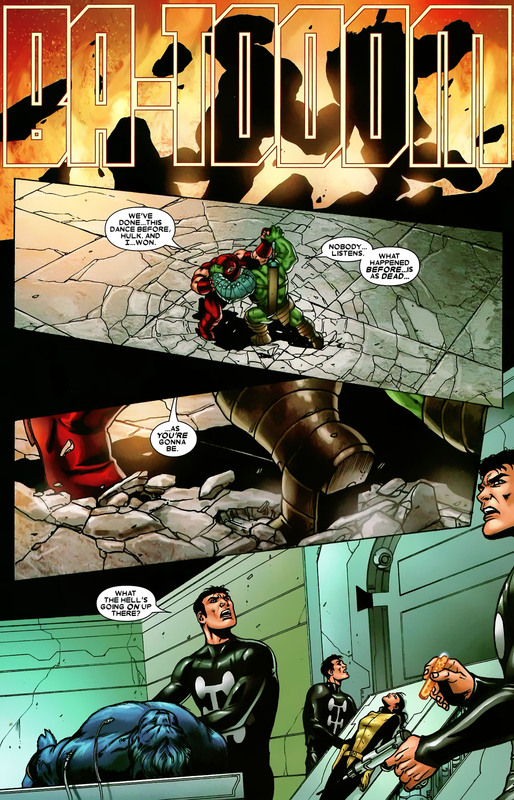 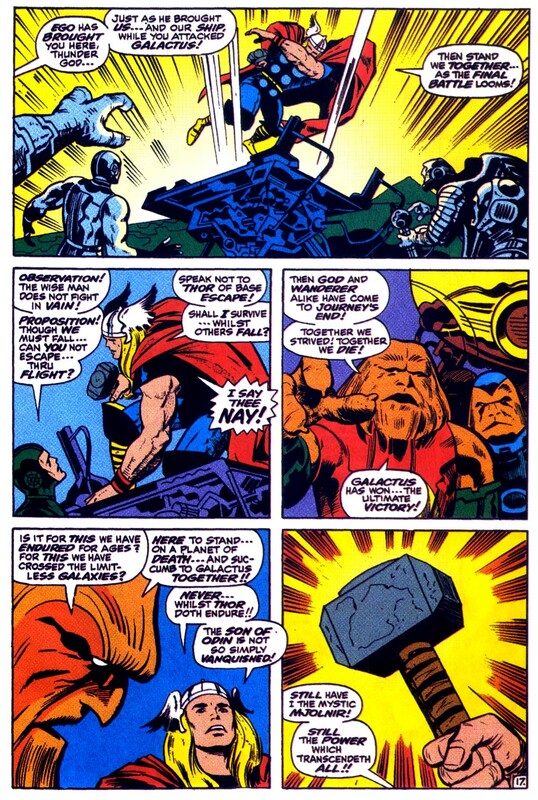 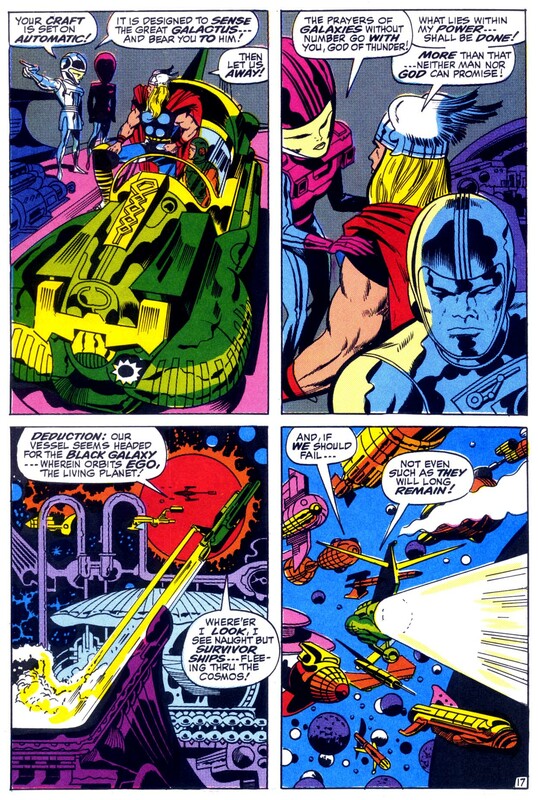 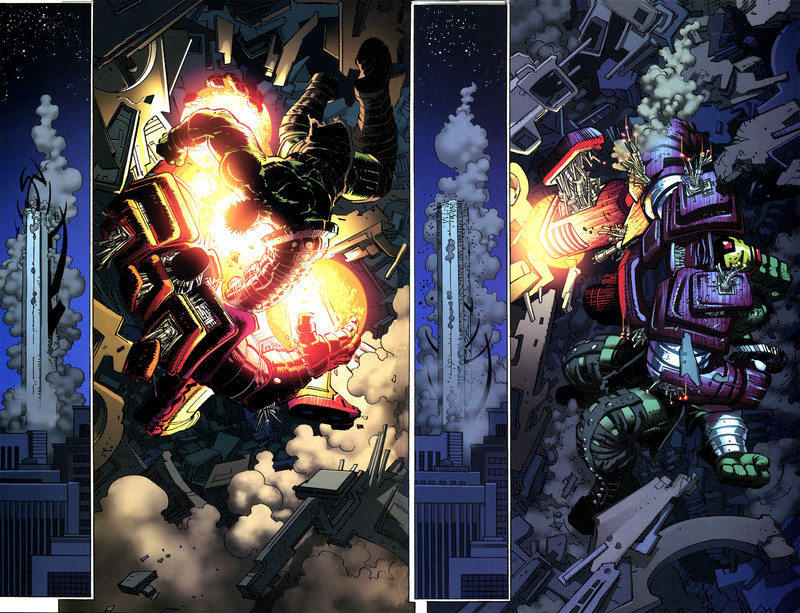 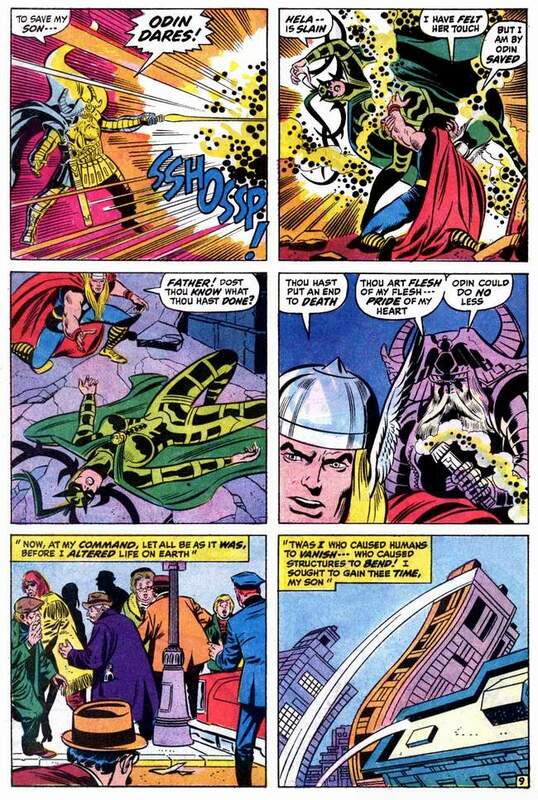 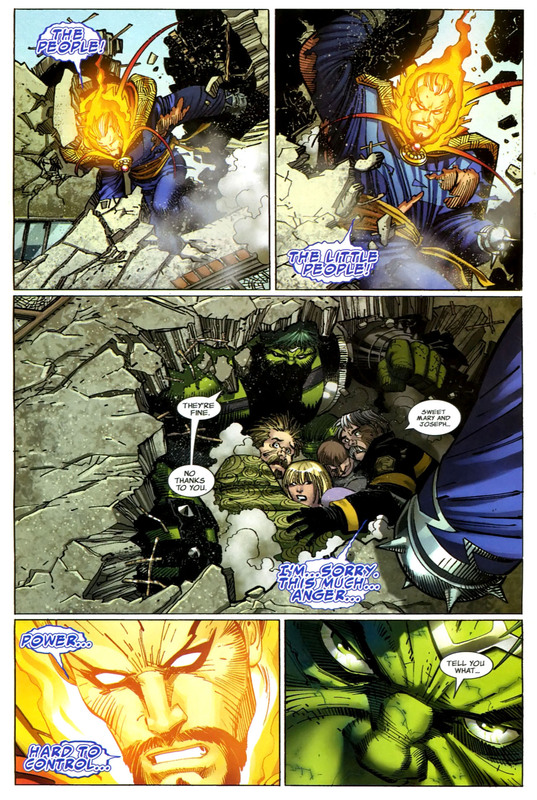 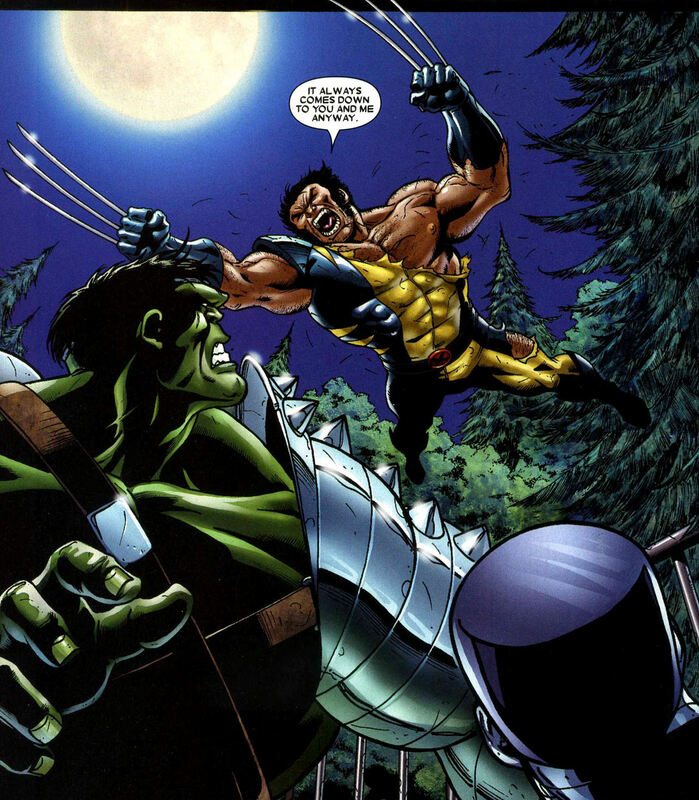 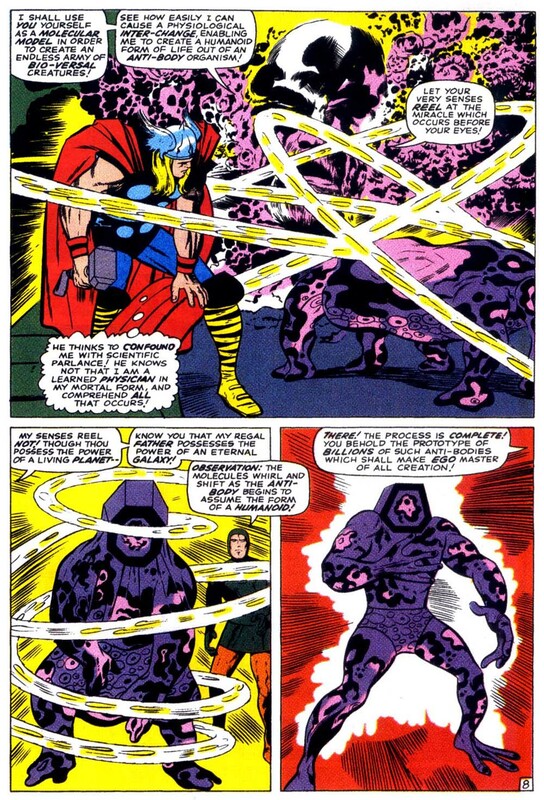 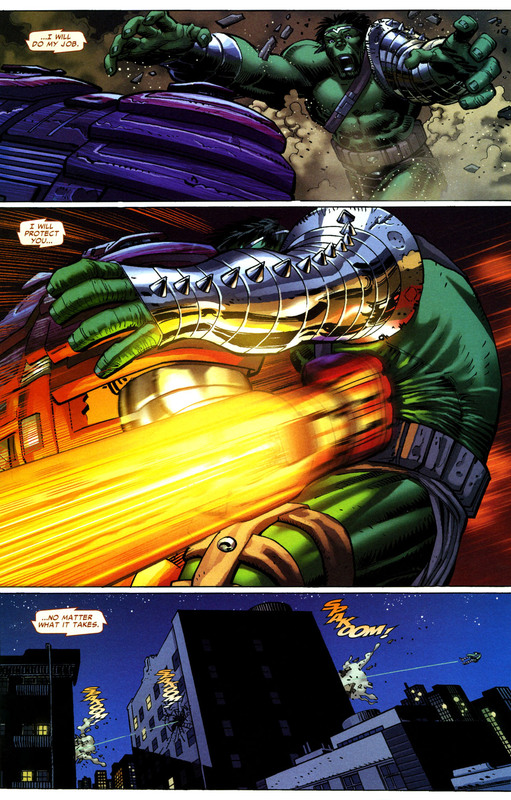 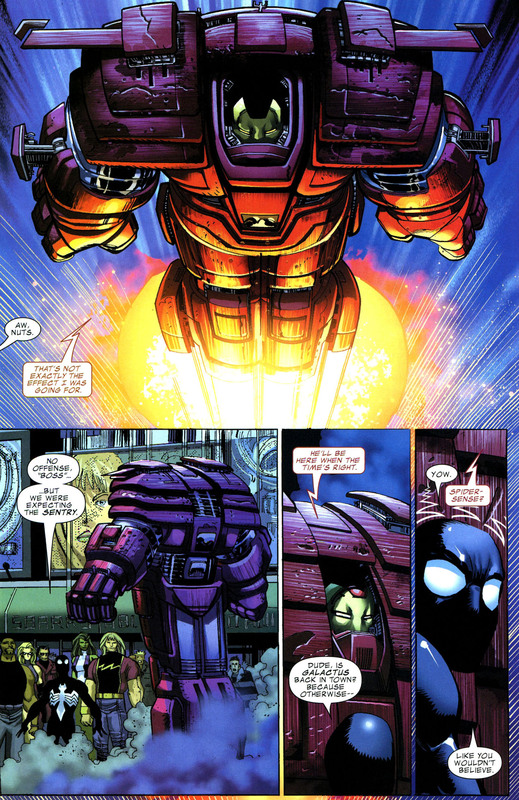 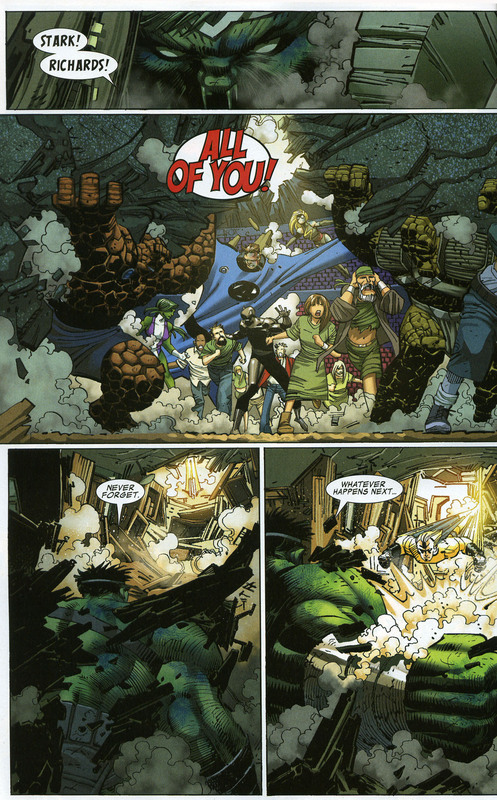 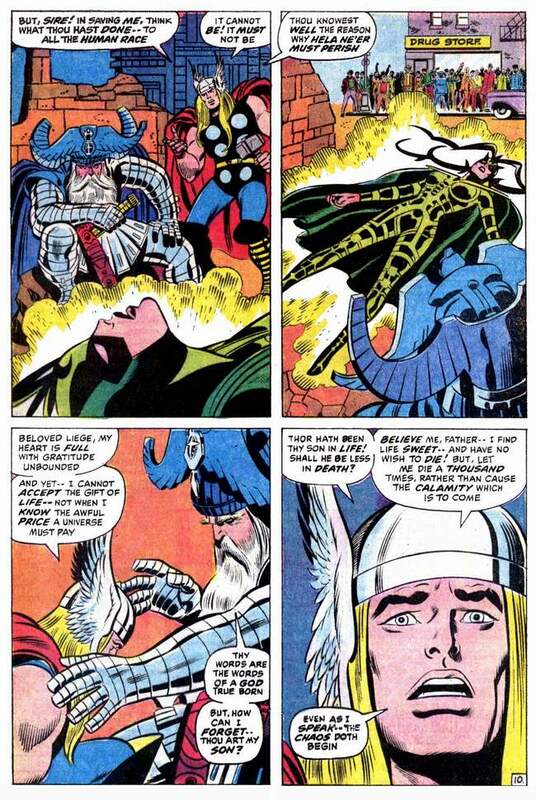 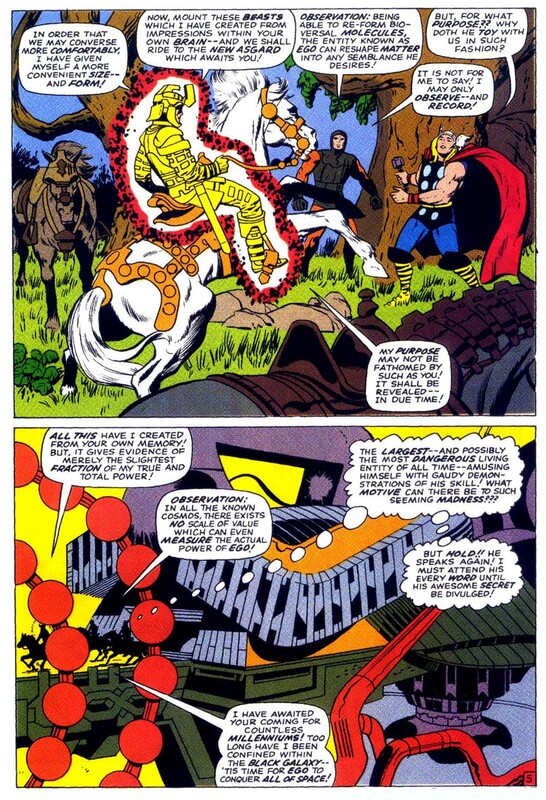 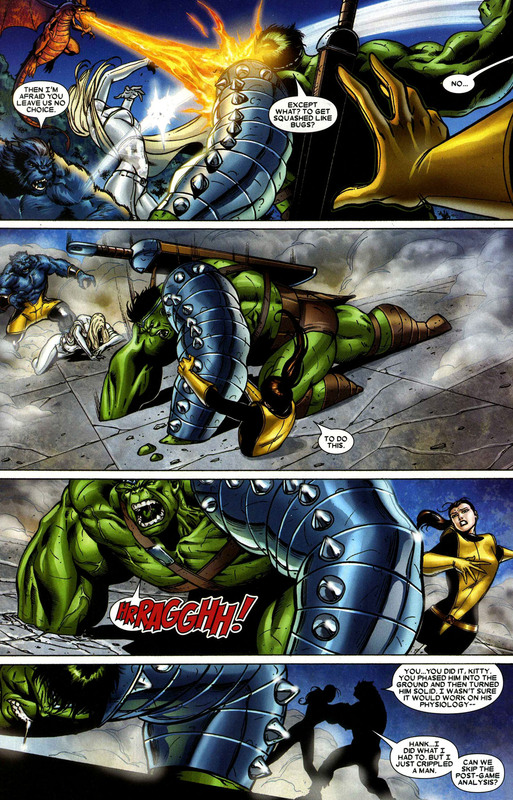 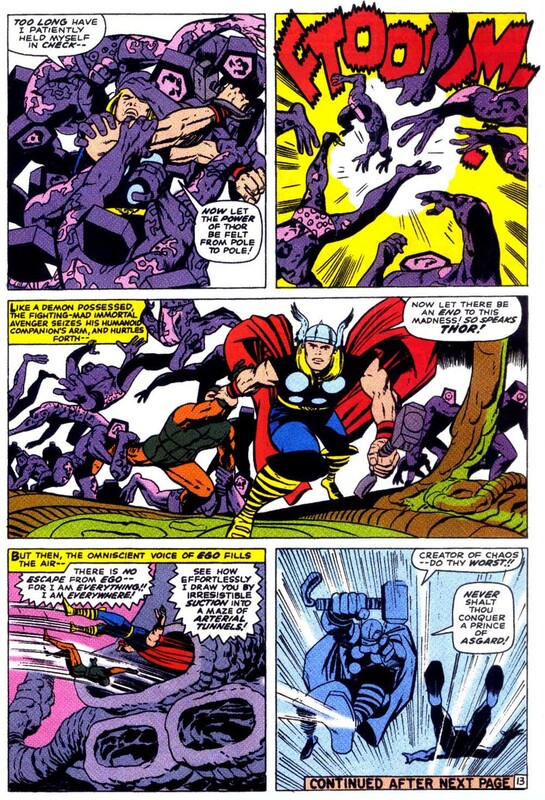 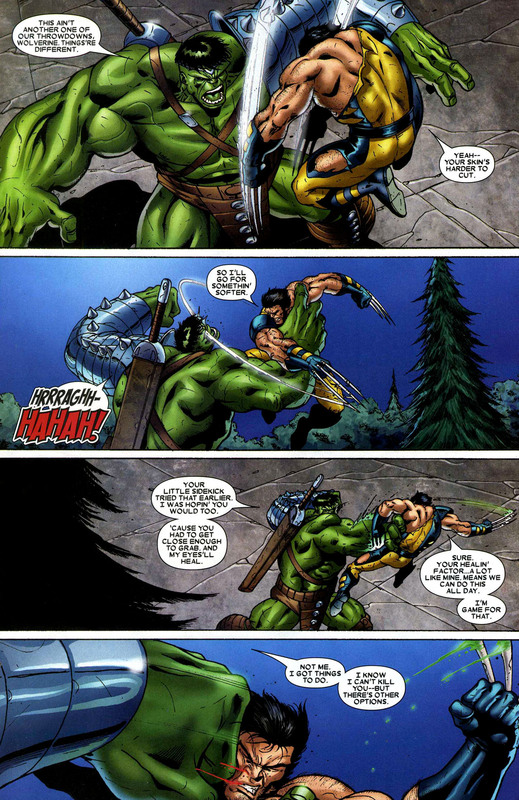 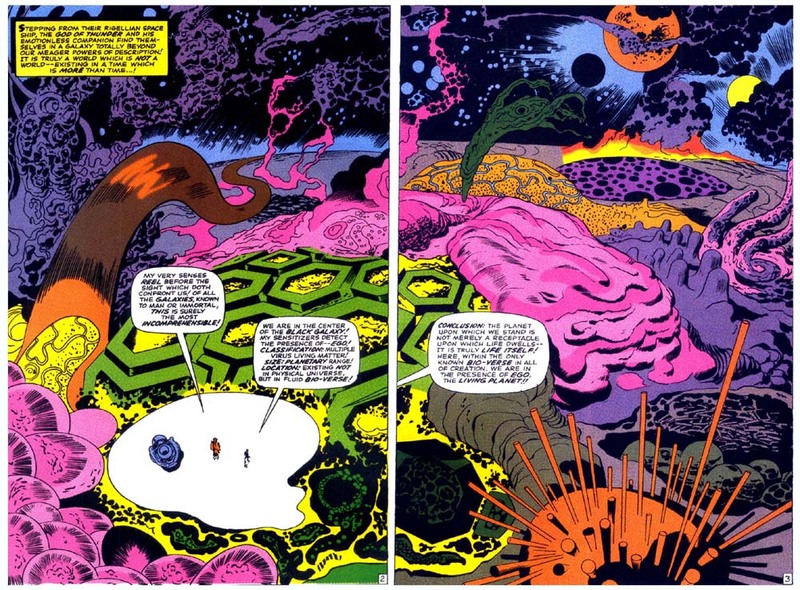 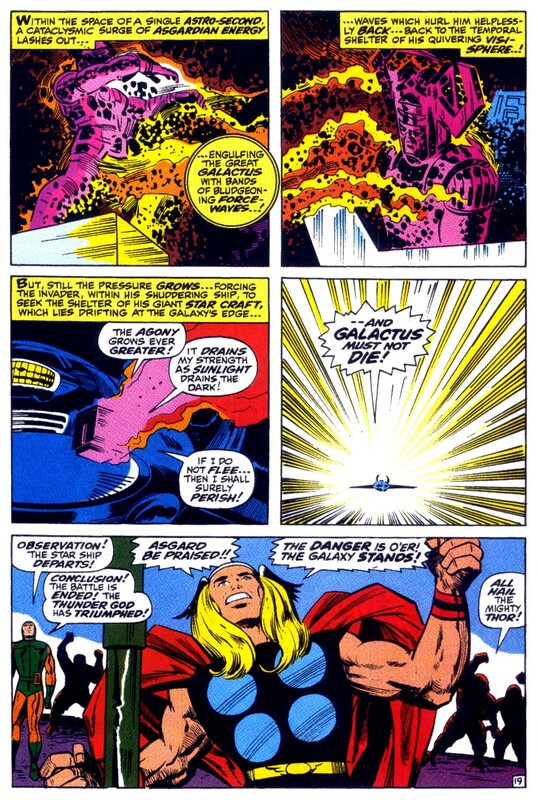 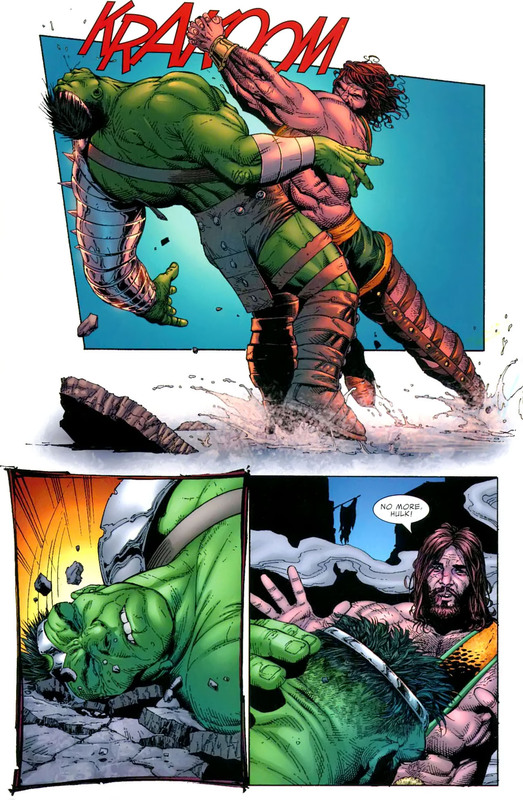 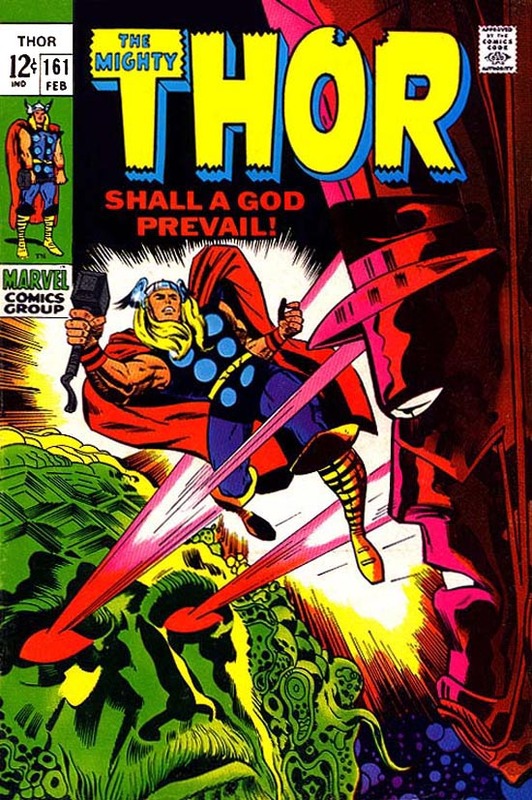 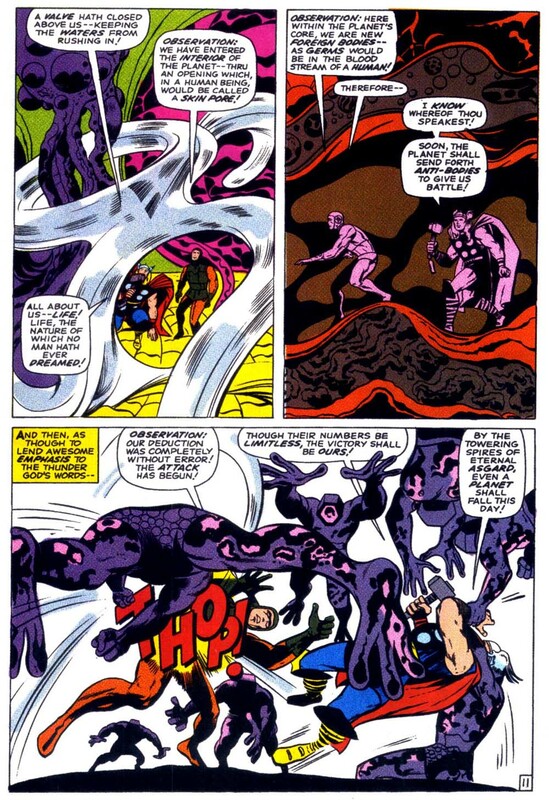 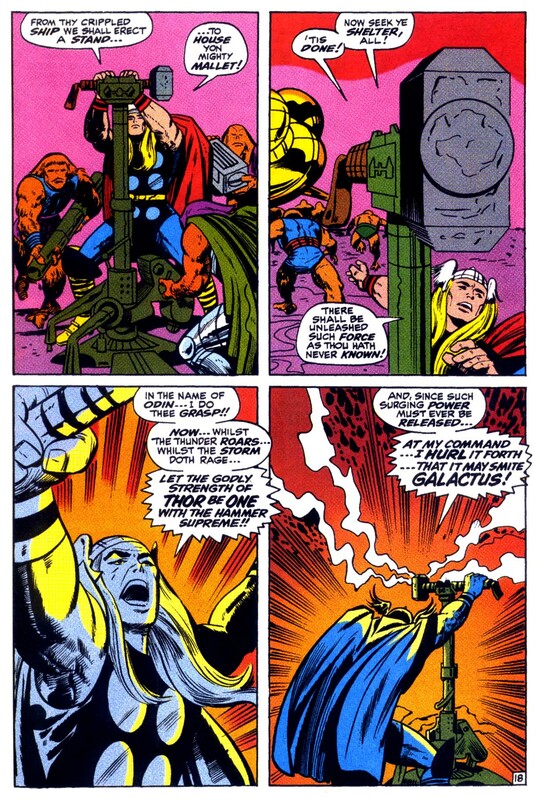 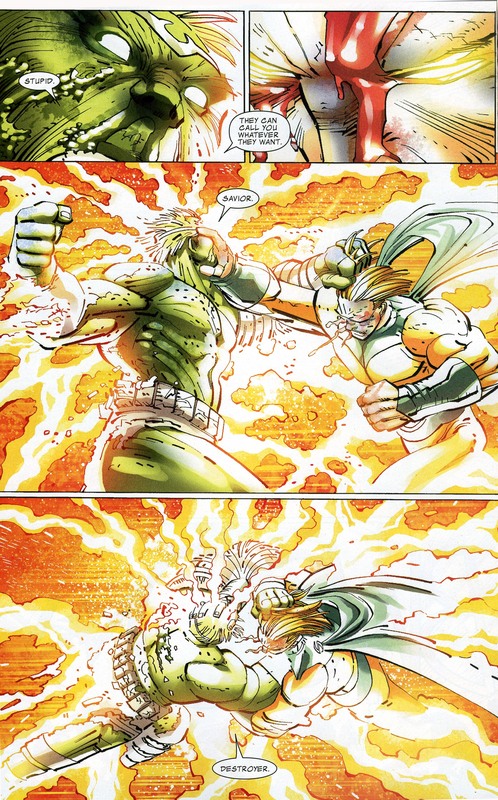 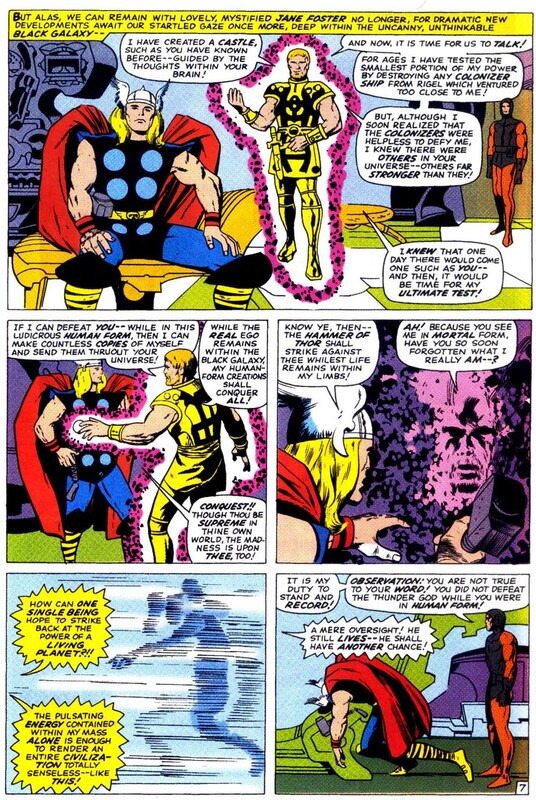 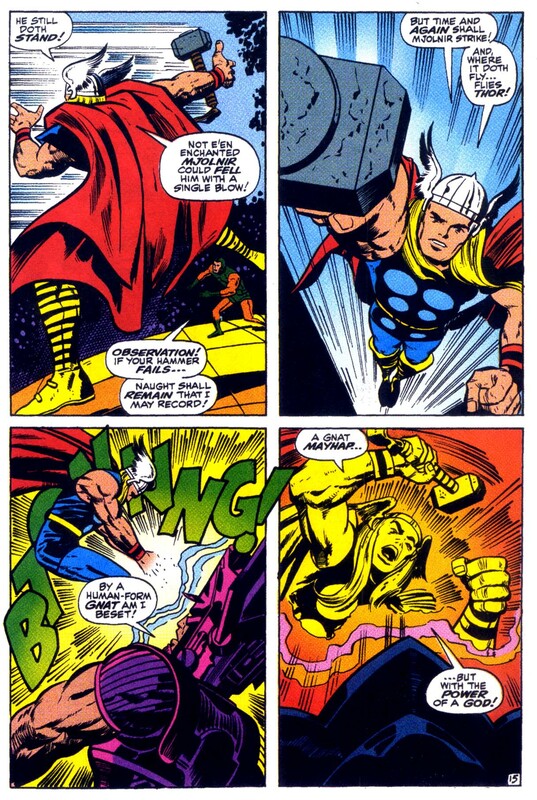 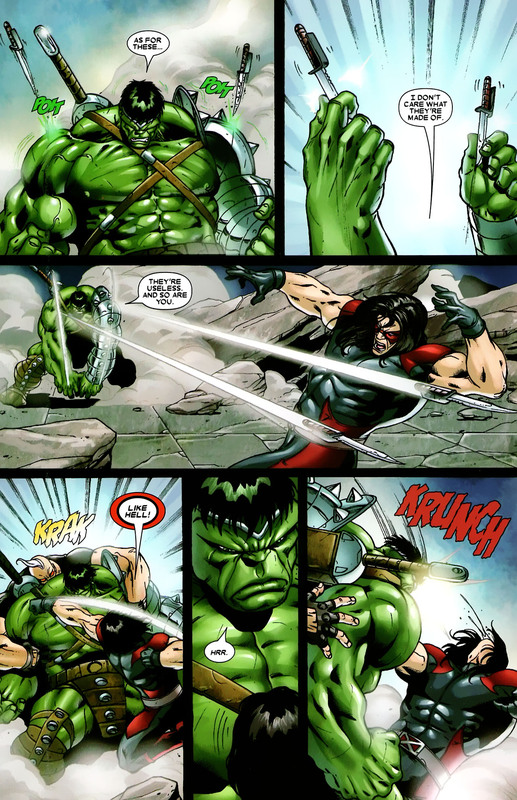 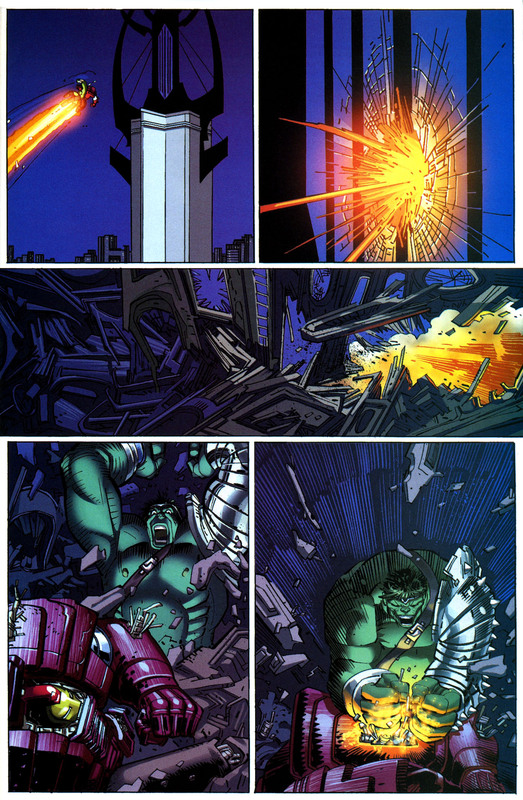 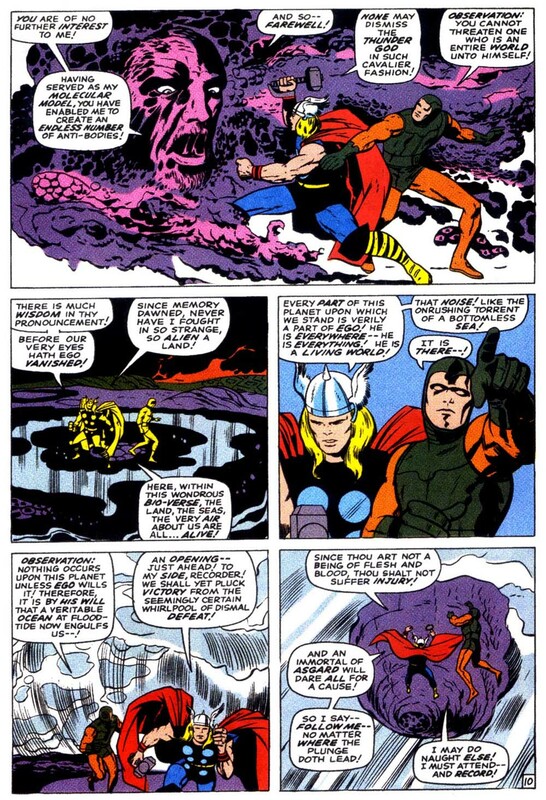 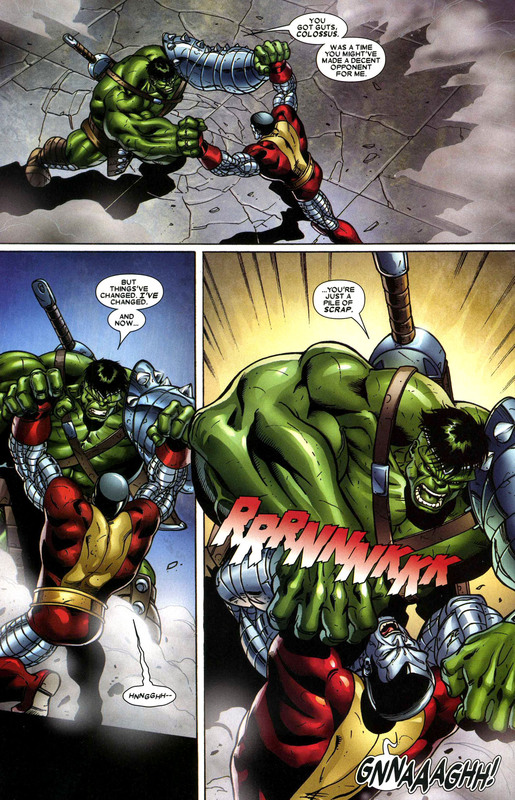 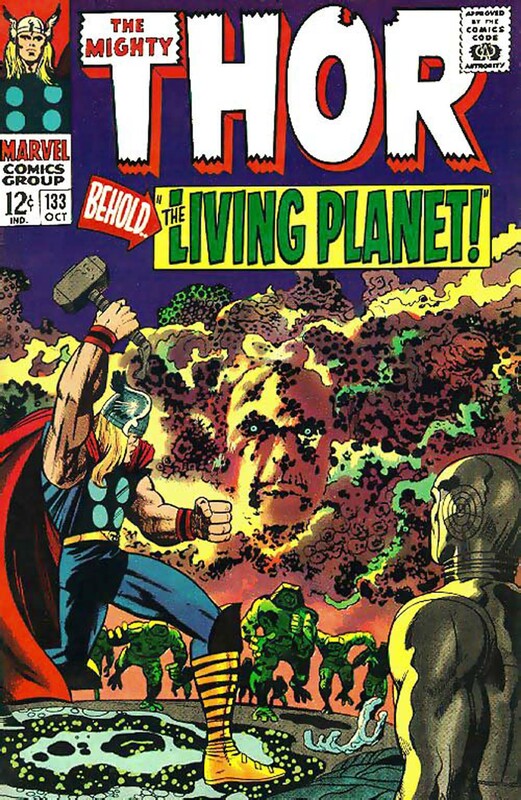 The mini-series was used to finish off a long-standing Marvel Universe plot thread involving the Scourge of the Underworld. 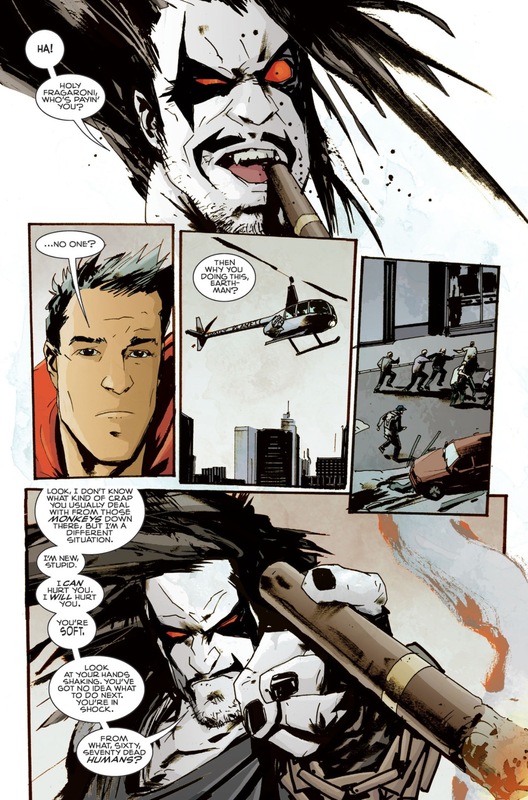 John Walker was born in the fictional town of Custer’s Grove, Georgia. 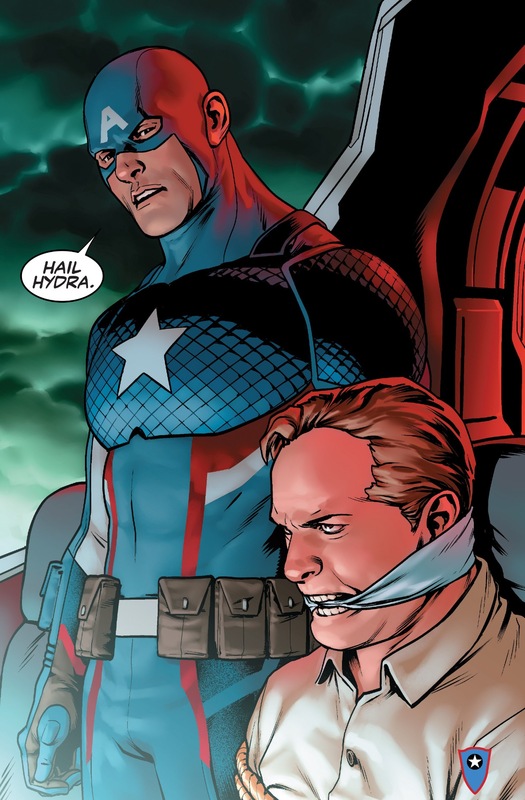 He grew up idolizing his older brother, Mike, a helicopter pilot who died in the Vietnam War. 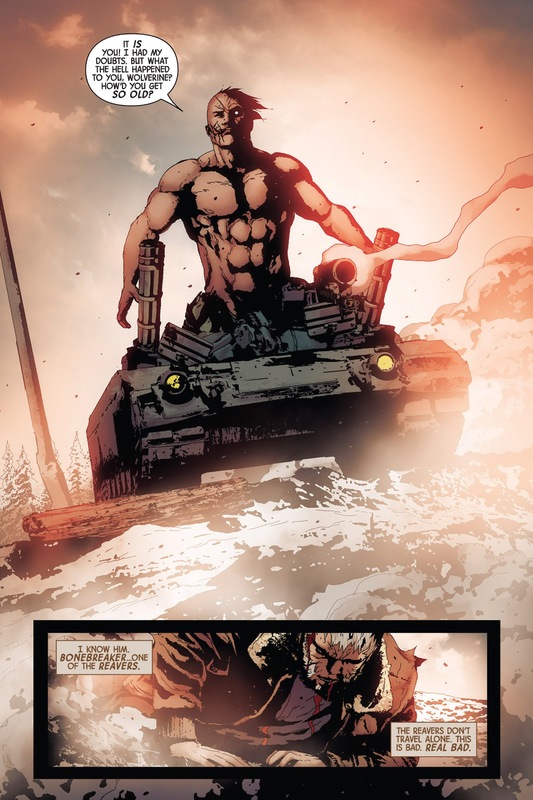 John wanted to honor his brother’s memory by enlisting in the military, becoming a soldier himself. 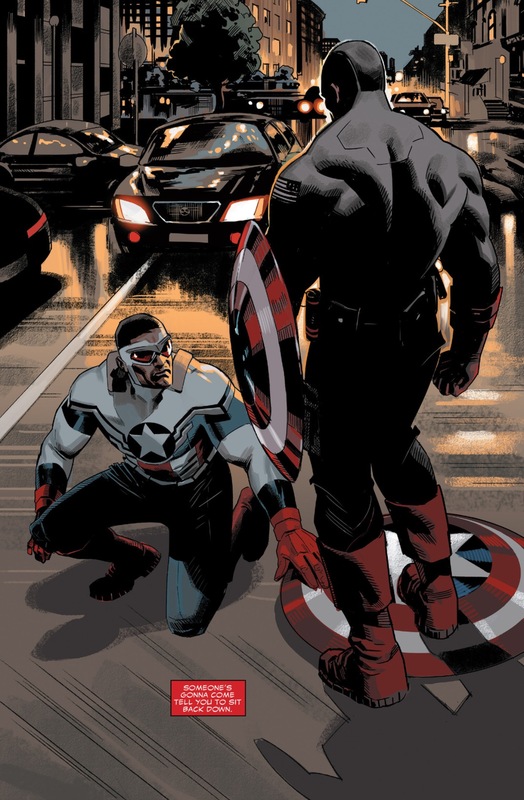 This entry was posted in Captain America, Civil War II, falcon, Marvel Comics, US Agent, Versus and tagged captain america, Civil War II, John Walker, sam wilson, US Agent, VS on September 28, 2016 by lowbrowcomics. 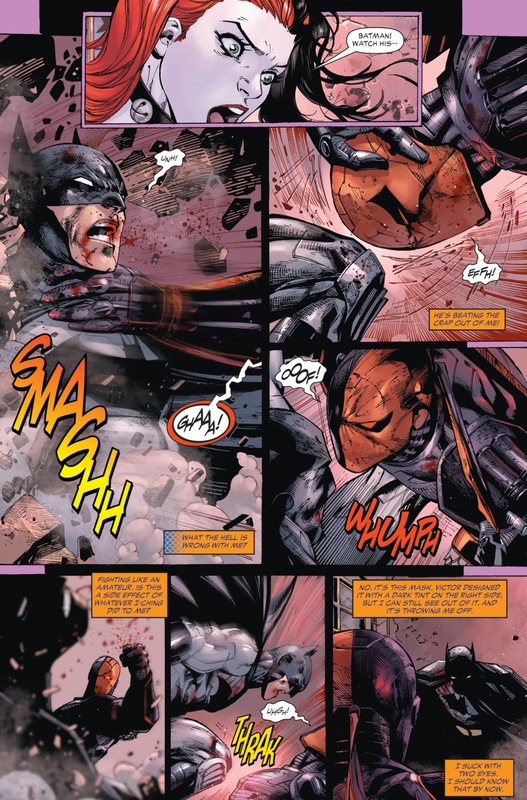 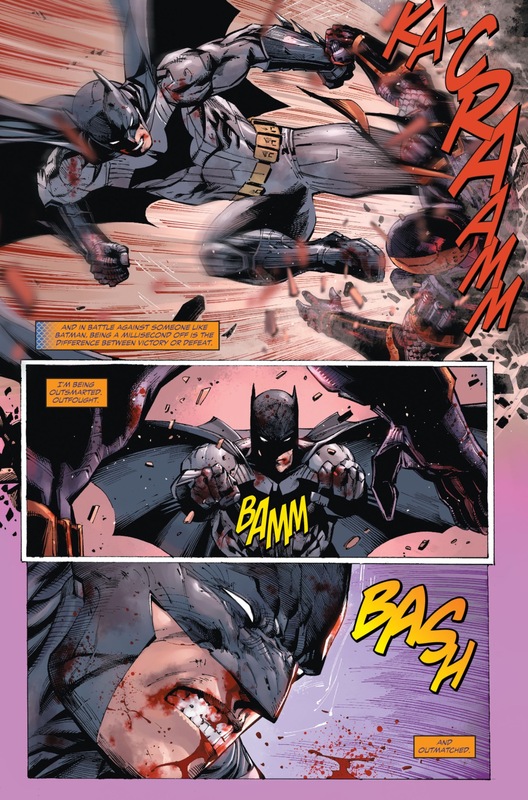 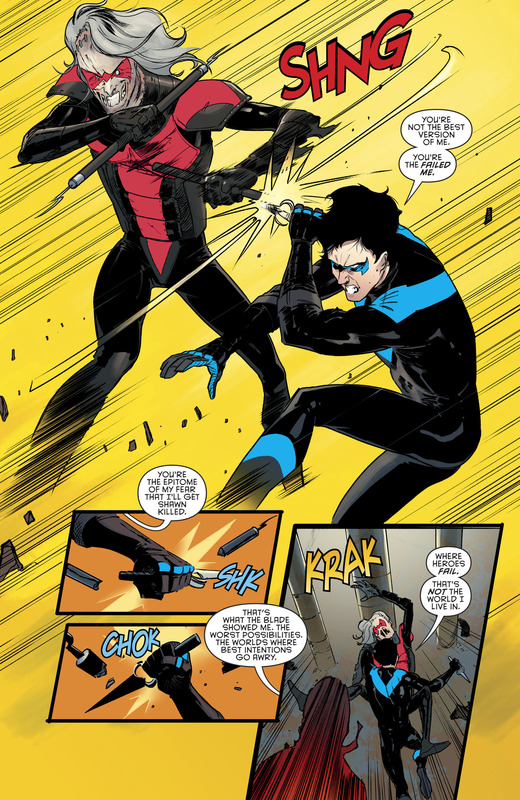 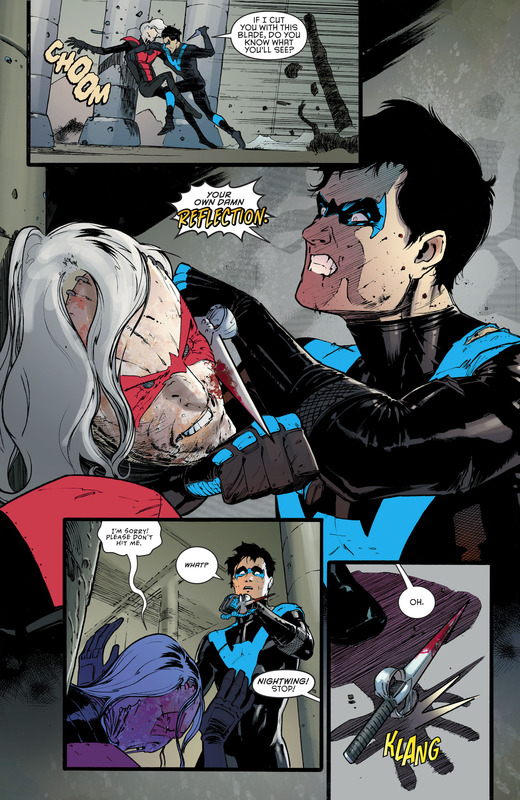 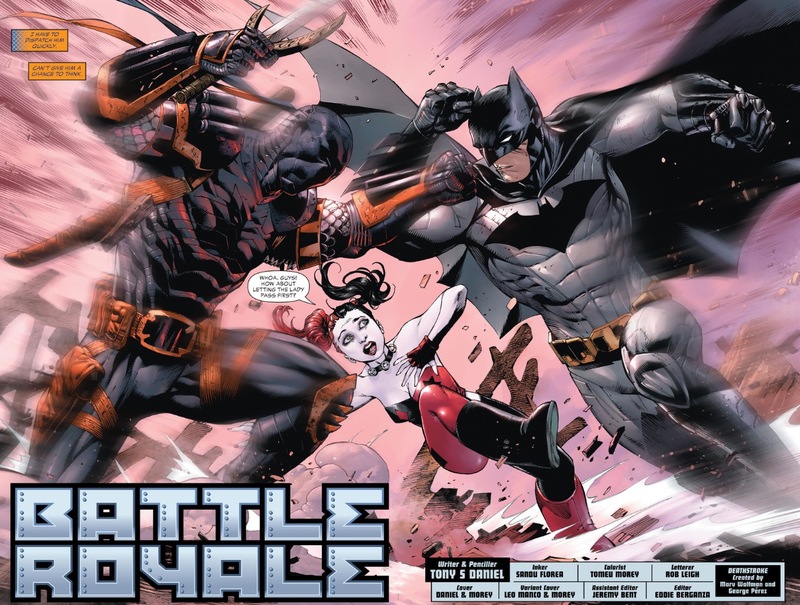 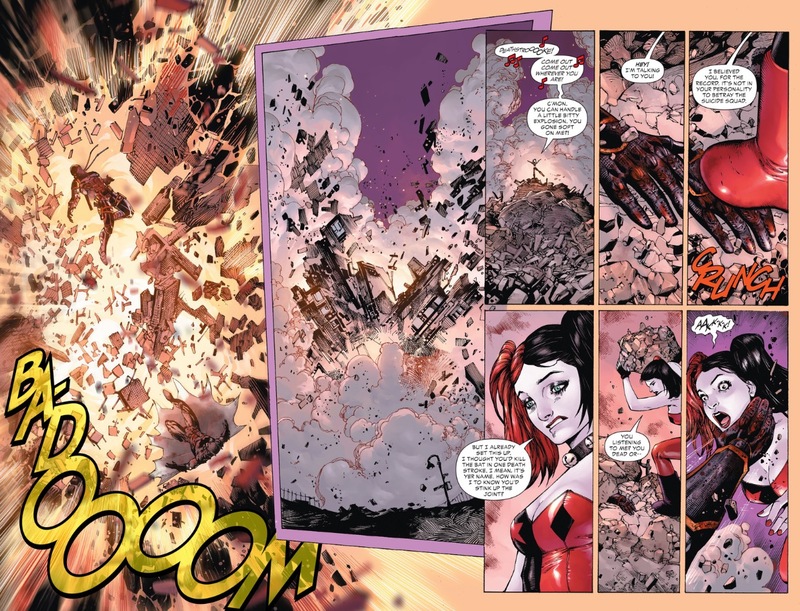 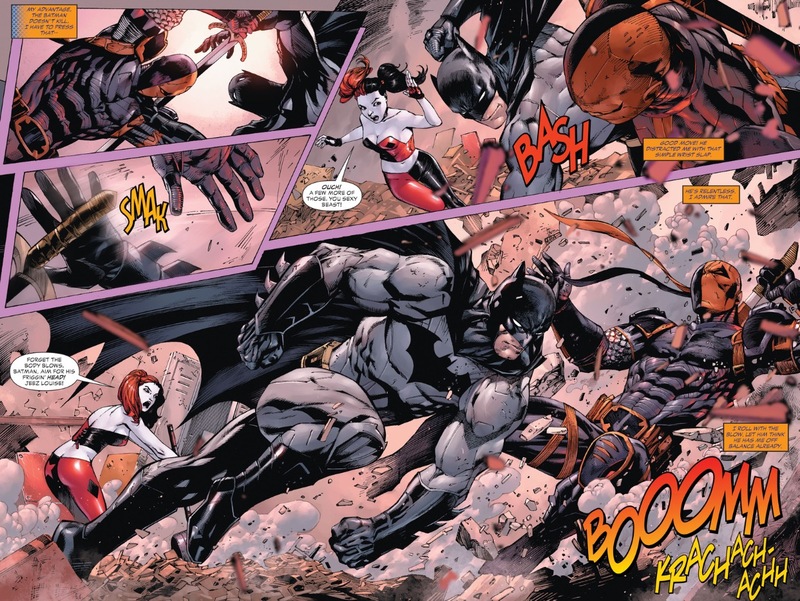 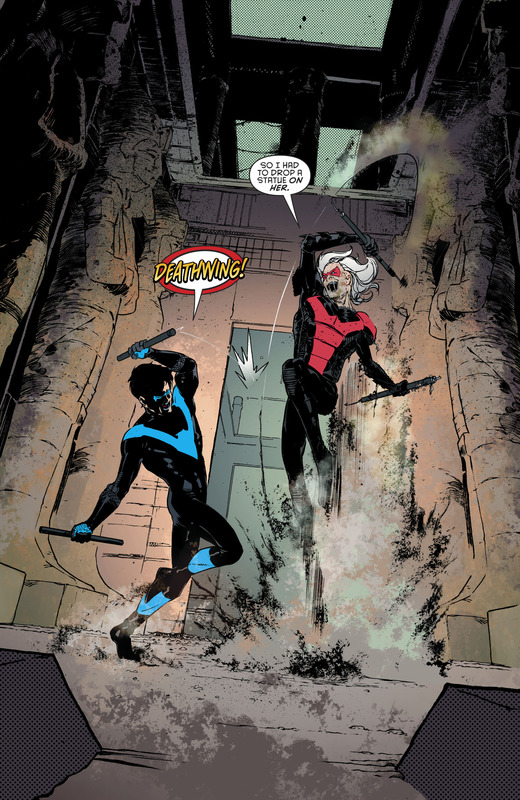 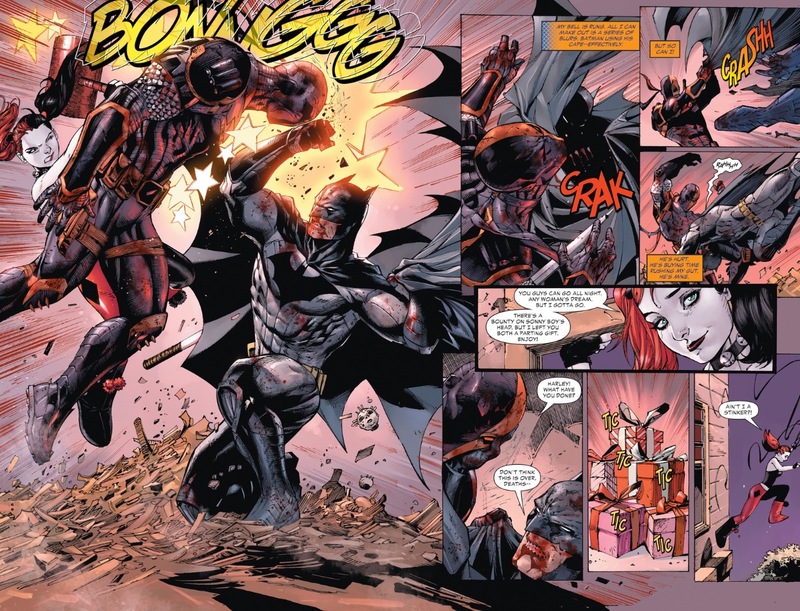 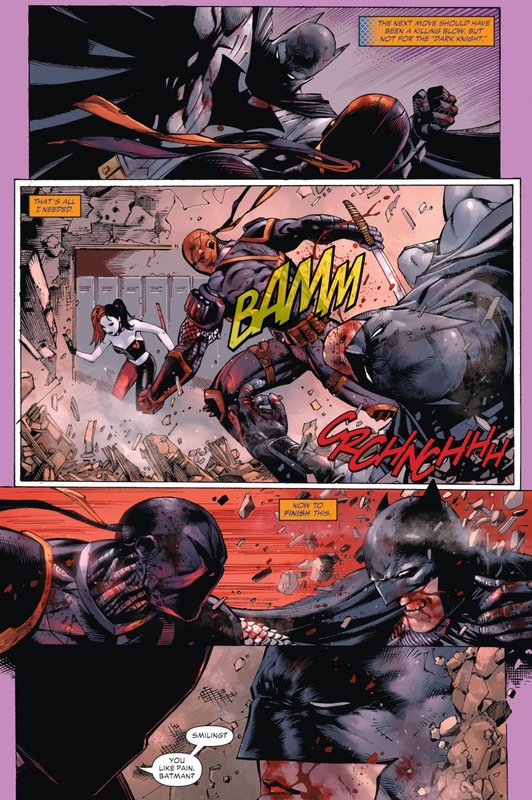 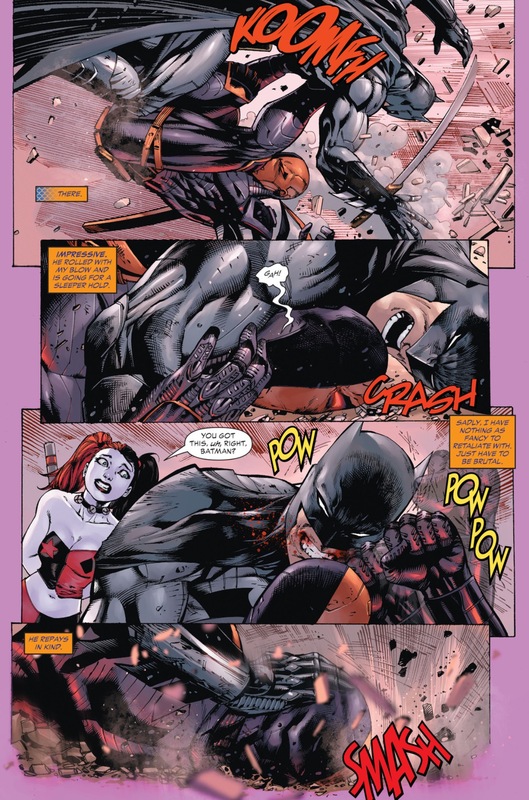 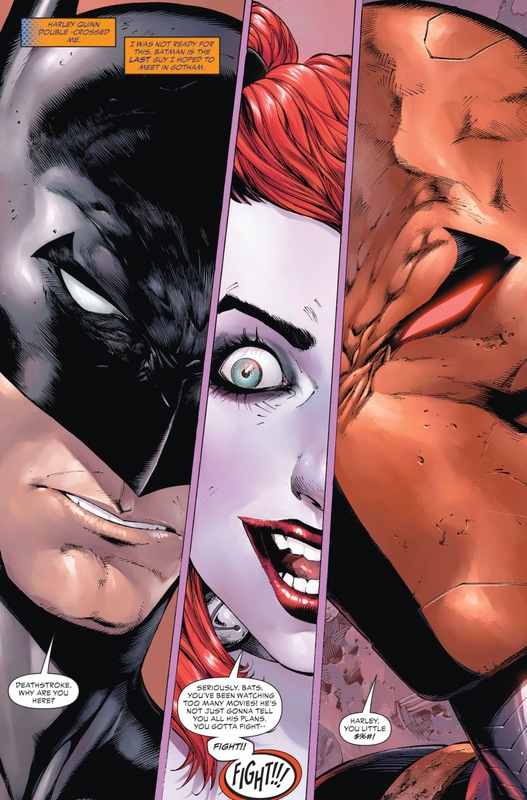 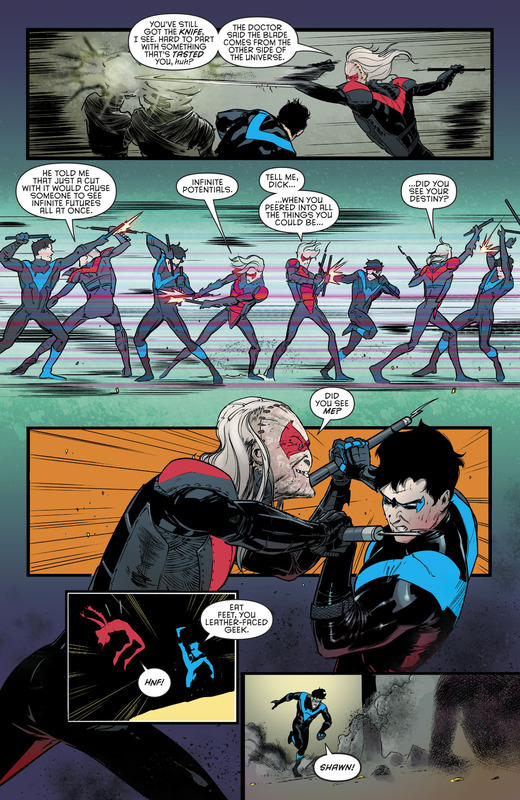 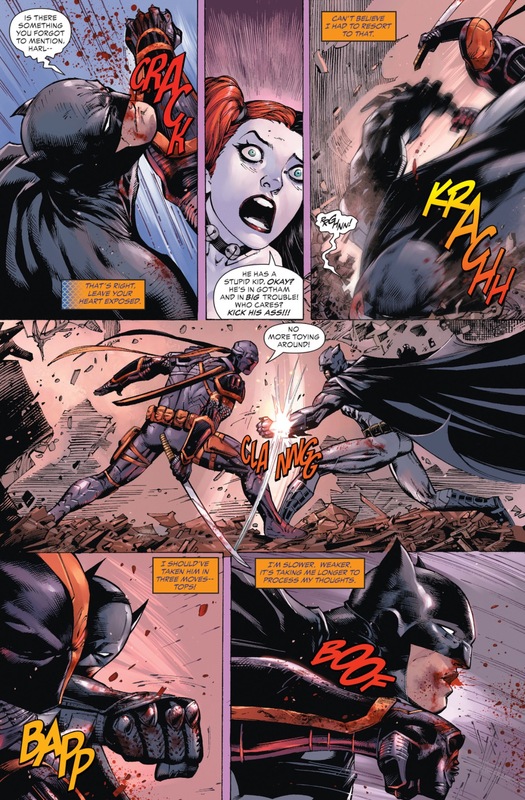 This entry was posted in Batman, DC Comics, Deathstroke, Harley Quinn, Versus and tagged batman, deathstroke, harley quinn on September 2, 2016 by lowbrowcomics. 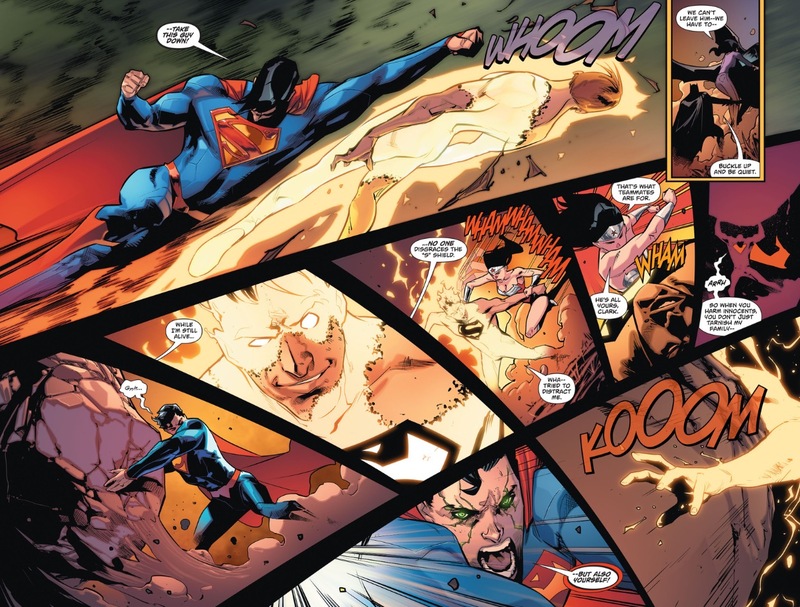 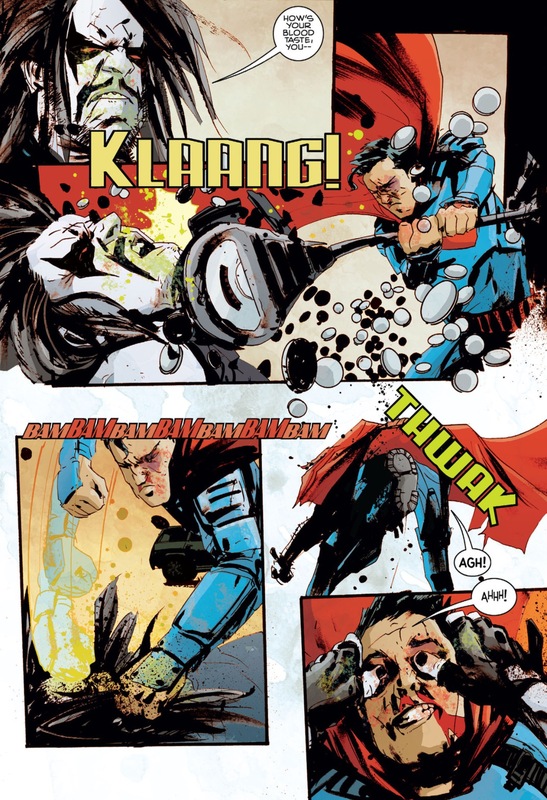 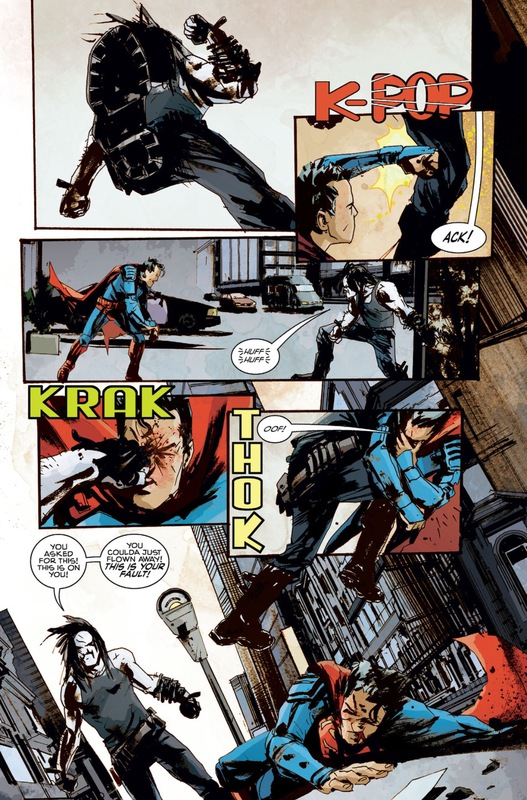 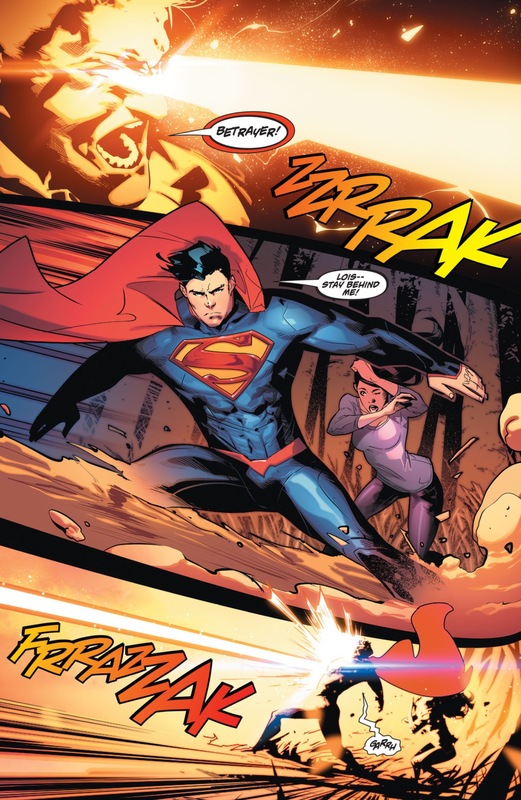 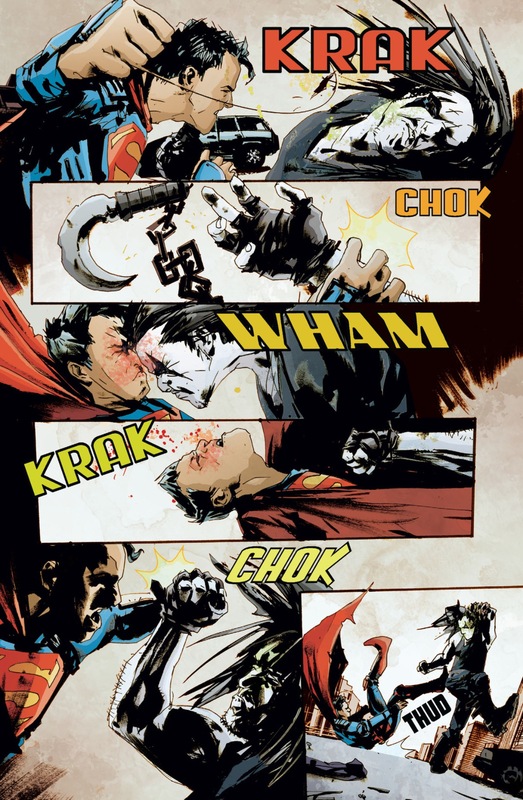 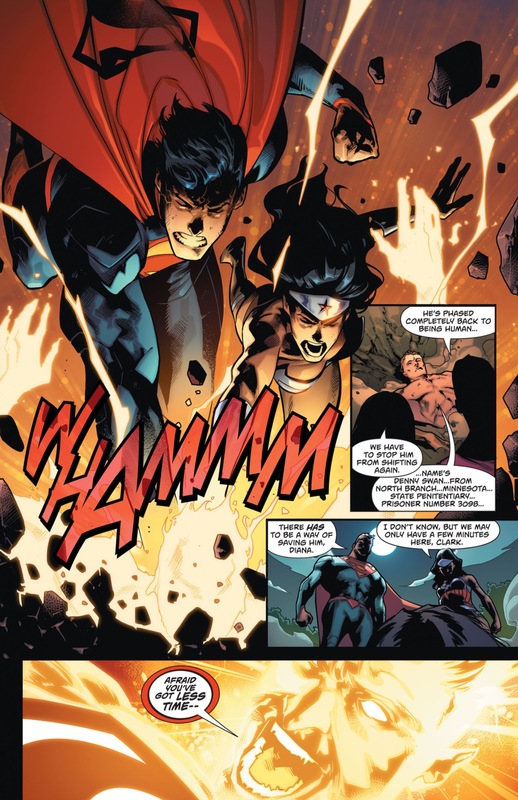 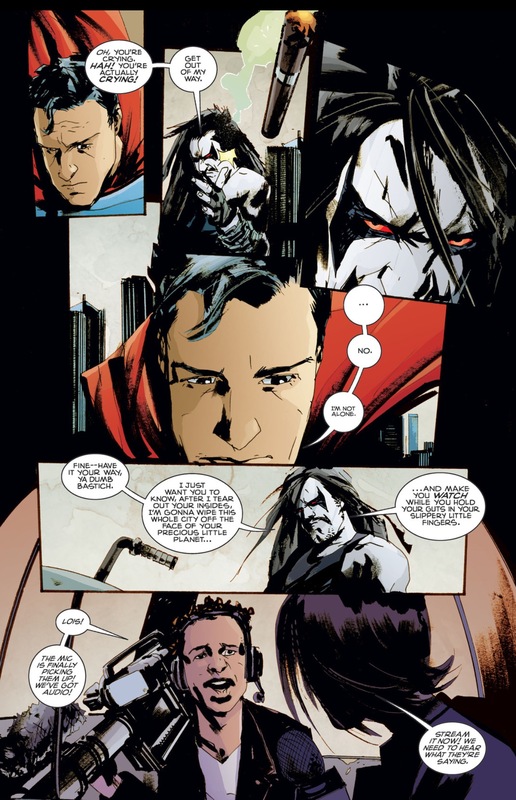 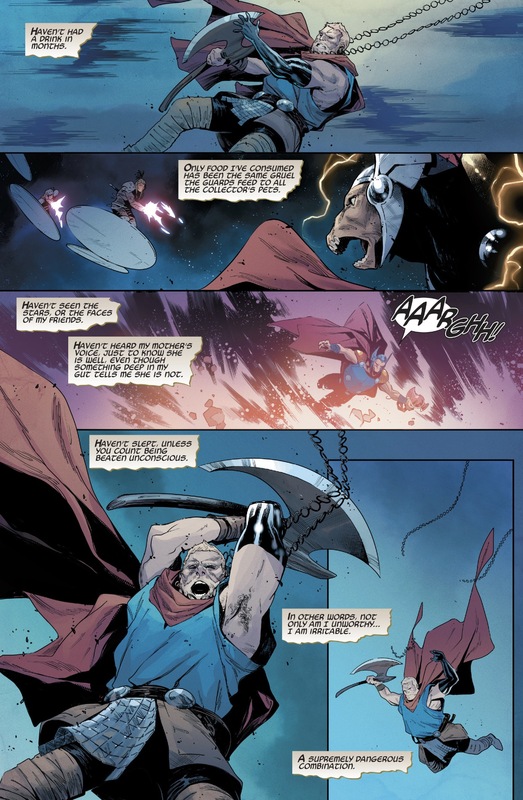 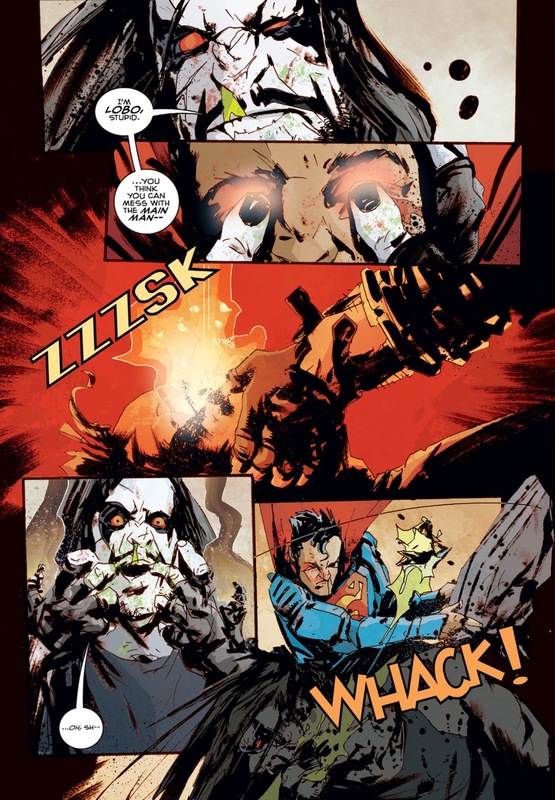 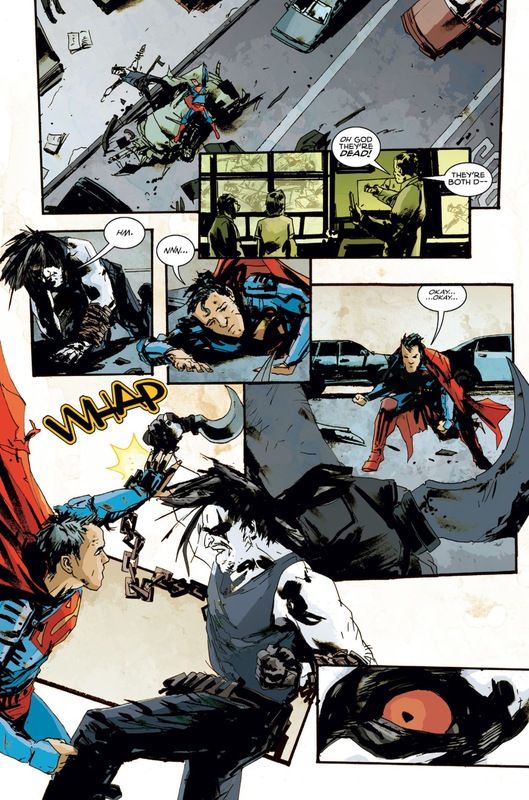 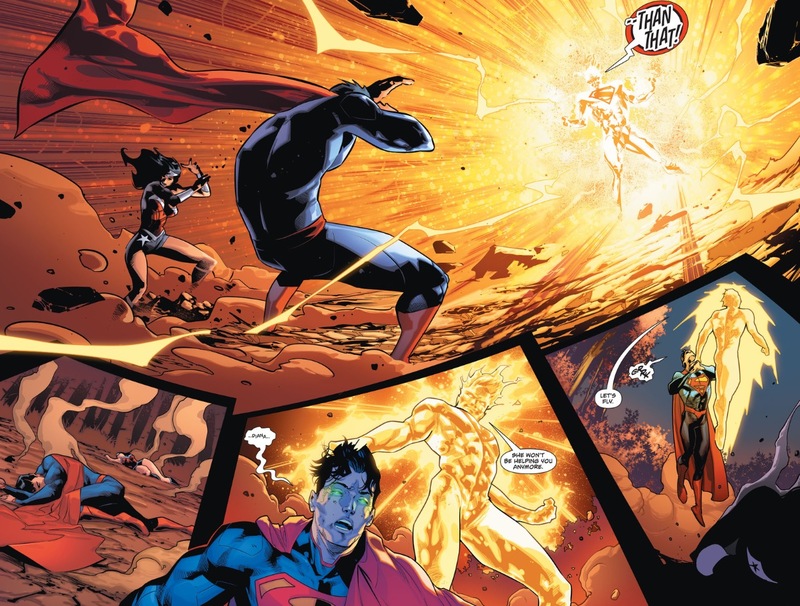 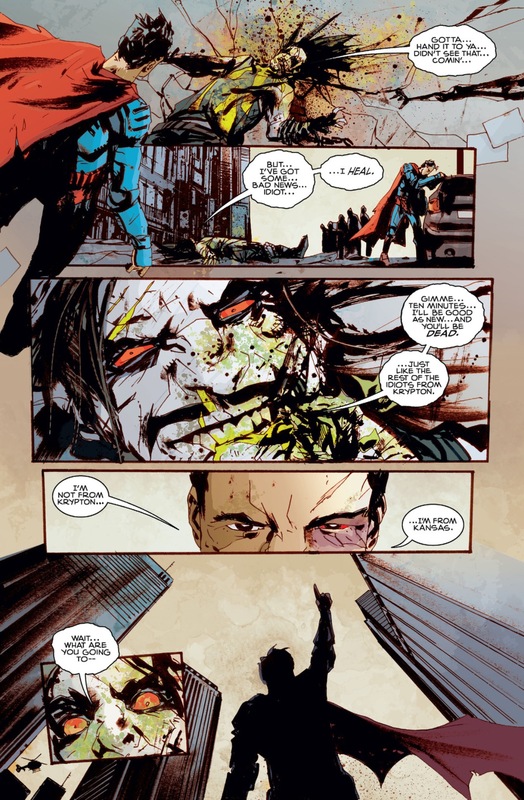 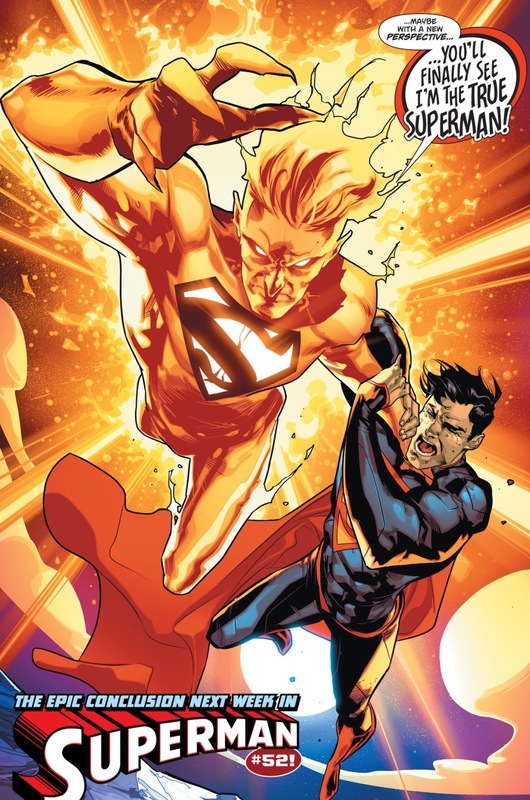 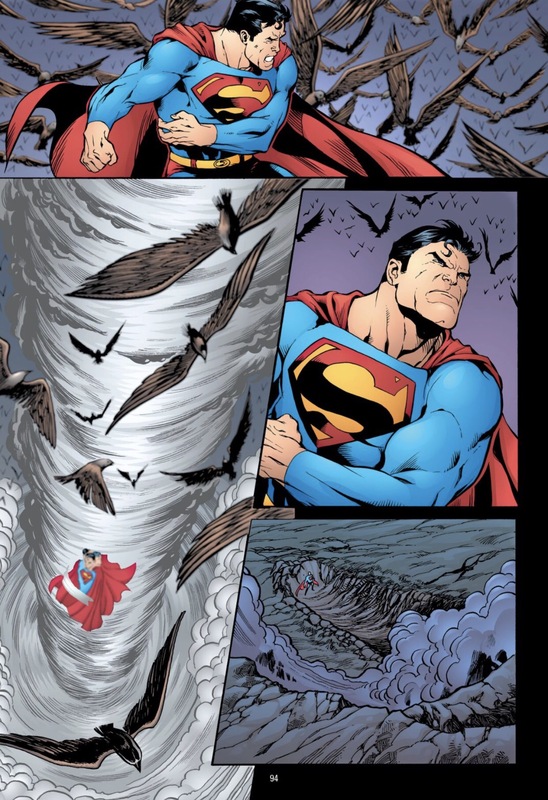 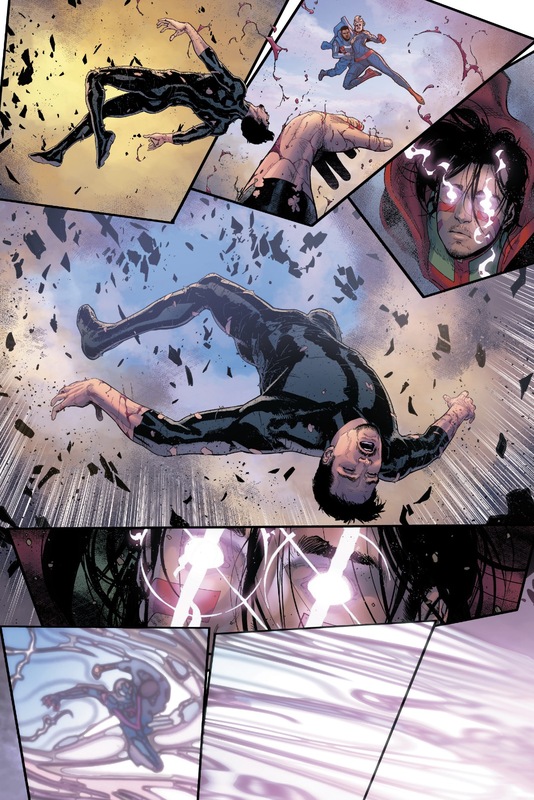 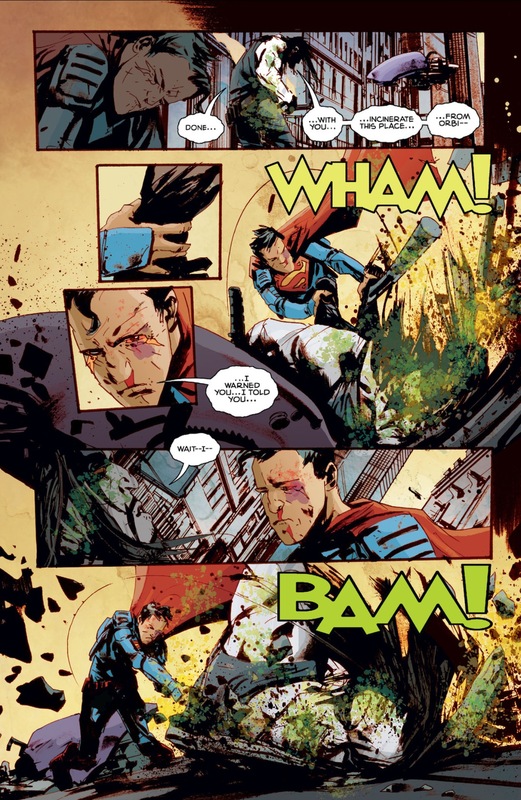 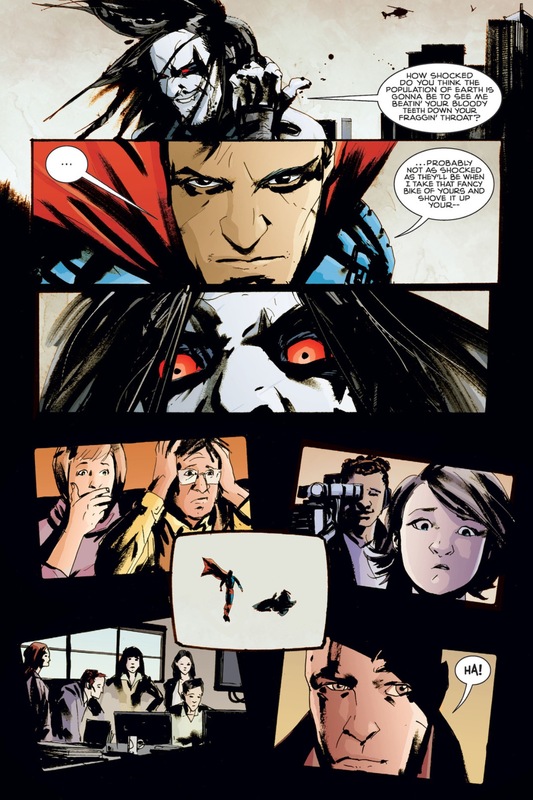 This entry was posted in DC Comics, Lobo, superman, Versus and tagged american alien, Jonathan Kent, lex luthor, Lobo, Martha Kent, superman on May 27, 2016 by lowbrowcomics. 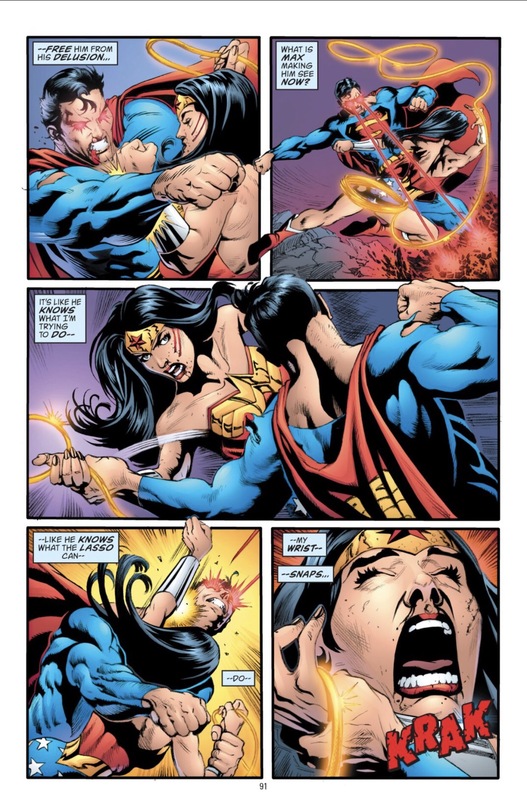 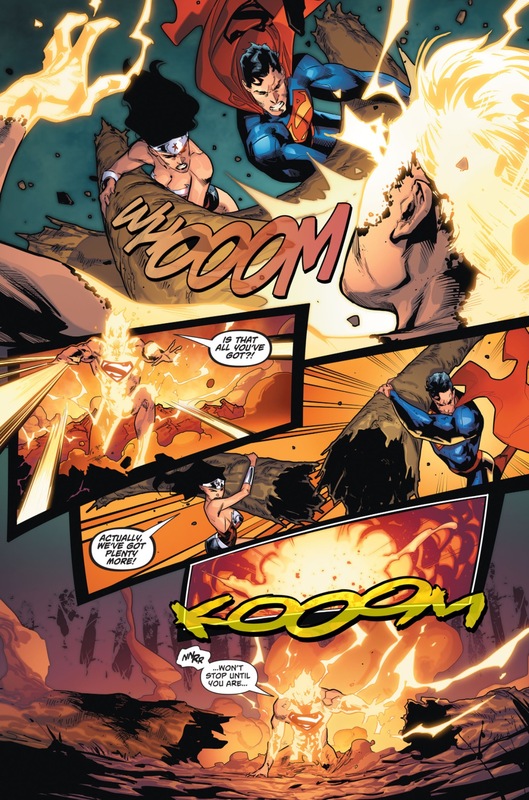 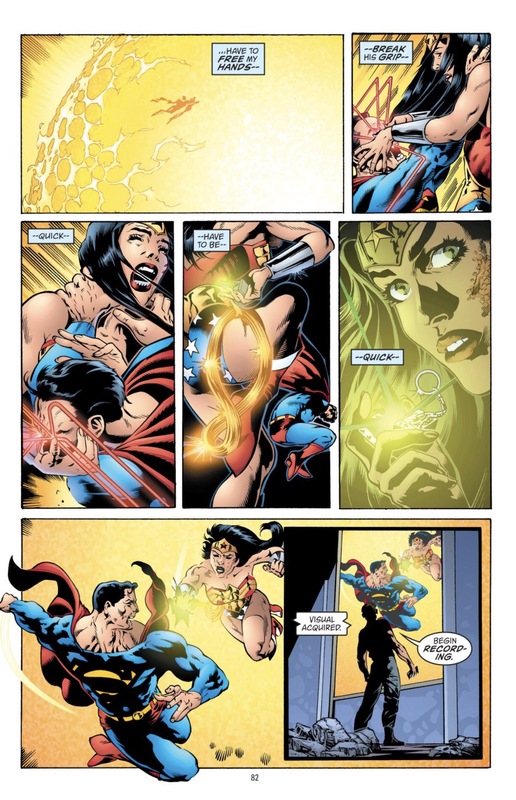 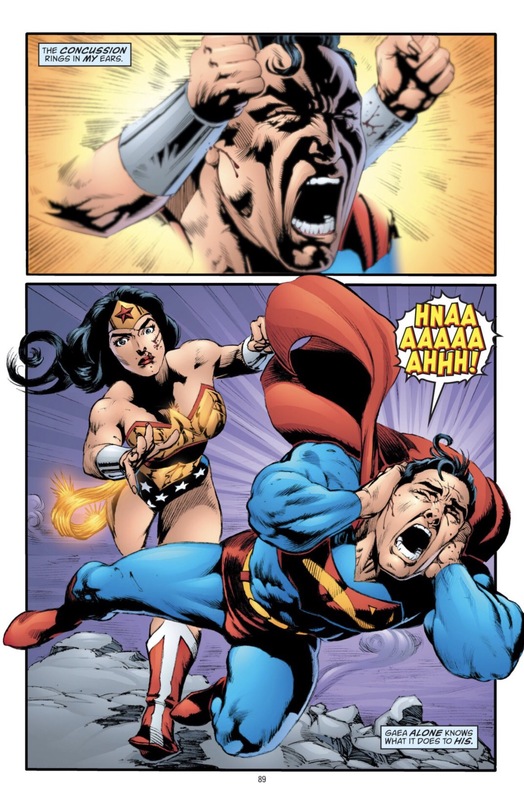 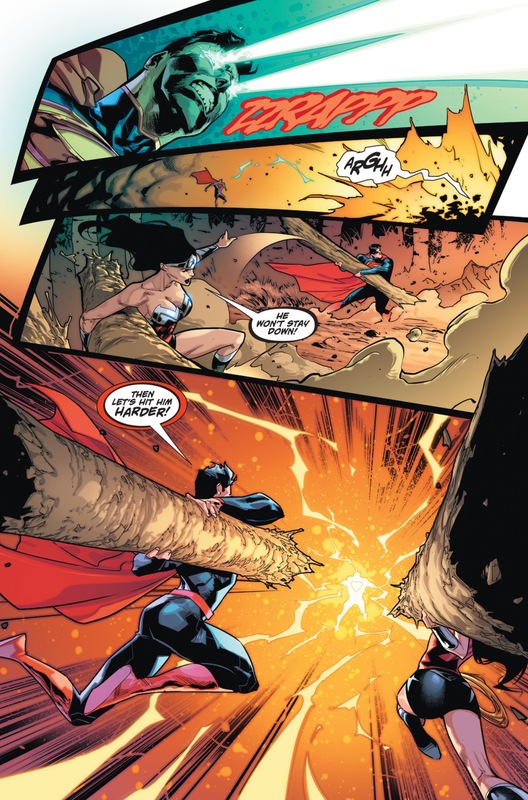 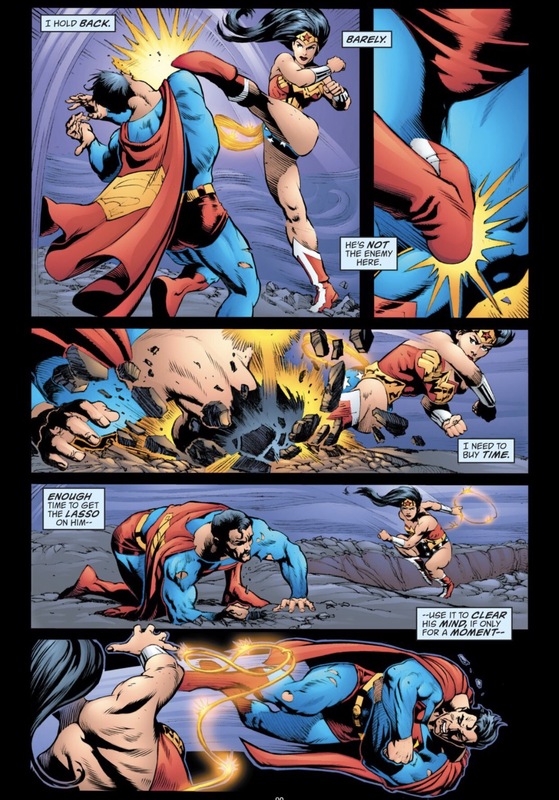 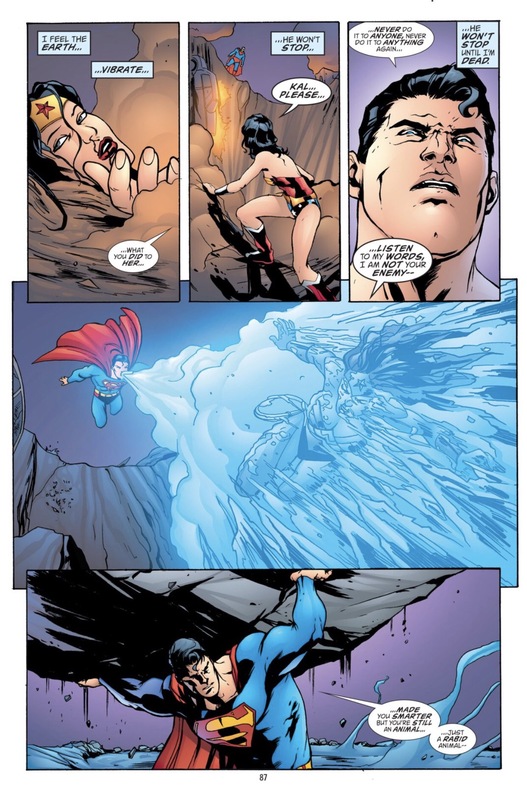 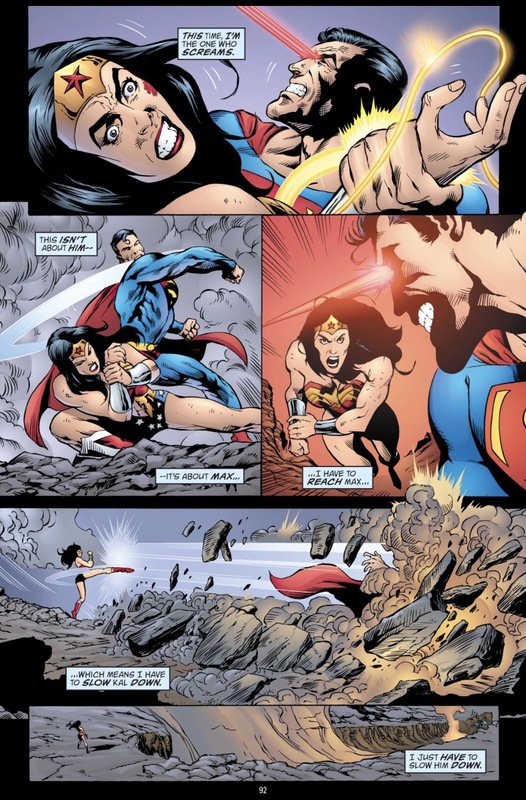 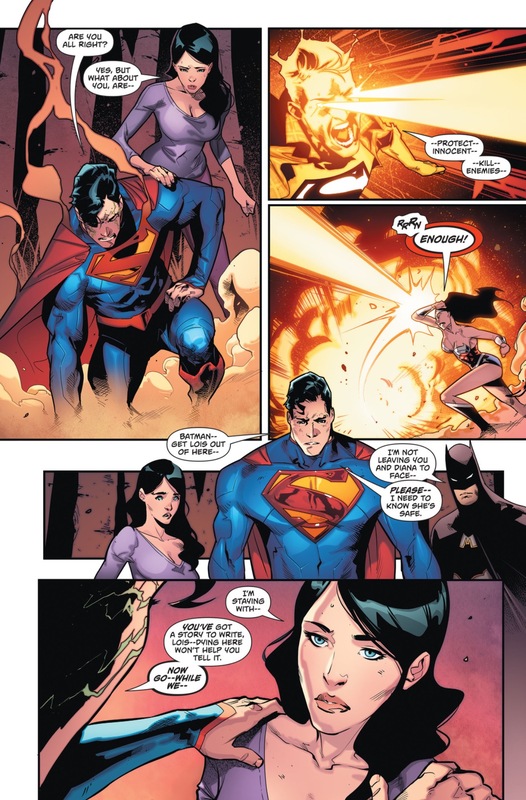 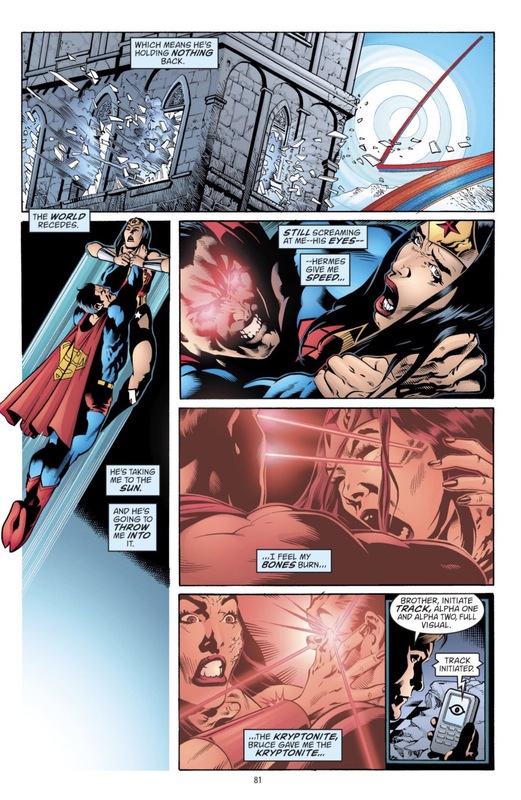 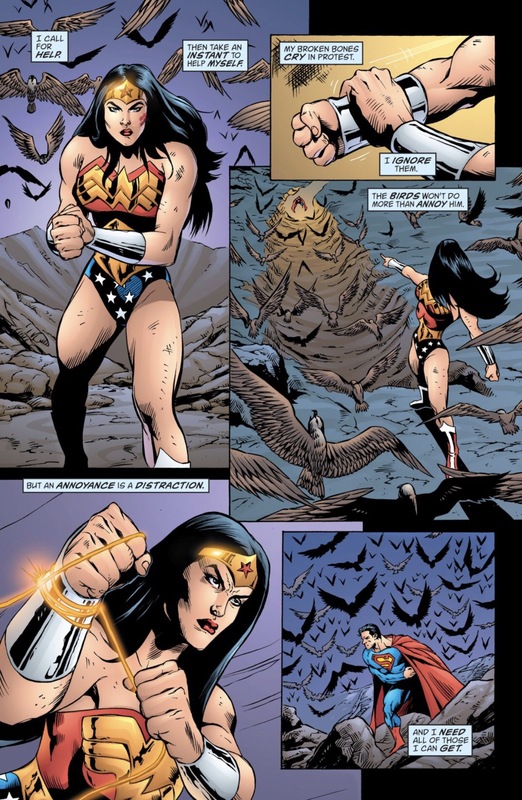 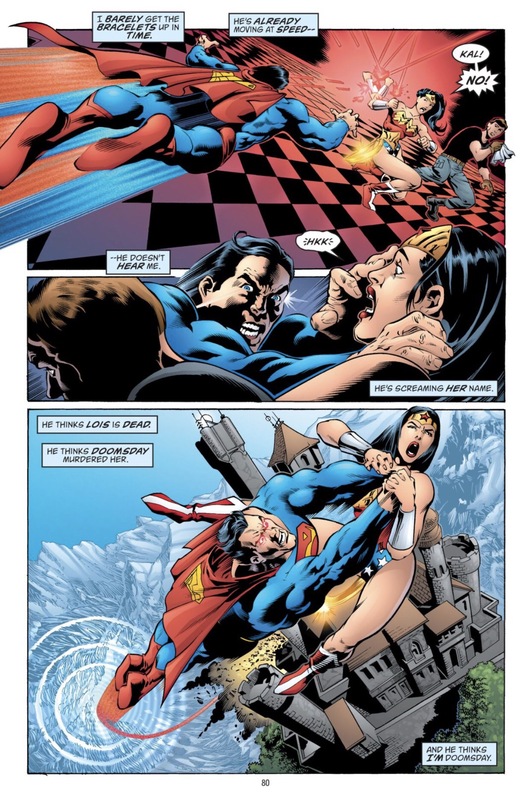 This entry was posted in Batman, DC Comics, superman, Versus, Wonder Woman and tagged batman, Final Days of Superman, lois lane, solar superman, superman, wonder woman on May 27, 2016 by lowbrowcomics. 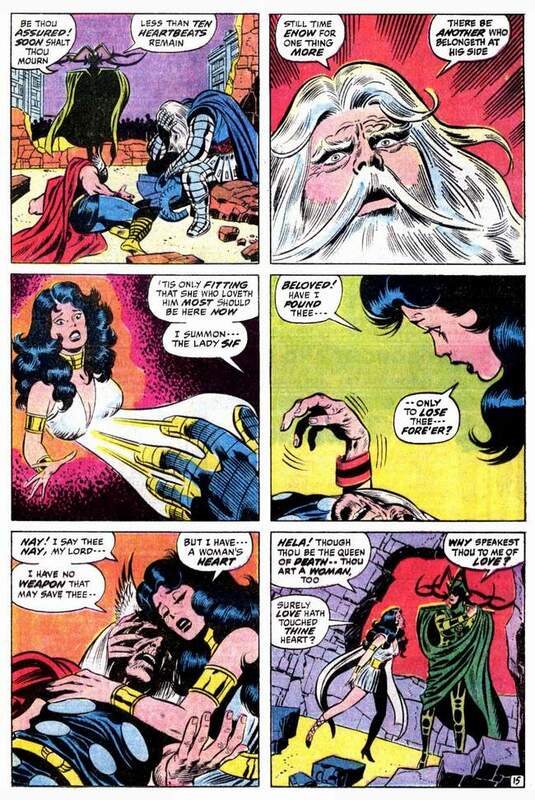 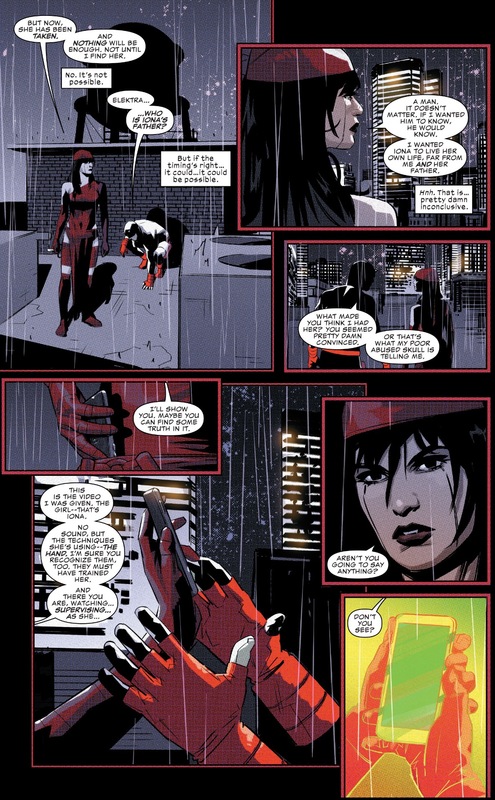 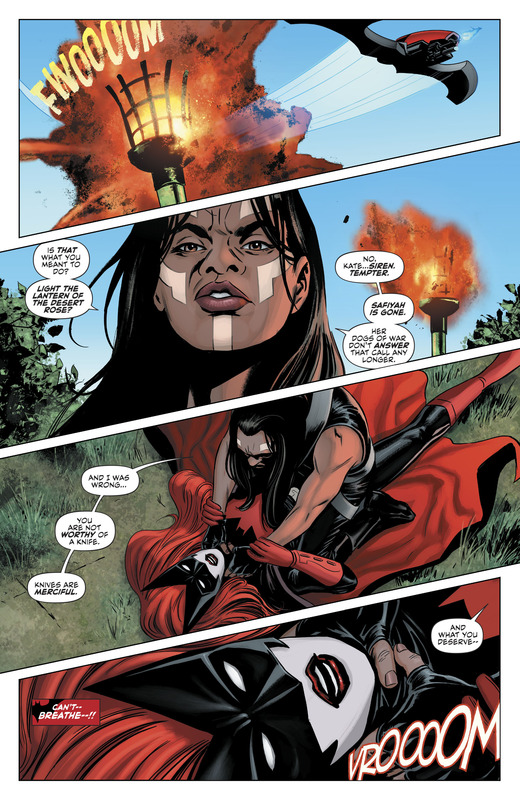 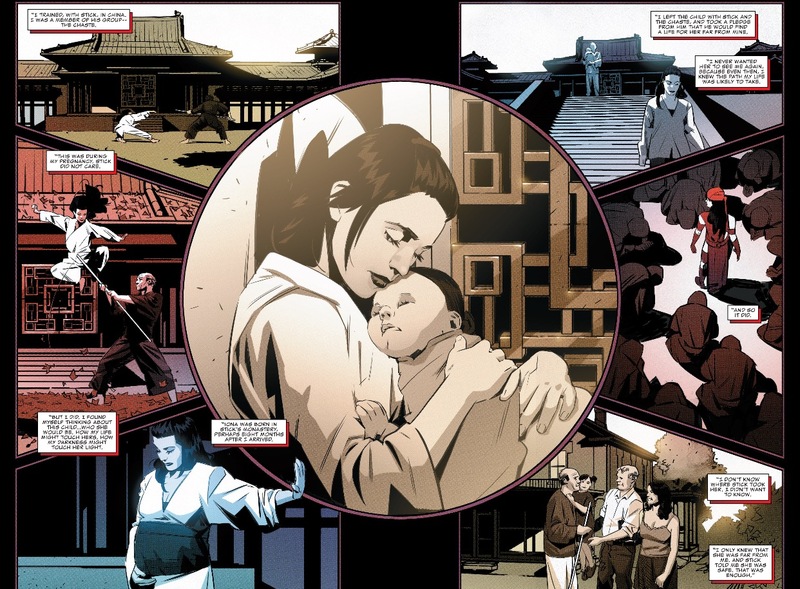 Elektra tells Daredevil about her daughter. 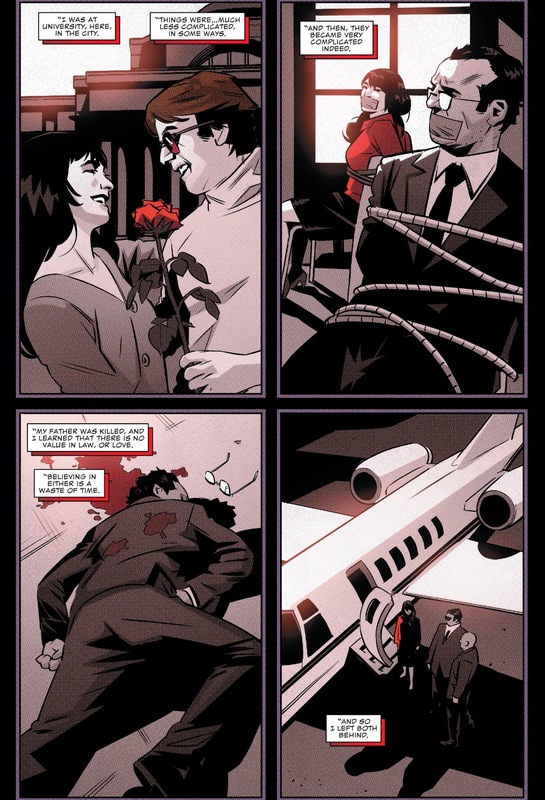 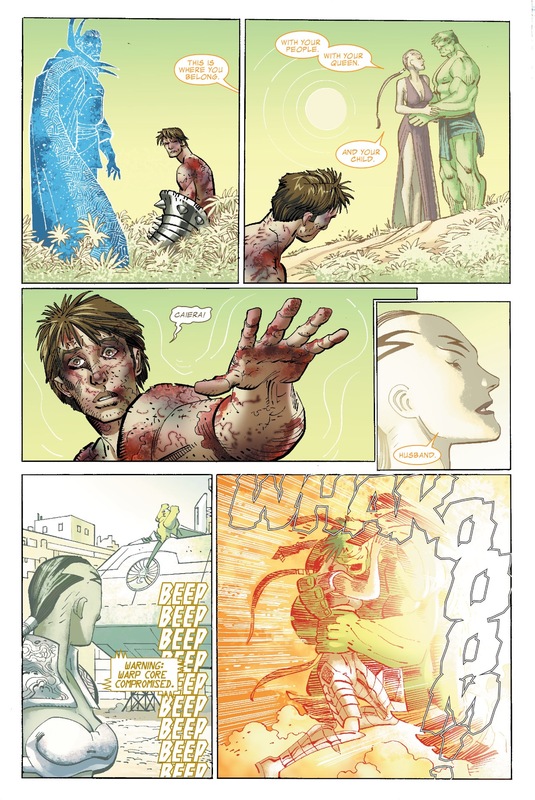 When Matt Murdock was a kid, he lost his sight in an accident involving a truck carrying radioactive chemicals. 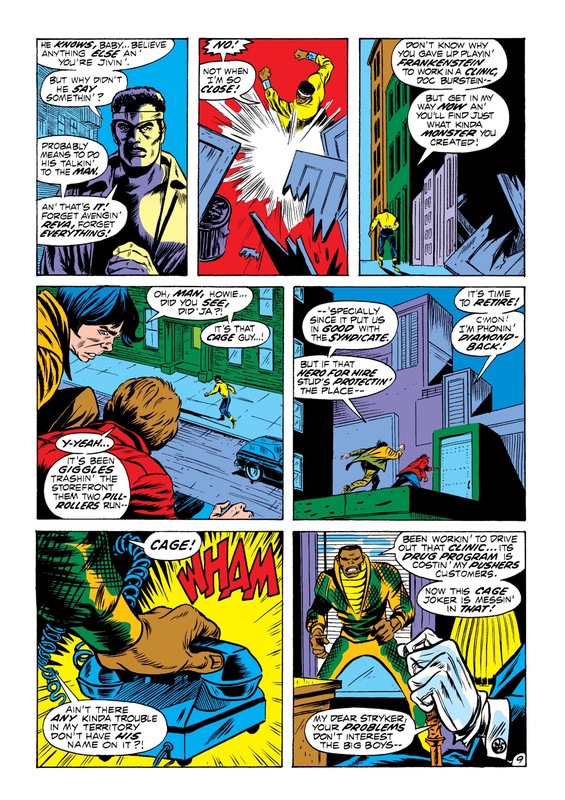 Though he could no longer see, the chemicals heightened Murdock’s other senses and imbued him with a 360-radar sense. 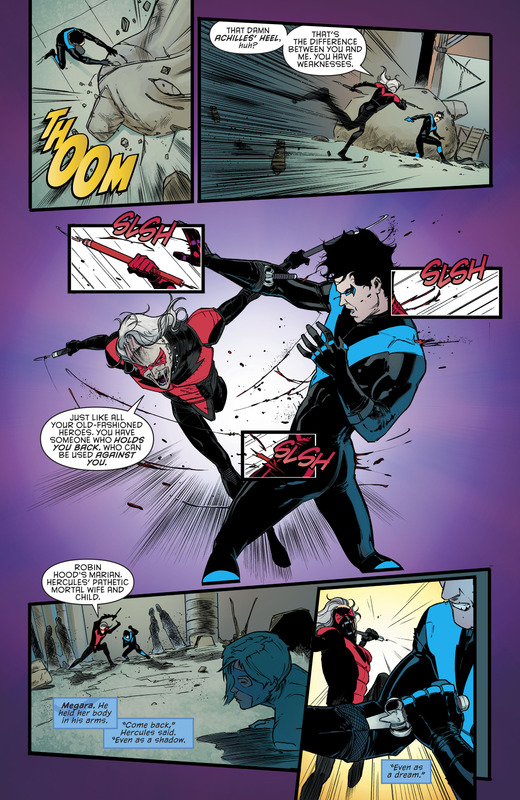 Now Matt uses his abilities to fight for his city. 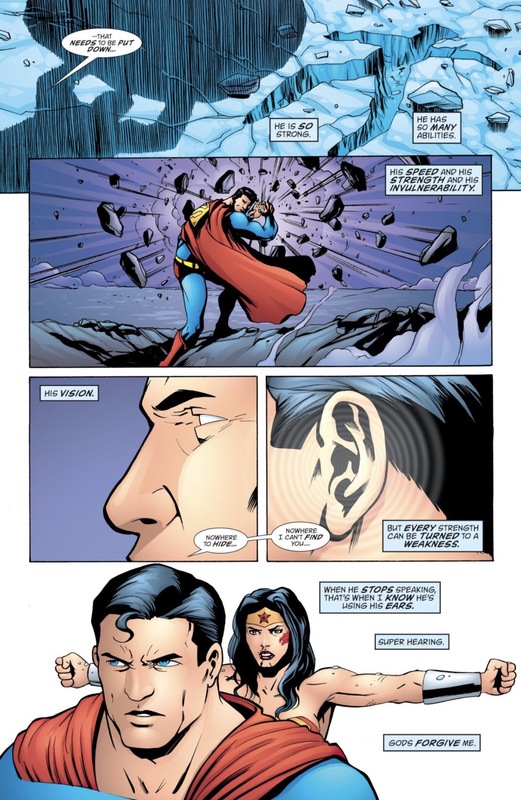 He is the MAN WITHOUT FEAR. 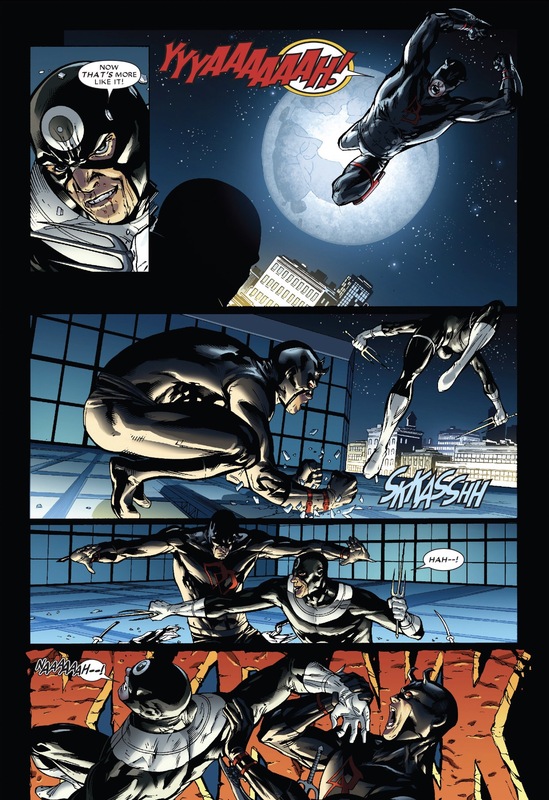 He is Daredevil. 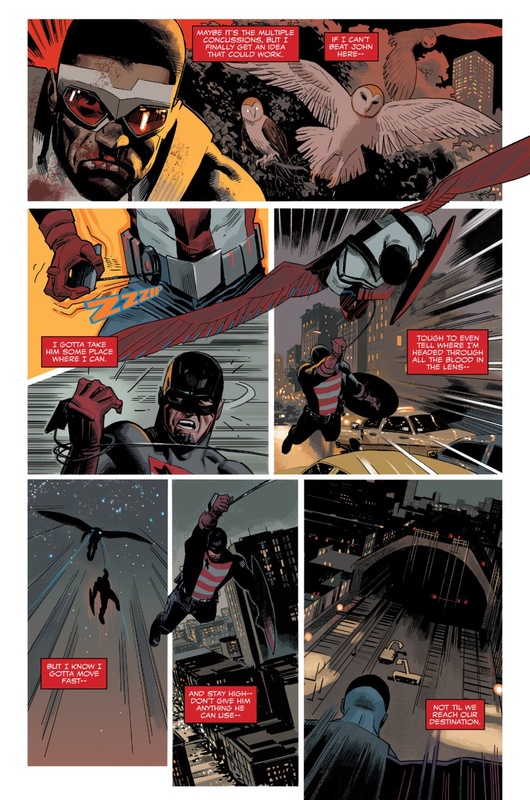 In the months since his return to New York, former defense attorney Matt Murdock has not only become a prosecutor for the city of New York, he’s also somehow managed to hide his dual identity and erase any prior public knowledge that he is in fact, Daredevil. 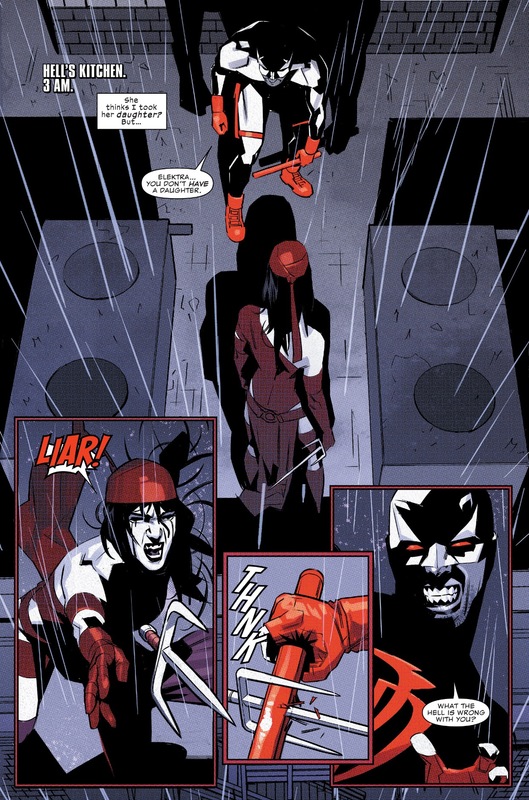 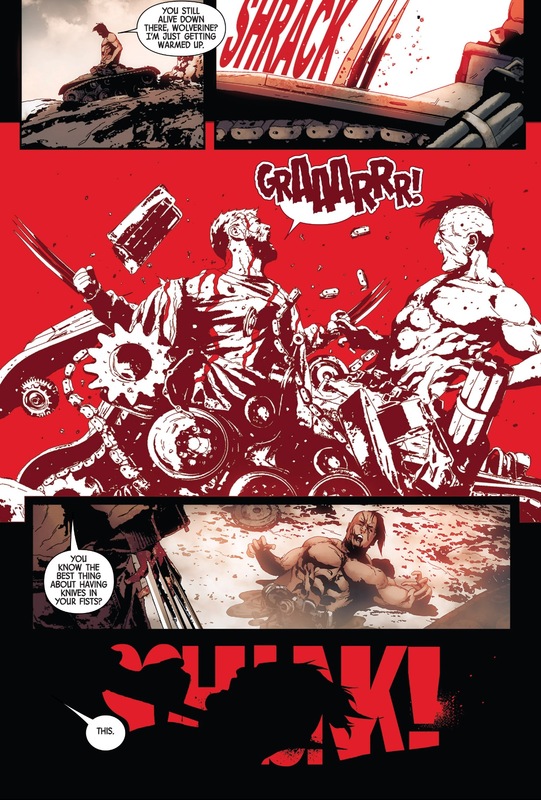 This entry was posted in Daredevil, elektra, Marvel Comics, Versus and tagged daredevil, elektra, hell's kitchen on May 27, 2016 by lowbrowcomics.